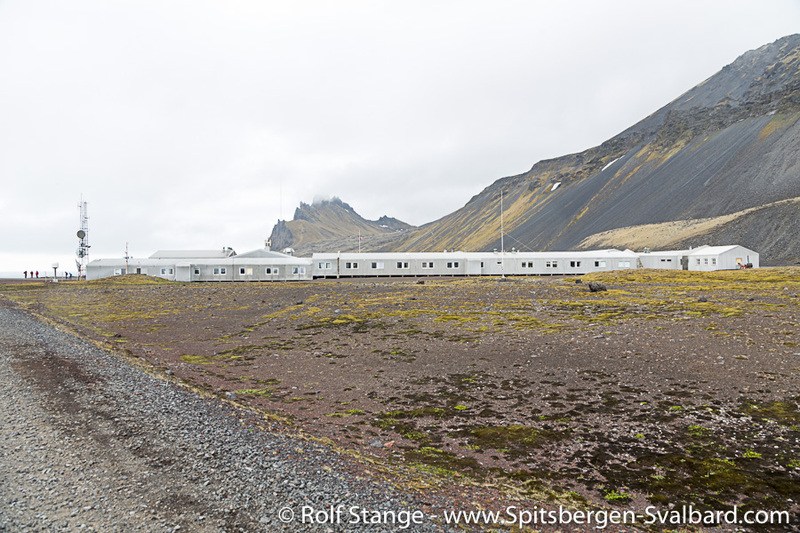 We can’t ignore it anymore, today is the day to put Basecamp down and to say goodbye to Jan Mayen. At least, we have got good weather, which makes everything much simpler and more pleasant. Weather rules everything here! 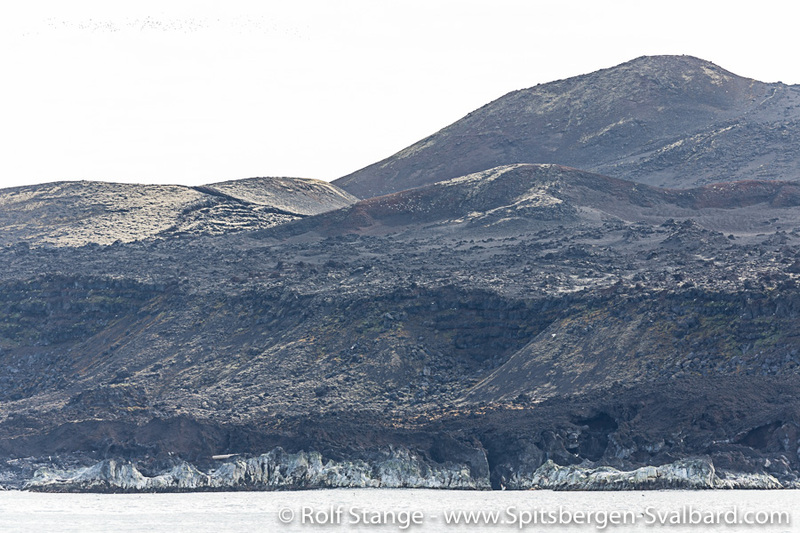 And we still have got time to sail around Jan Mayen. 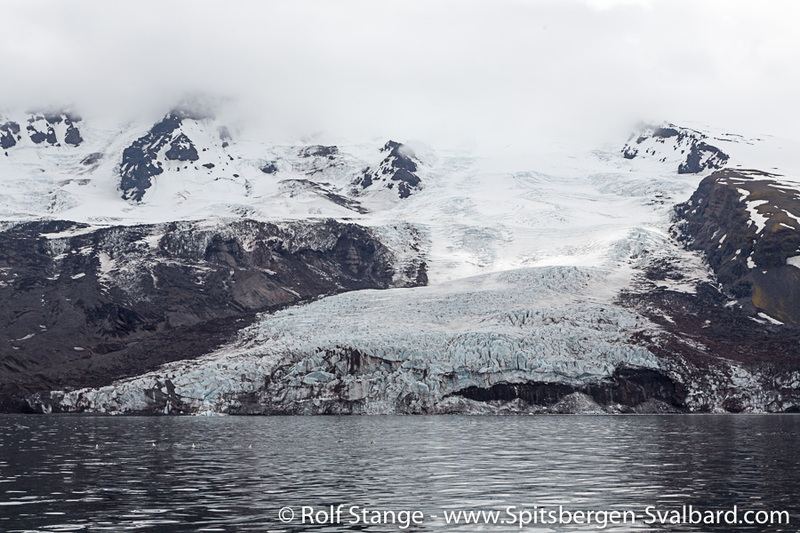 The mighty Beerenberg is greeting us several times by showing its white crown through holes in the clouds, then we pass Weyprechtbreen and the other glaciers which are reaching the shore on the northern side. 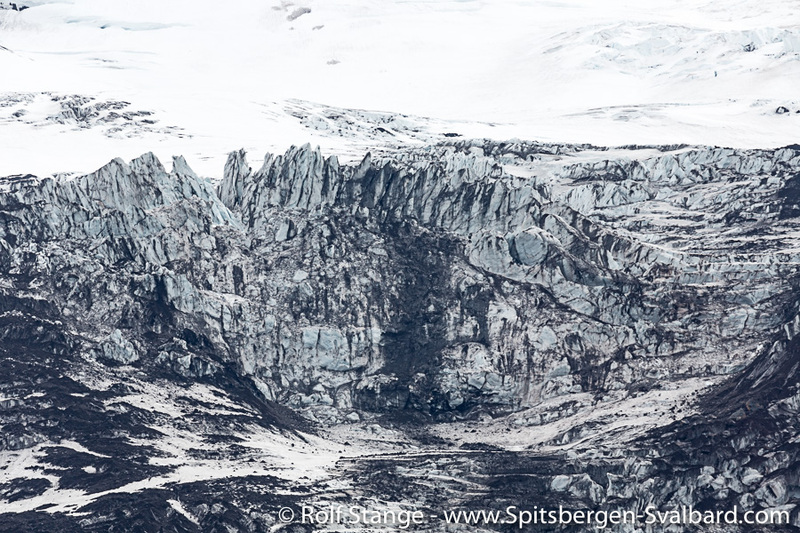 Quite impressive, as they come kreeping down the slopes of Beerenberg, wildly crevassed, frozen rivers of broken blocks of ice. Then we are back at sea. 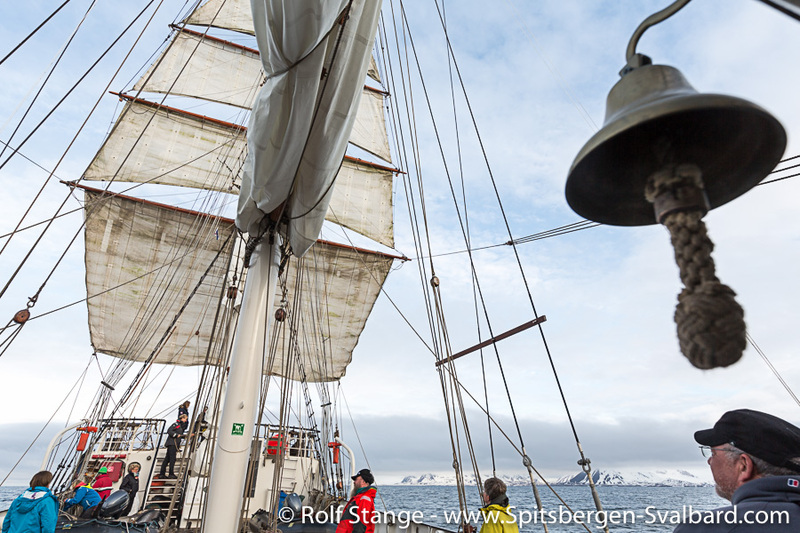 Three days sailing back to Iceland. 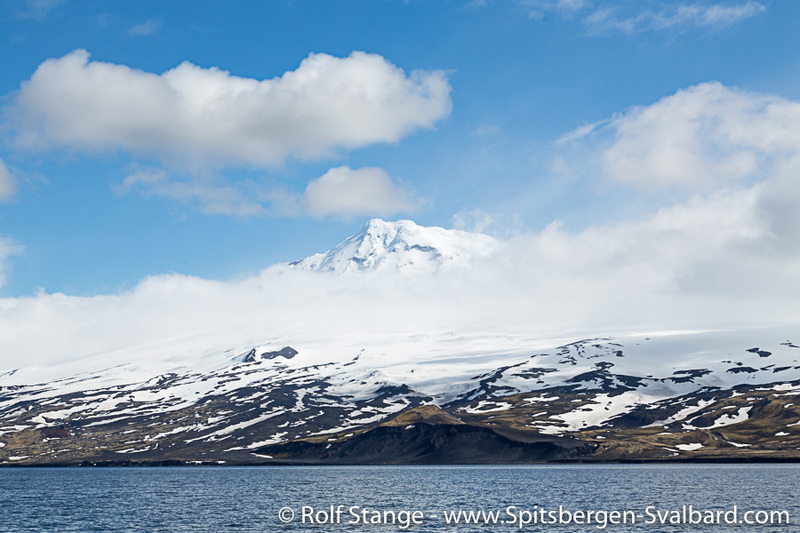 A station visit is almost mandatory when you are on Jan Mayen, but strictly by invitation only. We have got our invitation for today 1300 Norwegian time (1100 Icelandic time = our time). So breakfast on time and we head off with discipline as scheduled. We need two hours to walk along the road, 8 km long, to the station. 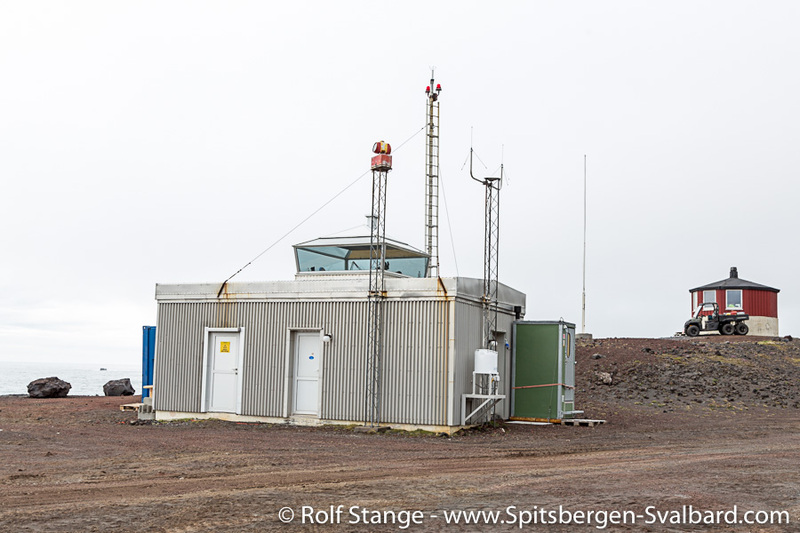 On the way, we are passing various important bits and pieces of the local infrastructure: Jan Mayen International Airport (just a simple runway), the weather station (1-2 km north of the actual station) and, of course, various specimens of the local forest of traffic signs, which are mostly reflecting the specific sense of humour on such a place rather than regulatory needs of dense traffic. 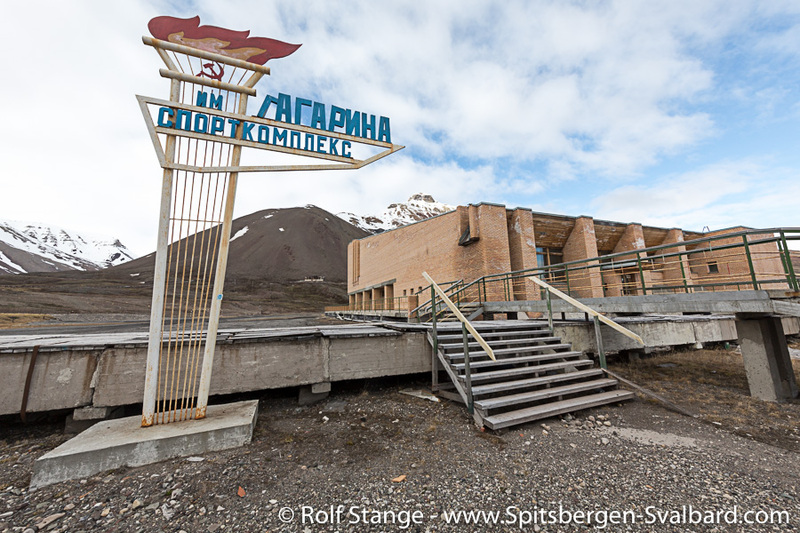 On the station, we are allowed to enjoy the hospitality with its various, typical aspects for some hours: pleasant stay in a rather zivilised venue, curious looks and photos in public areas as are made accessible to us and – the highlight – an intense shopping session in the souvenir shop. Our curious questions are also answered. As it is time to take off again, the sun is shining and the day is still long. When, if not now, do I have the chance to explore the terrain south of the station? 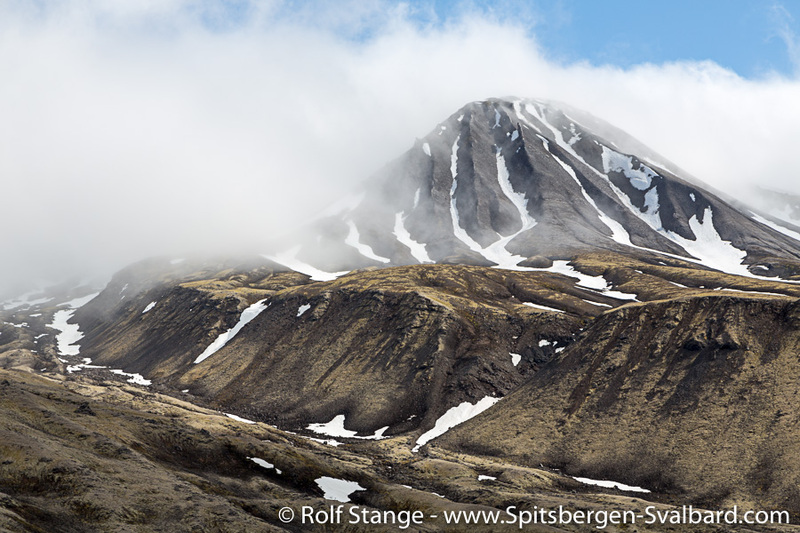 This part of Jan Mayen does have a lot to offer: starting in Borgdalen, which I came down quite recently but without seeing anything due to the dense fog, so I saw nothing of the sharp mountain ridge Schiertzegga. Green, wide areas, almost like meadows, are stretching in lower Blinddalen, before some hefty ascents lead up to Flykollen above Kapp Wien. 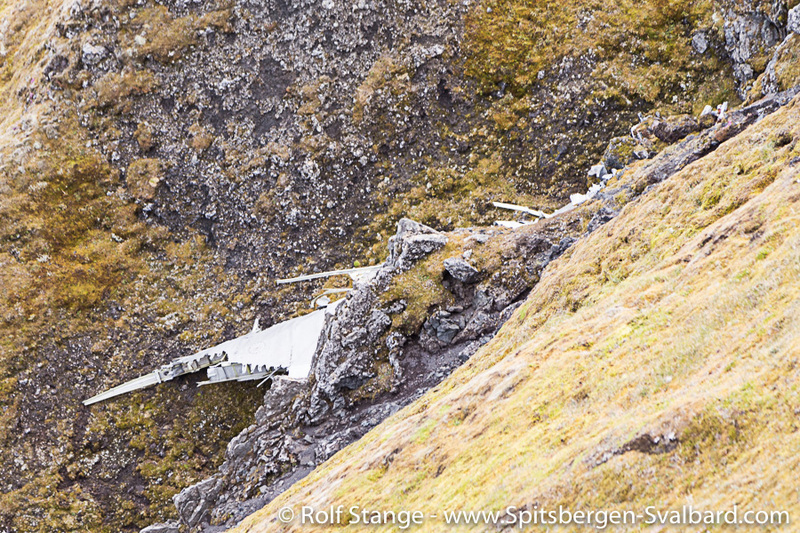 There, a German weather reconnoissance plane crashed into a steep slope in July 1942. All four crew members died. 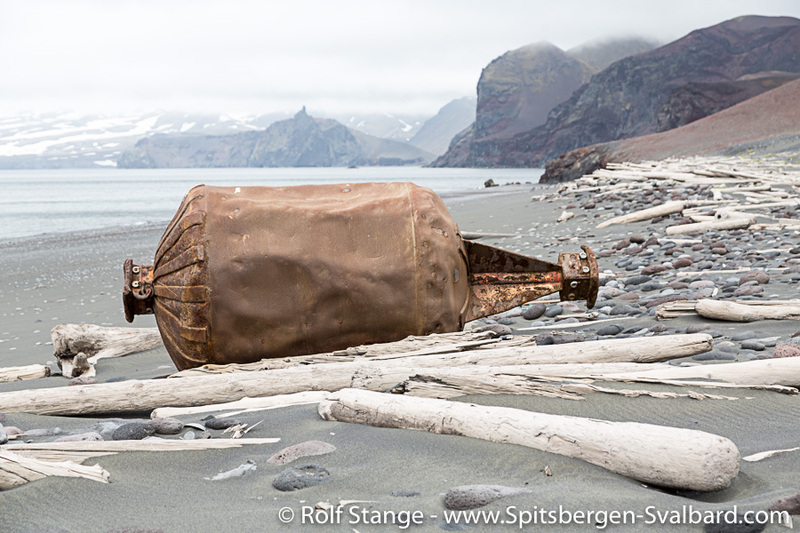 The wreck is still there, as one out of two WWII aircraft wrecks on Jan Mayen. 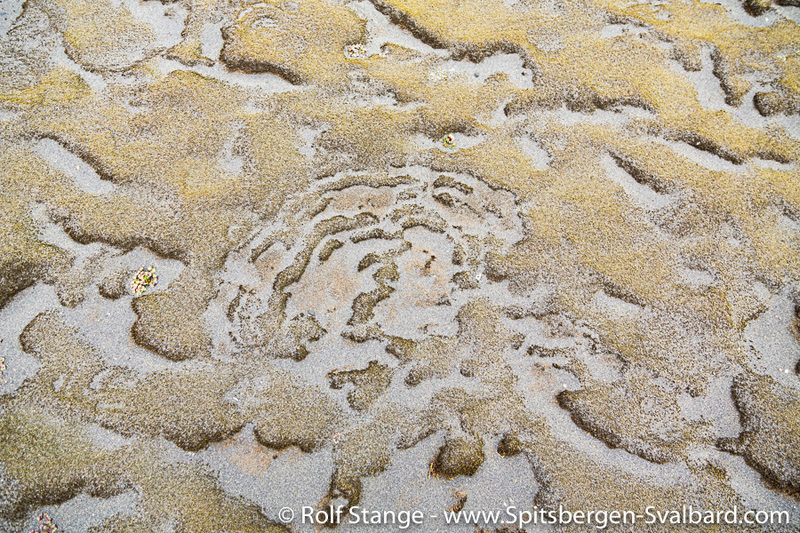 The other one, at Danielsenkrateret near the northern lagoon, is quite easily accessible, in comparison at least. You can’t say that this one is easy to get to. For a while already, I have been climbing up a steep slope, asking myself permanently how far I was actually willing to go. 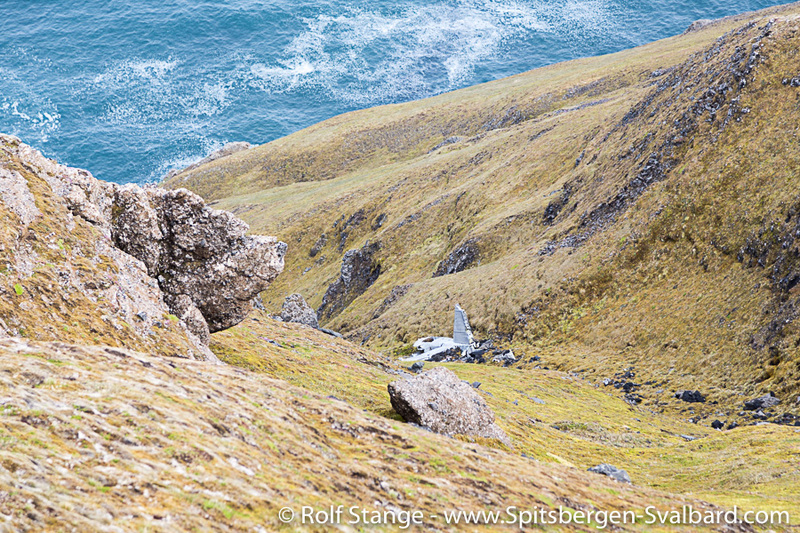 Behind a little ridge, the view is opening into a steep ravine, and there it is, the plane wreck, in several parts. A wing here, the main body there. 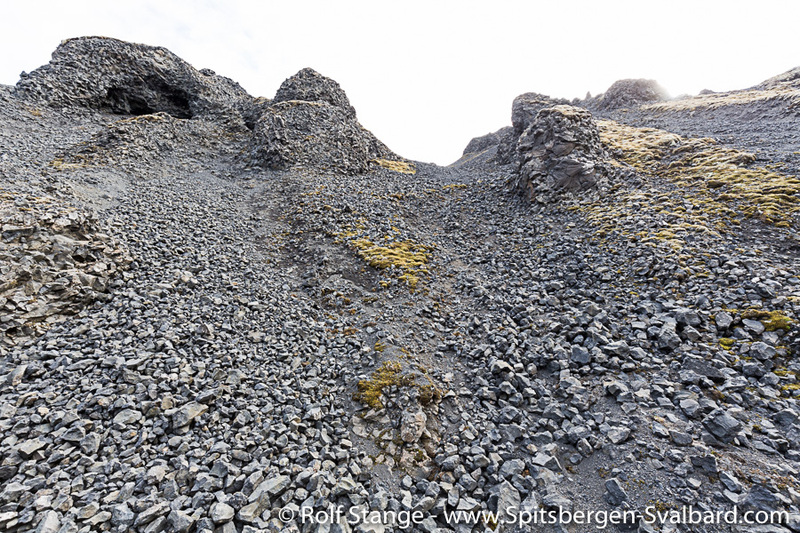 The terrain is too steep for me, I don’t want to go down here, being on my own and without any rope or other safety. I have seen enough, after a couple of photos I turn back. 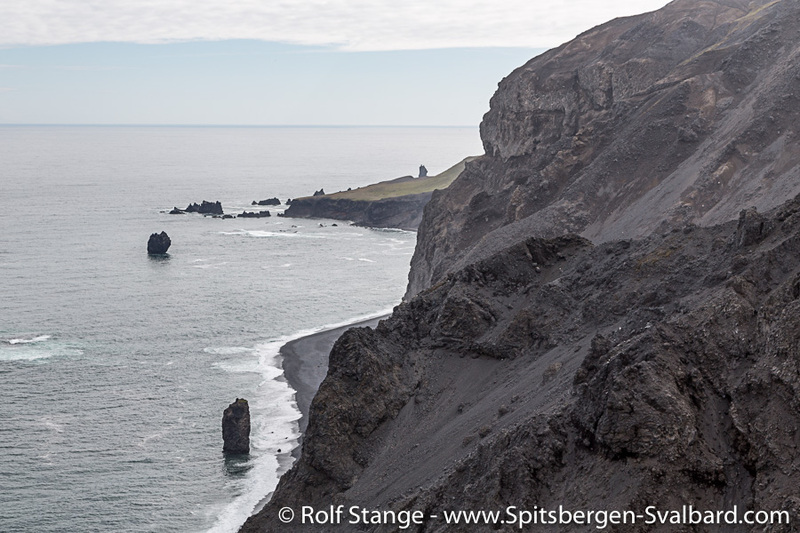 As so often, the tour finishes with some long, tough kilometres on the road back to Kvalrossbukta, amounting to a total of 30 kilometres in the end for today. 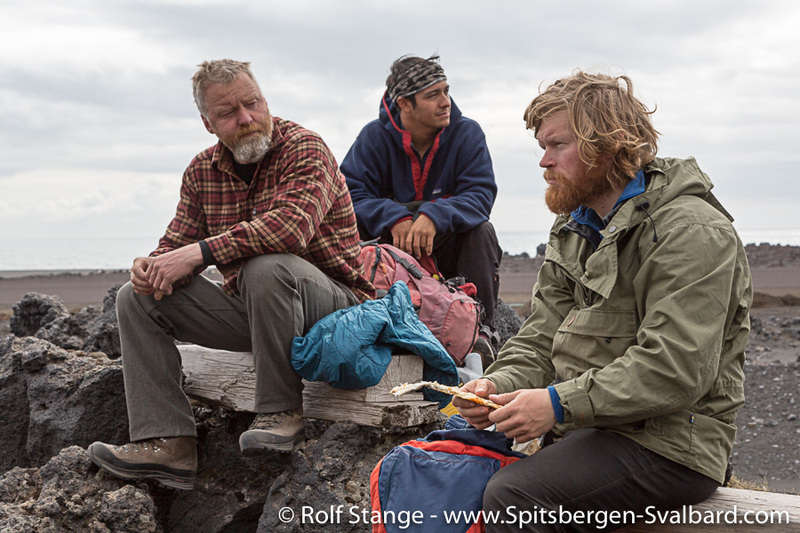 As I come back to the basecamp, I find the others gathered around a cosy camp fire. Spirits are excellent, everybody has stories about the day to tell. The return to basecamp last night was great, everybody had stories to tell around a big casserole of Icelandic lamb stew. 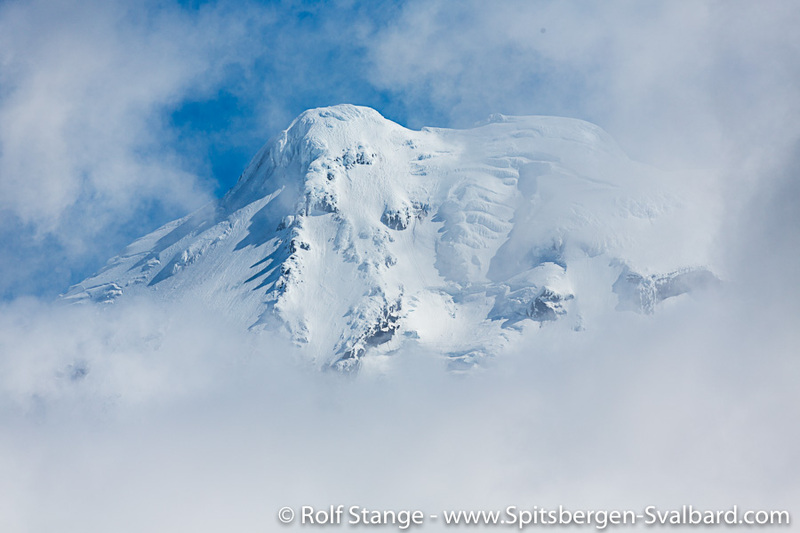 Anneli and Martin have reached the peak of Beerenberg together with mountain guide Magnus. Well done, congratulations! 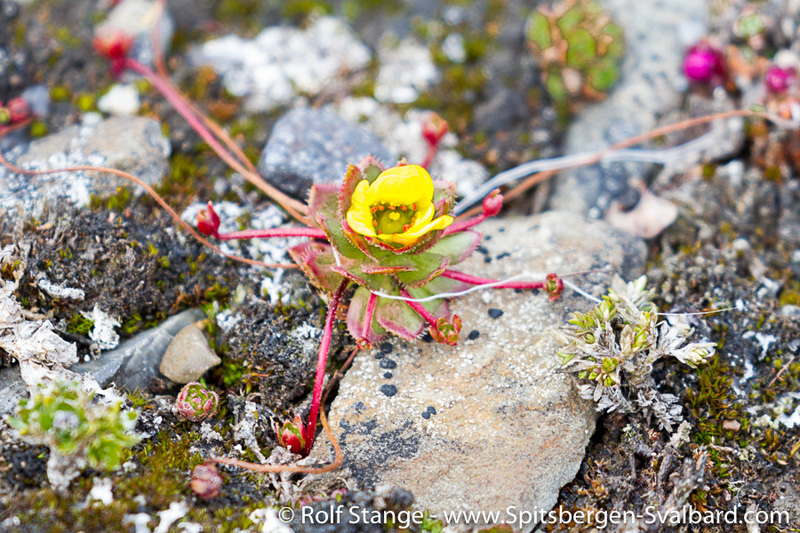 Beyond this, everybody has explored the north extensively with most of the sites of interest over there. And as I came now stumbling back into the mess tent as the last mohican, everybody wanted to know what I had seen and experienced in the south. After the many kilometres of the last days, my lower half demanded a calmer day. Initially I took the luxury of just being lazy for a couple of hours, before I put a little daypack together for a good beach walk. 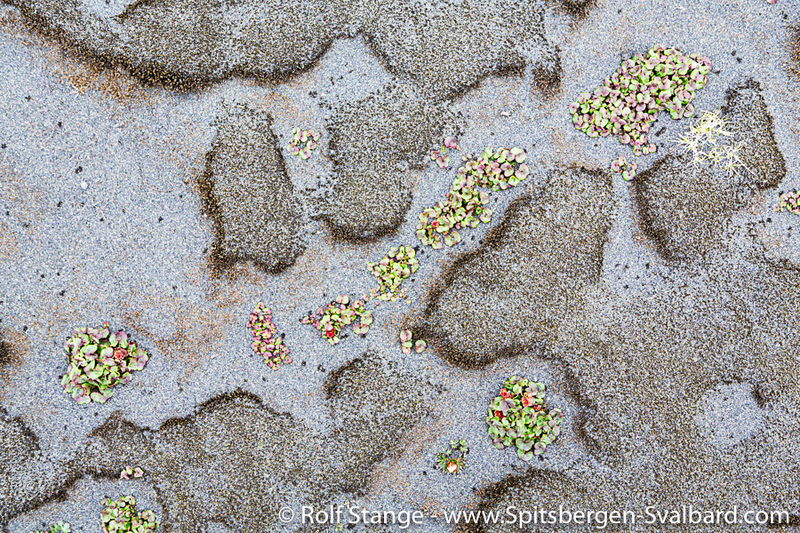 Walking along Haugenstranda to its end had been on my wishlist for a long time. 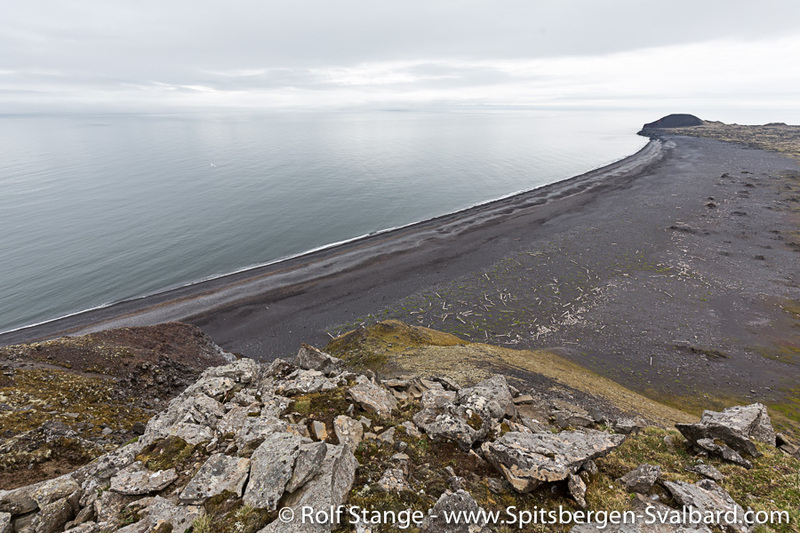 It is stretching for 3 kilometres northeast from Kvalrossen, initially being very wide, getting narrower further north. 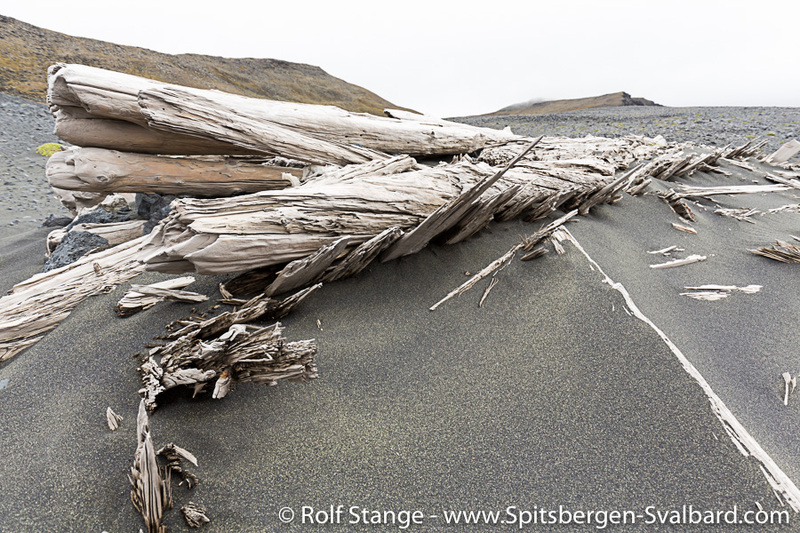 It is covered with immense amounts of driftwood, something that is always interesting. Slowly I walk between the various bits and pieces, wondering where they may have come from. 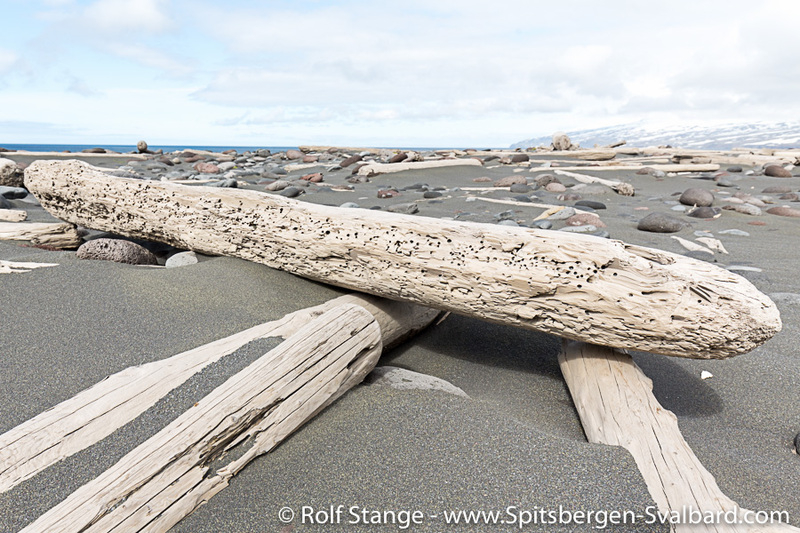 As in Spitsbergen, most of the logs are cut, only a few have roots. 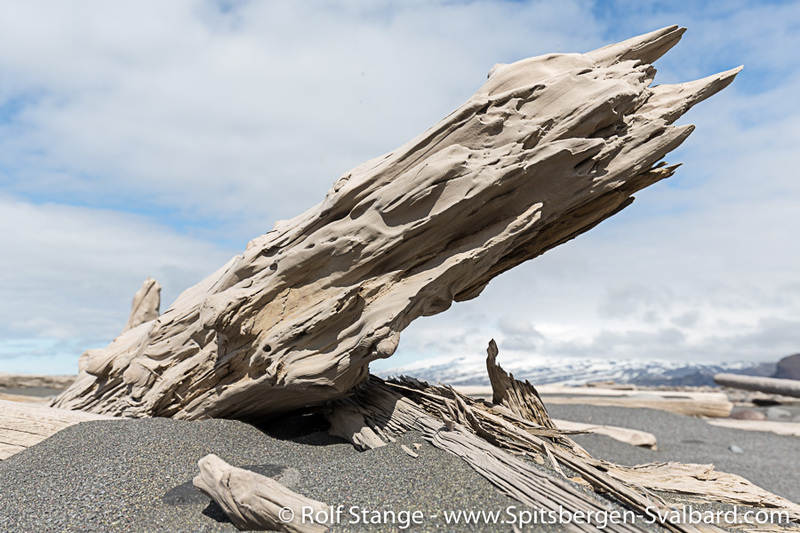 Also the Jan Mayen driftwood has mostly made the long drift from Siberia across the Arctic Ocean. 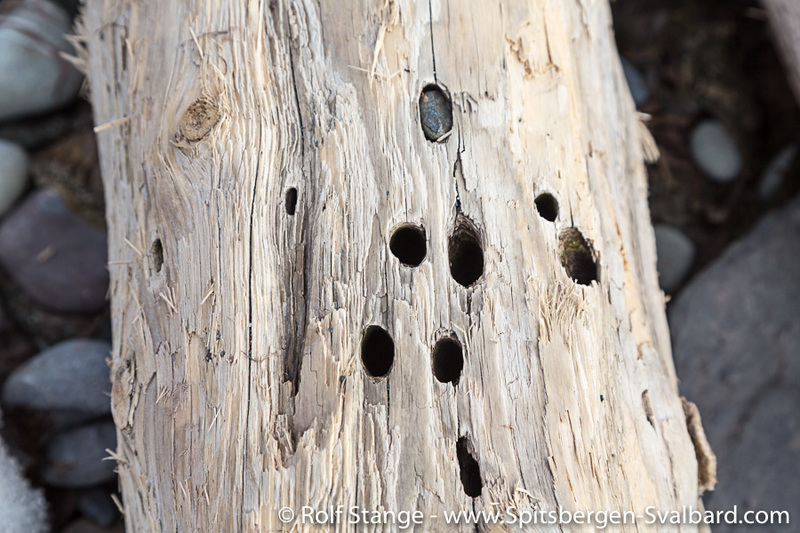 Only in a few cases, larger holes of boreworms indicate an origin in more temperate waters. 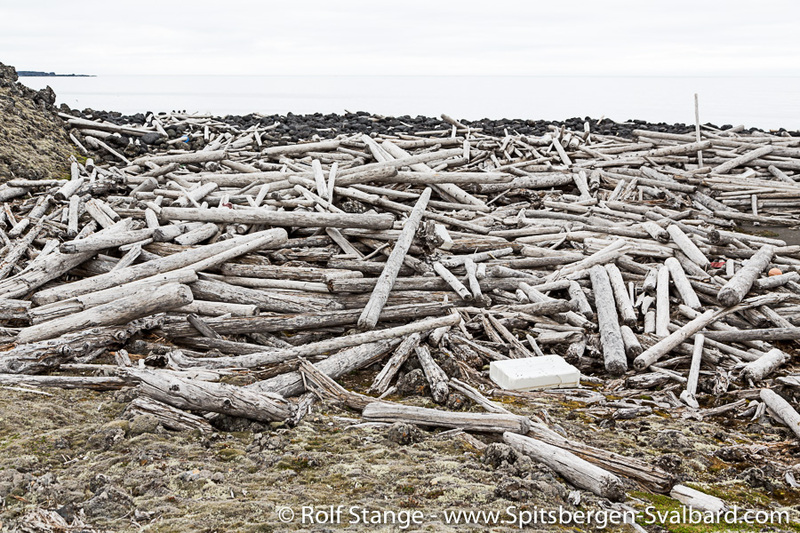 Unfortunately, the unavoidable plastic trash is to be found also here in volumes. 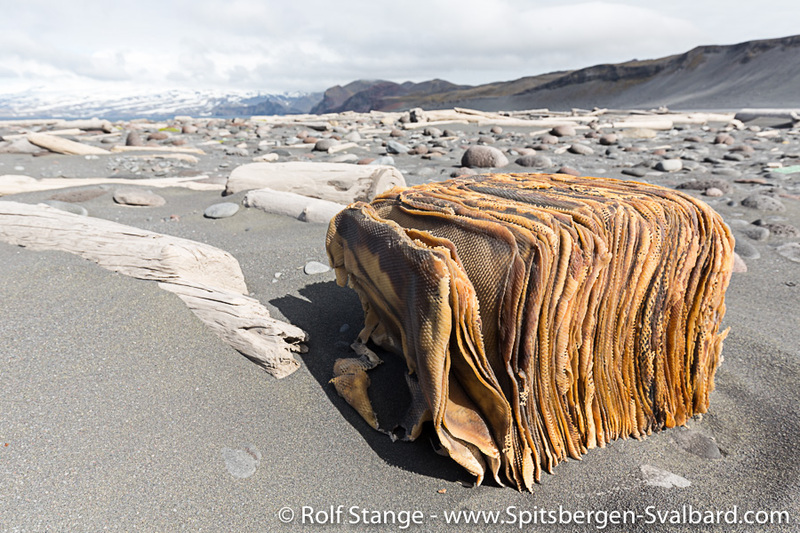 Largely items from the fishing industry, but a lot of weird stuff as well, from hygiene articles over shoes to objects that I can not identify. 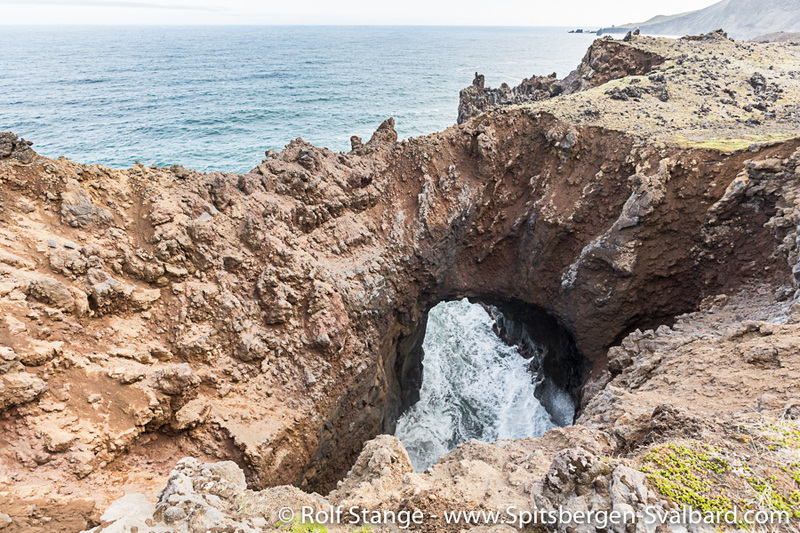 A shame that tourists are not allowed anymore to make landings in places like this. 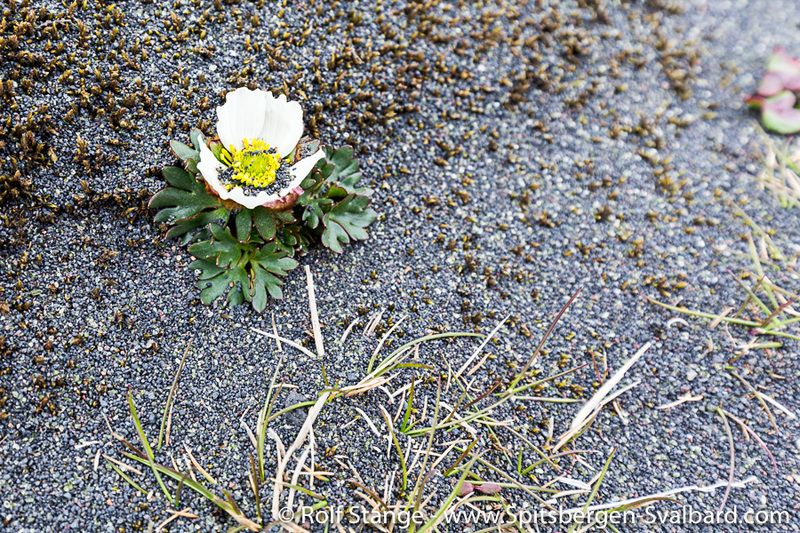 They like to clean a beach, as everybody knows who has been following this blog for a while. 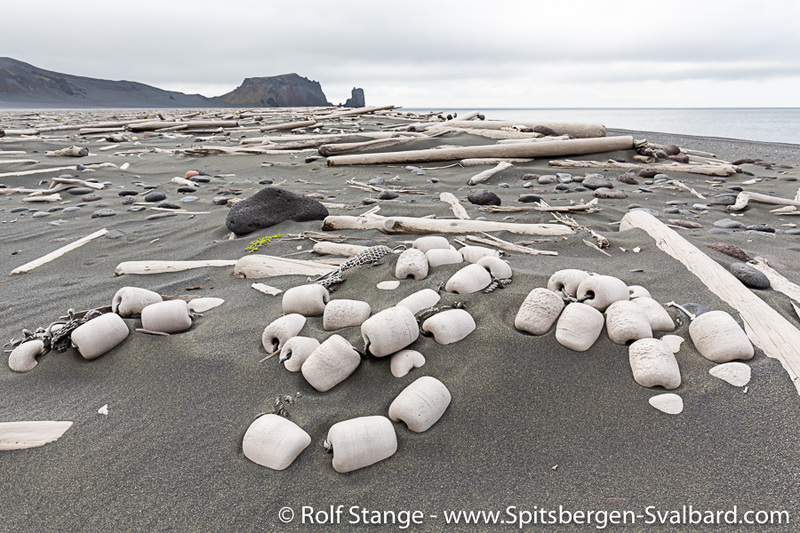 As it is, the plastics just remain here on the arctic beaches. Well done, Oslo. 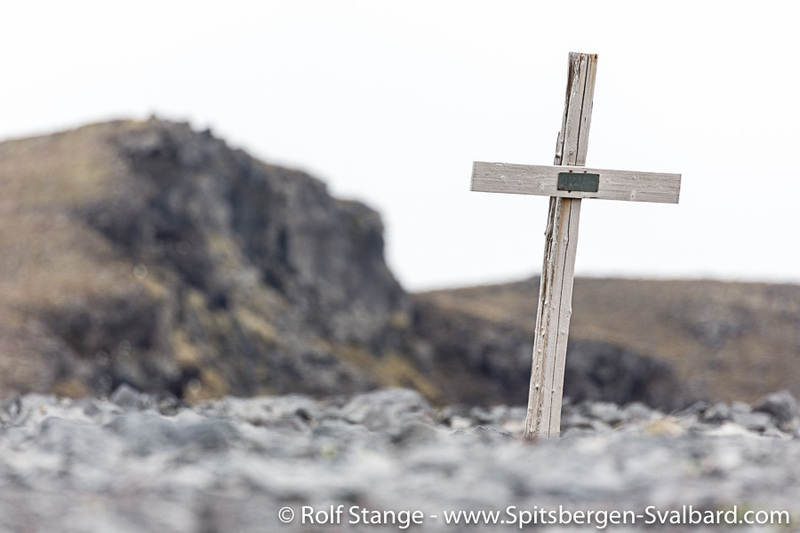 At the end of the beach, there is a lonesome grave on a little elevation. 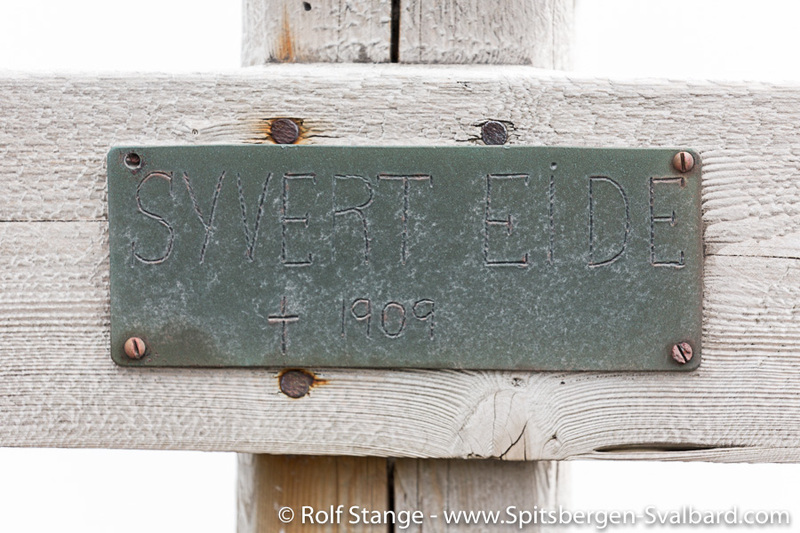 The metal plate on the wooden cross says Sivert Eide 1909. 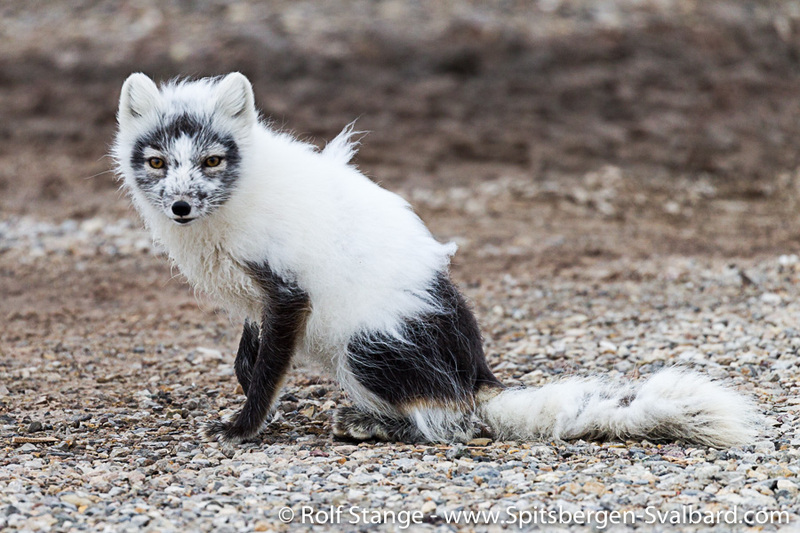 Sivert was member of the second group of Norwegian trappers who had come to Jan Mayen to overwinter and hunt polar foxes. 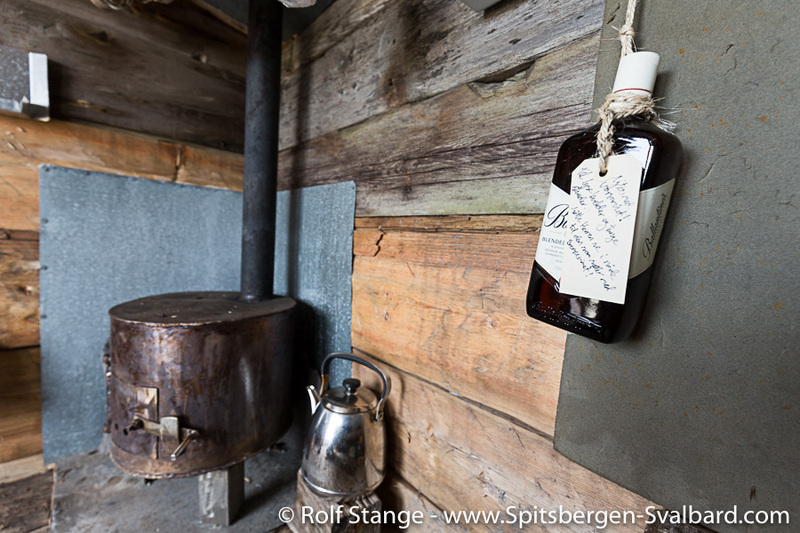 They had mainly used the Austrian station in Maria Muschbukta, but additionally built a hut here at Haugenstranda. 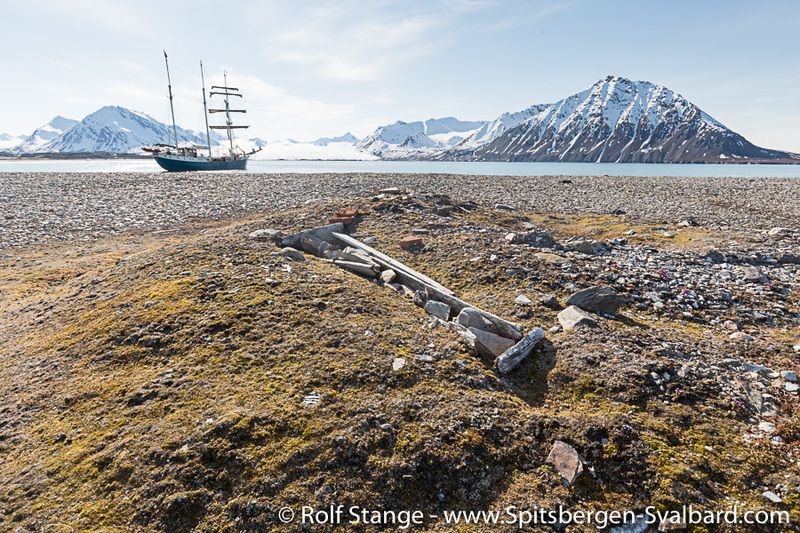 Sivert died here at Haugenstranda of scurvy in February 1909. 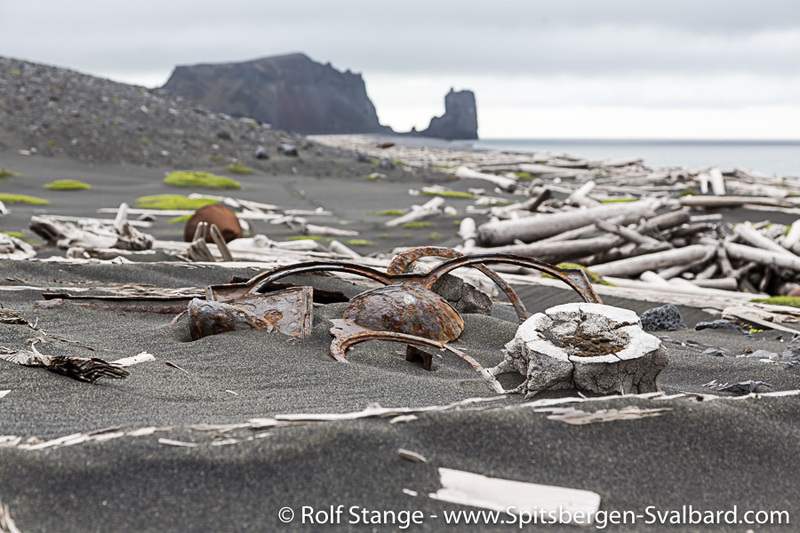 The storms have not left anything of the hut, just some rusty remains of the stove and some wooden planks tell the careful observer where a wall once may have been. 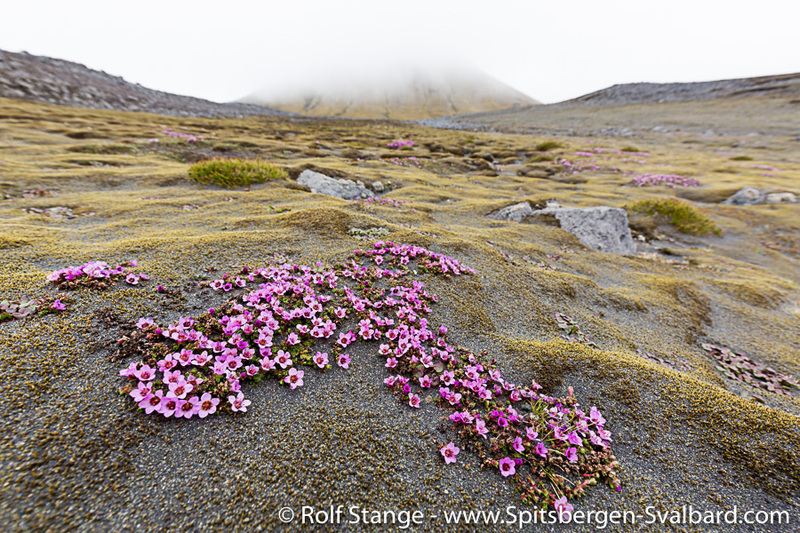 The way back leads me over a ridge of low hills called Lågheia, which is separating the coasts to either side of Mid Jan. Just a few metres of elevation change the perspective greatly and allow scenic views over Haugenstranda, while saxifrages and moss campion delight the eye with colour patches on the ground. 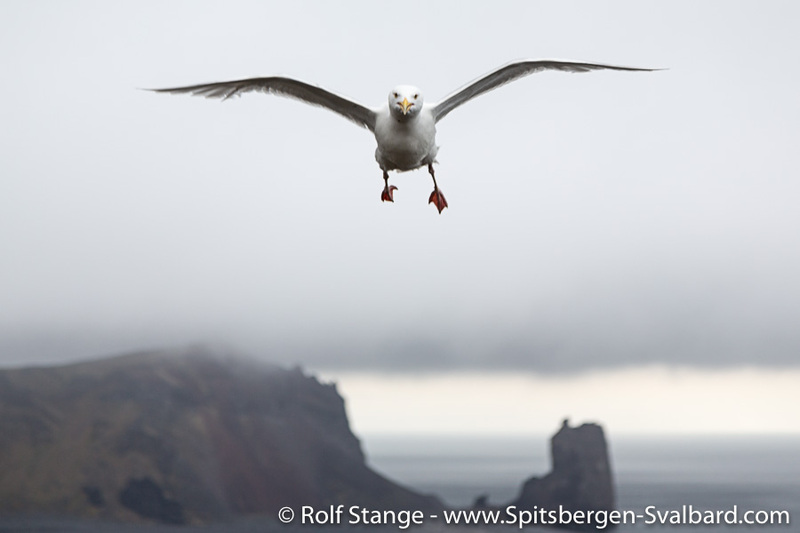 Aggressive glaucous gulls attack the wanderer fiercely. 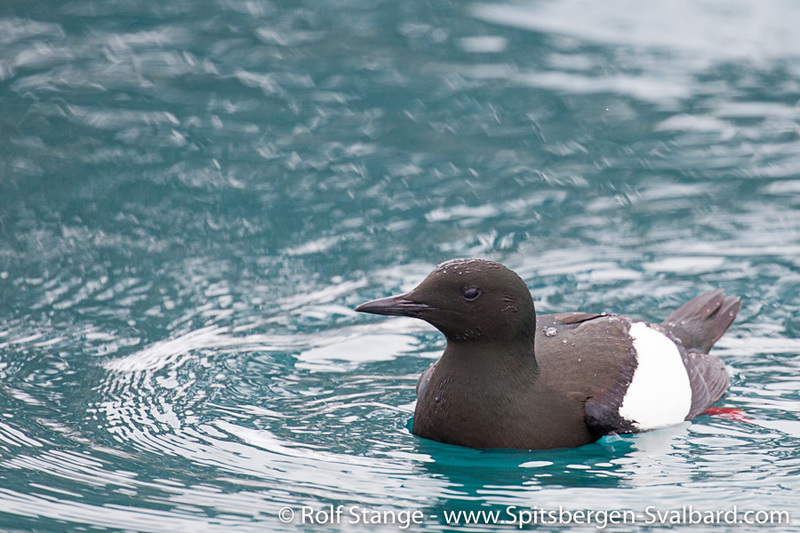 More than the birds, a light rainshower makes him set course back to Kvalrossbukta. 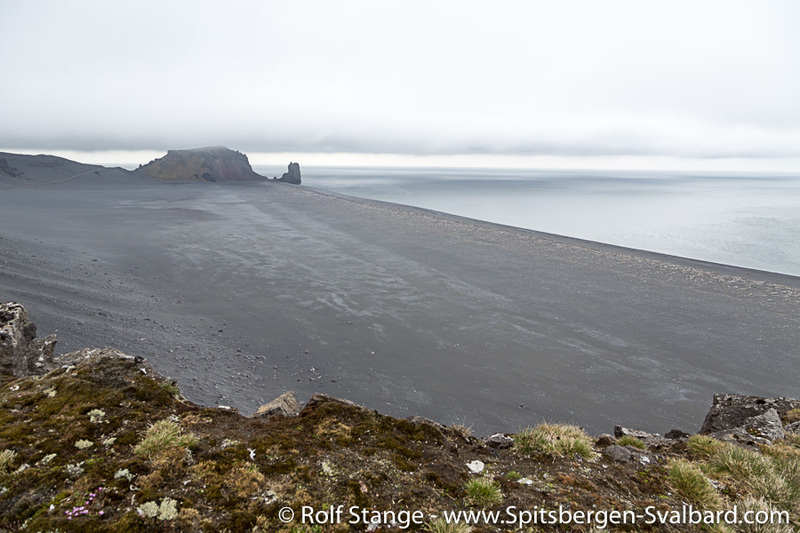 Neumayerkrater, a volcanic crater that might have been a nice extra walk in this area, is shrouded in deep, grey clouds this time. 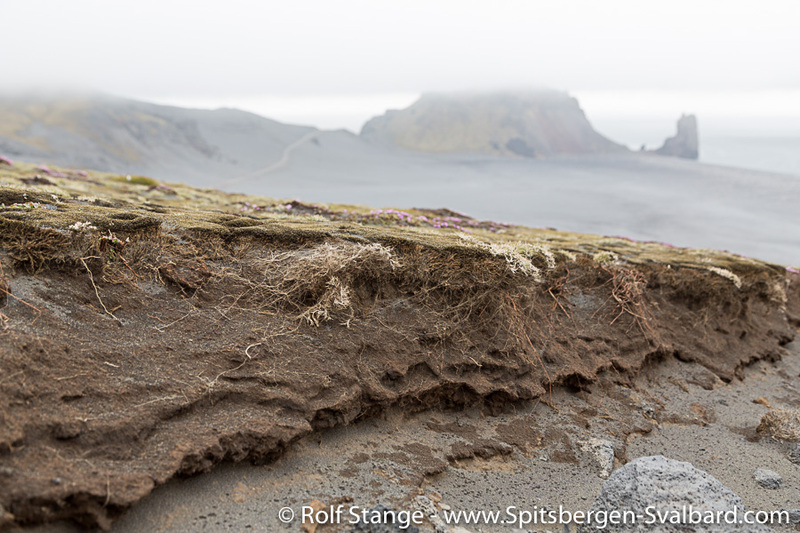 Various soil and vegetation structures tell a clear story about the ferocious winds Jan Mayen is so renowned for. 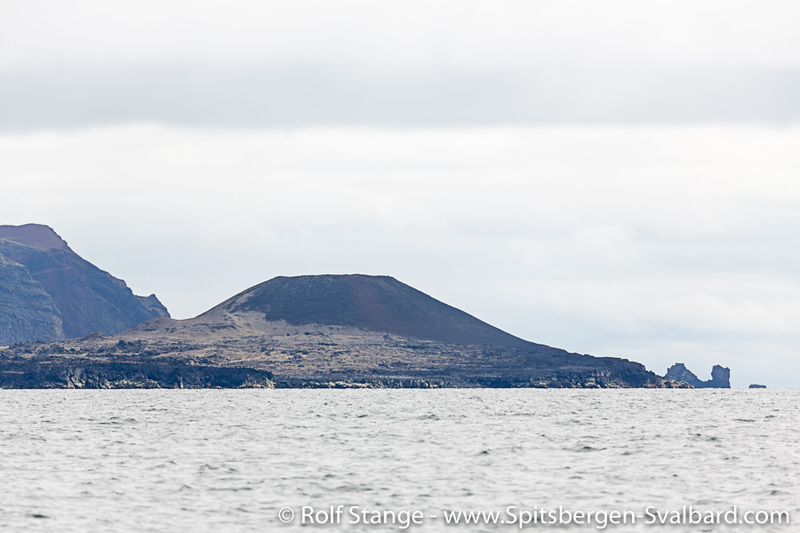 Today, there is just a light, steady breeze blowing over the volcanic hills. 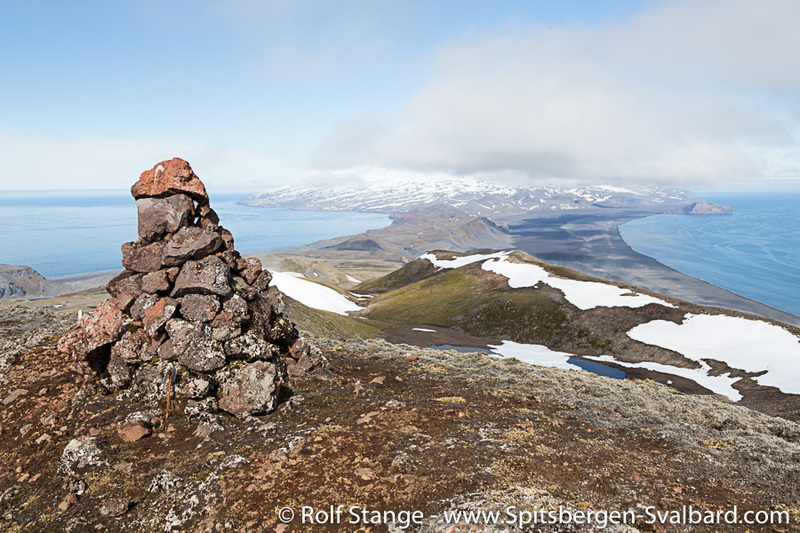 The wind, light and constant as it was up on the ridge, is falling down in strong gusts into Kvalrossbukta, quickly calming down again just to take a rest to gather strength for the next attack. 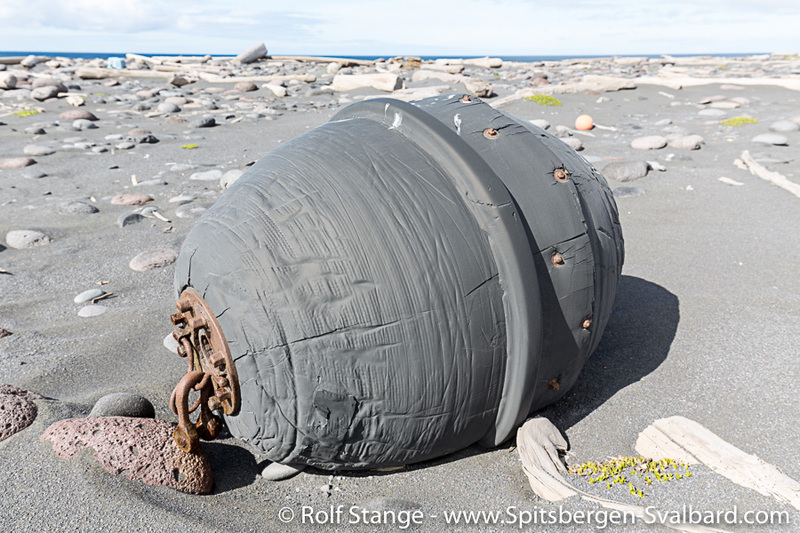 During the night, we all have to get out of our sleeping bags to secure the mess tent with more stones and driftwood before it starts to take of for a flight over Jan Mayen. 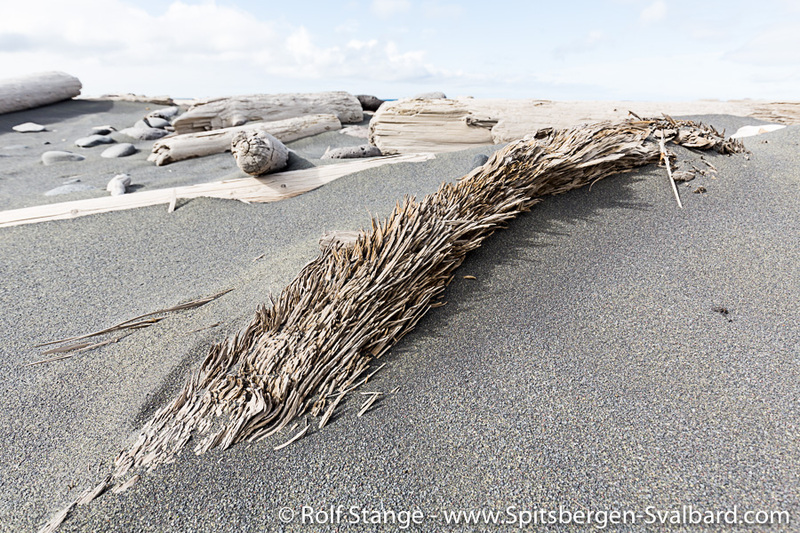 The sun is shining and the wind is blowing somewhere else today. 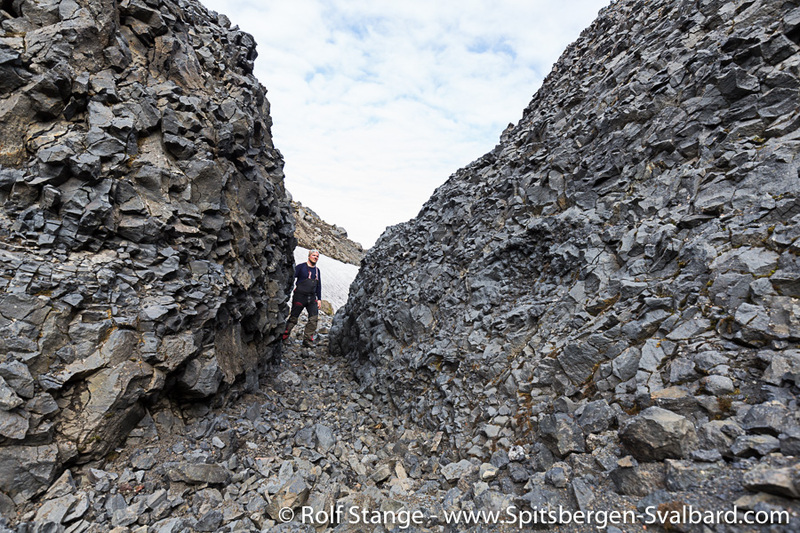 So we do not waste much time but get ready for some longer hikes. 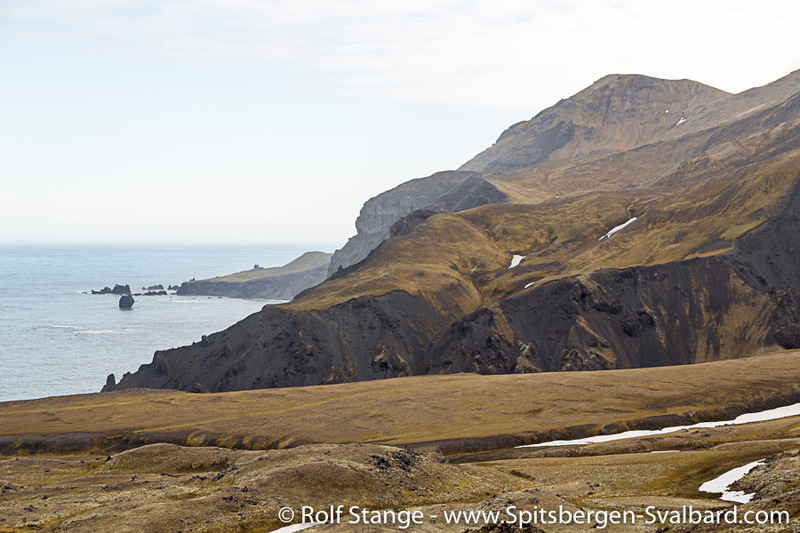 Most of us aim for the north, to Beerenberg and its surroundings, the northern lagoon, Maria Muschbukta, Eggøya and so on. I opt for a different way and take the route to the south. I know Nord Jan quite well, have seen a lot there already, while in the south, my mental map still has a lot of white gaps and my photo archive needs some serious completing. So something has to be done over there, for sure! The opportunity is good. 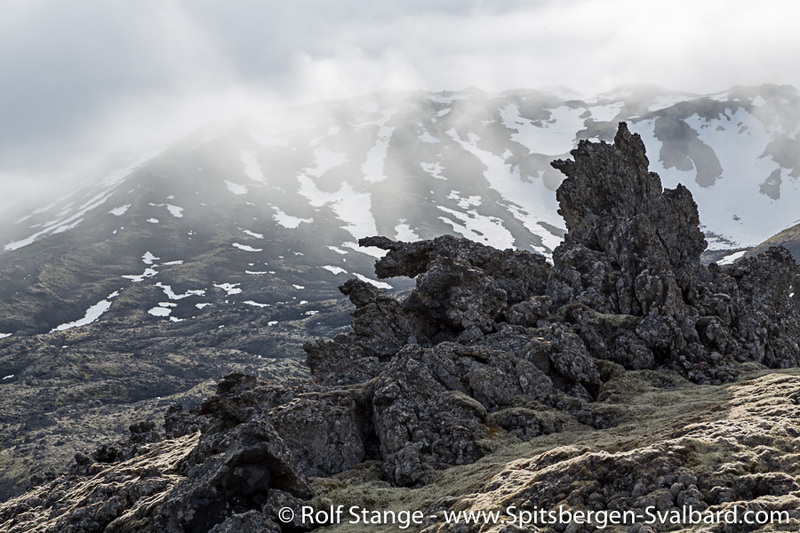 So while the majority is heading northwards – three of them will make an efficient, successful dash to the top of Beerenberg – I am going to the south. The view over the backbone of Mid Jan to Beerenberg, which is more and more getting out of the clouds, showing its amazing splendor in full sun, could not be more overwhelming. 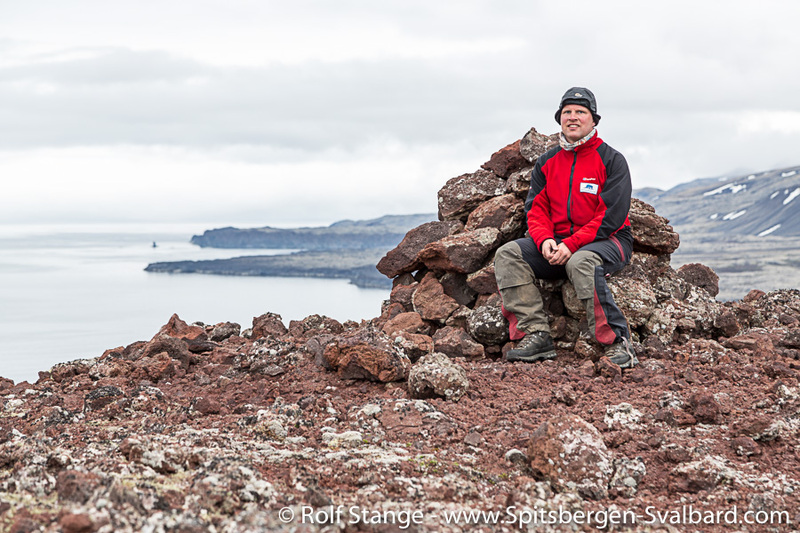 To the south, Sør Jan is stretching out with its confusing arrangement of hills and craters. 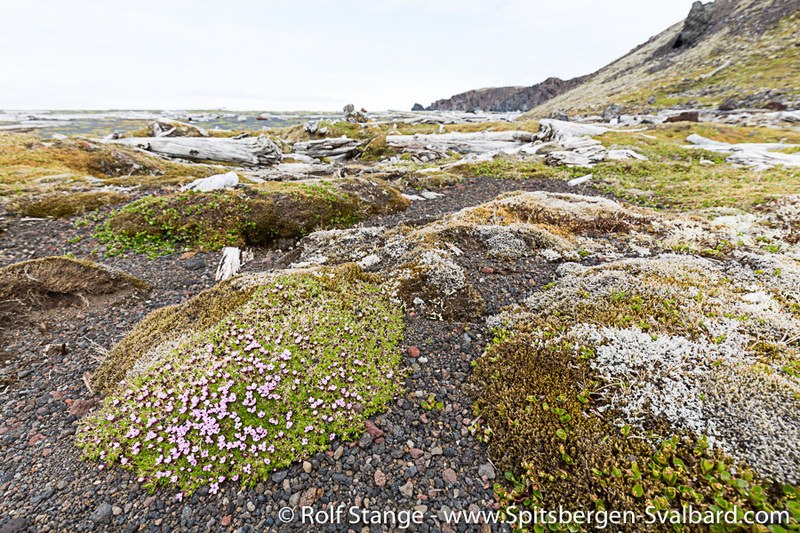 The deep, soft mosses, which are growing on large areas here, the unprecise map, the volcanic terrain which is often lacking geomorphological logic, all this contributes to the demanding expedition charakter that any longer hiking on Jan Mayen will quickly have. Another factor contributing to this is the almost constant, latent lack of water: soon after the snow melt, the few little streams are falling dry. There are only a few little lakes. 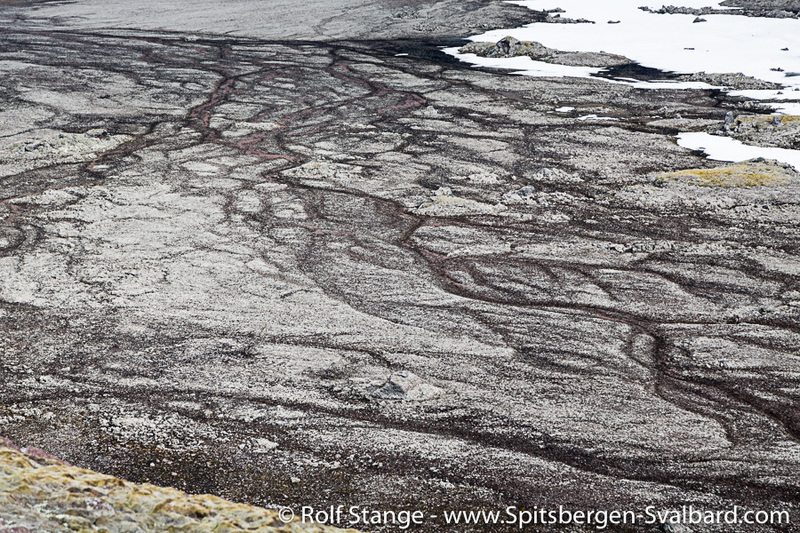 So you have to rely largely on snow fields, which means: no water without a stove to melt snow. 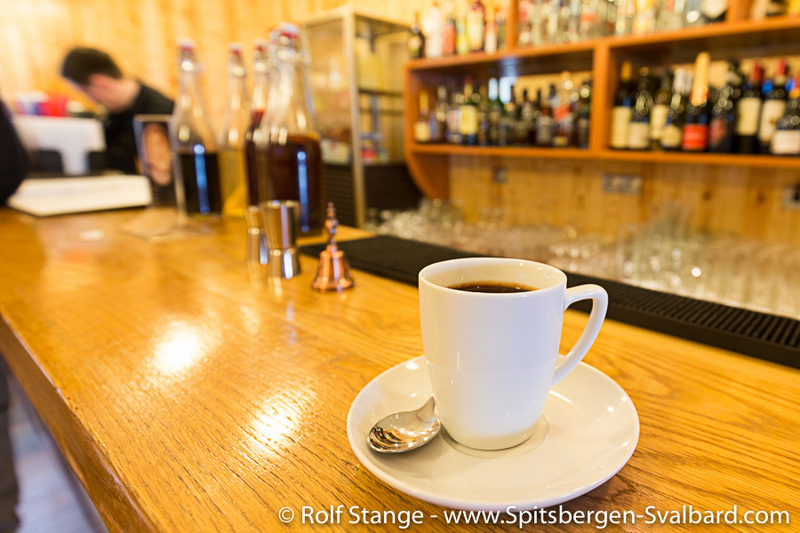 During the day, there is usually no more drink than what you carry with you. On this trip, as on previous, similar ones, I quickly greet thirst as hunger’s big, evil brother. 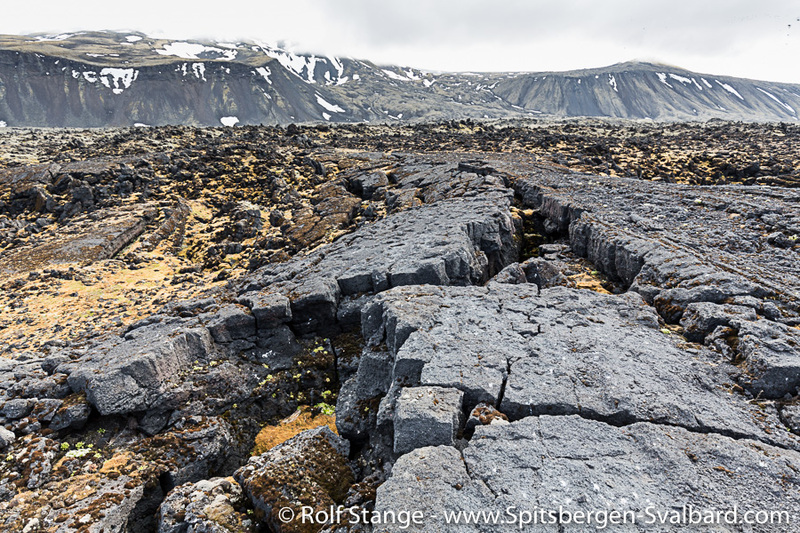 While stumbling over dry lava fields for kilometres, I was thinking of novels that I could write about thirst. Thirst soon dominates not only my mouth, but also my brain. The idea of a lively spring is paradise, a beer worth its own weight in gold. All this certainly far from any real danger, but there is this omnipresent, at times rather uncomfortable lack of liquid. 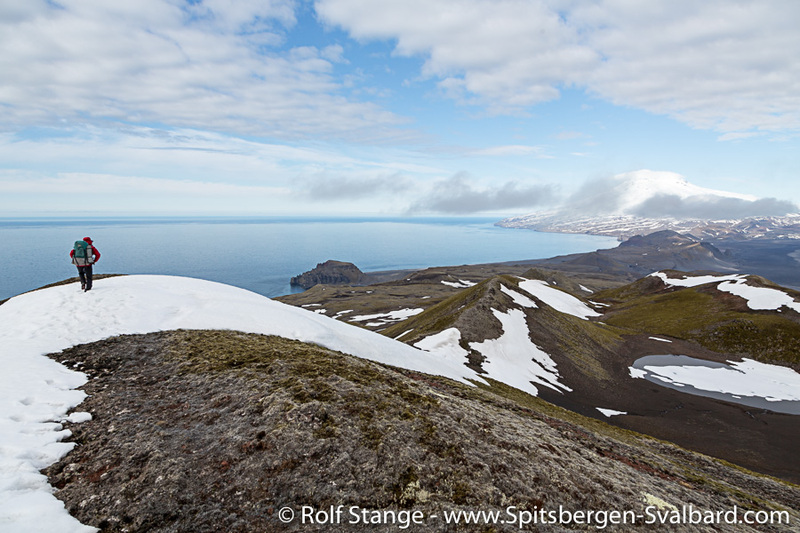 At any time I have the next snow field in view, my planning is according to kilometres in the terrain and litres of water in my rucksack. Yet another factor making life more difficult than necessary are the legal regulations in force since 2010. Making life difficult for those few still passionated (and stubborn) enough to travel here is the purpose of these rules, I guess. 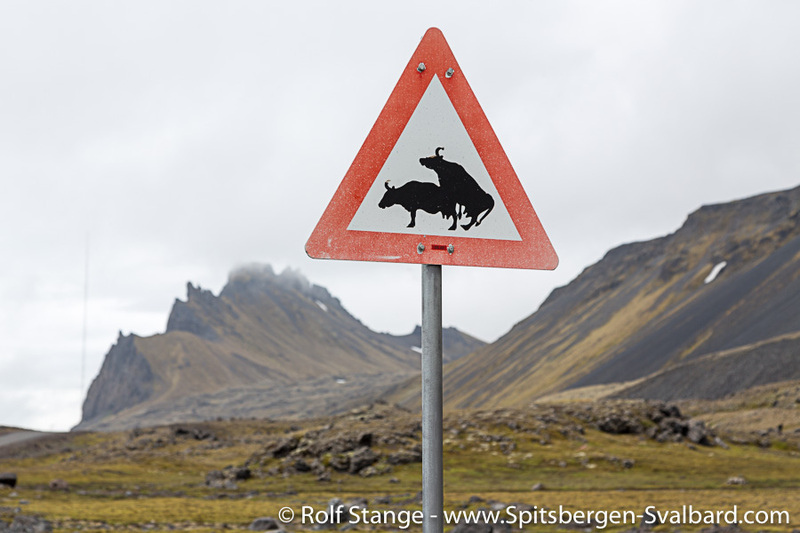 Camping in the field is forbidden as is any landing (or pickup) outside of Kvalrossbukta or the station area. 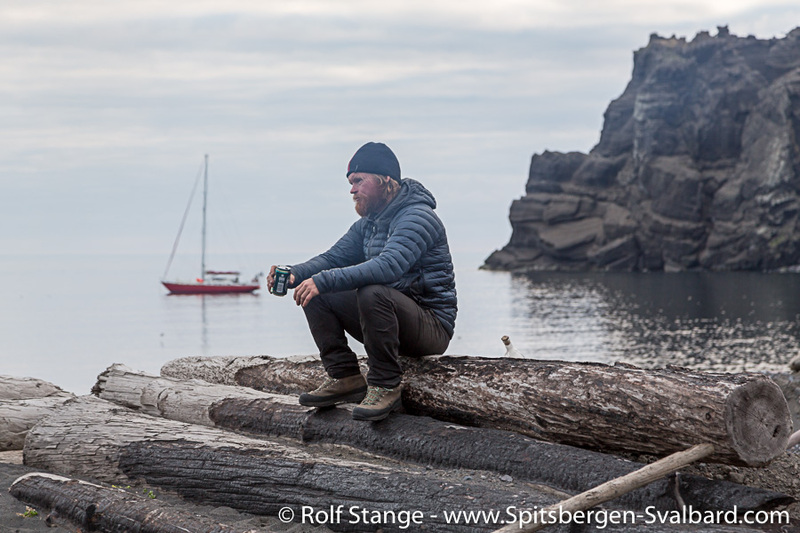 Despite sea conditions being as calm as they might ever get, a quick lift or pickup by boat, technically very easy, logistically convenient and very safe, is not an option. 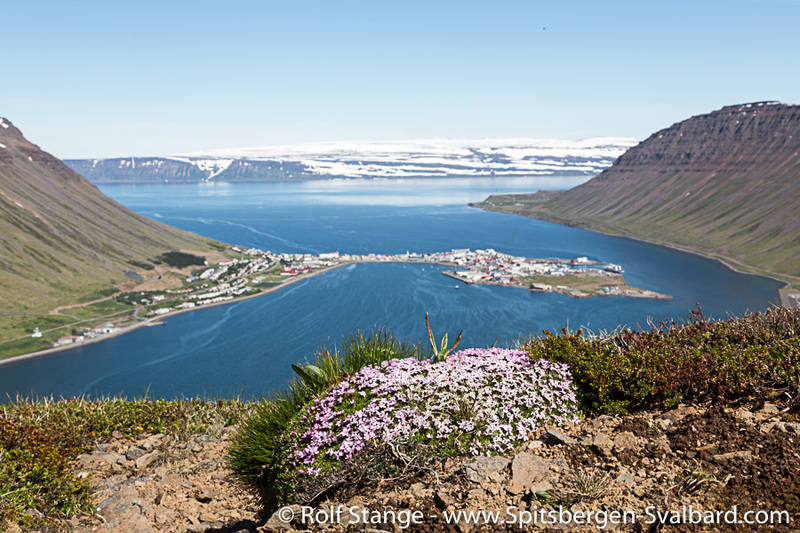 Instead, there are all these kilometres on the long and boring road to the north or south from Kvalrossbukta, to the places we are longing for. Well, a lot has been said about the sense (or, rather, nonsense) of this legislation. Enough for now. 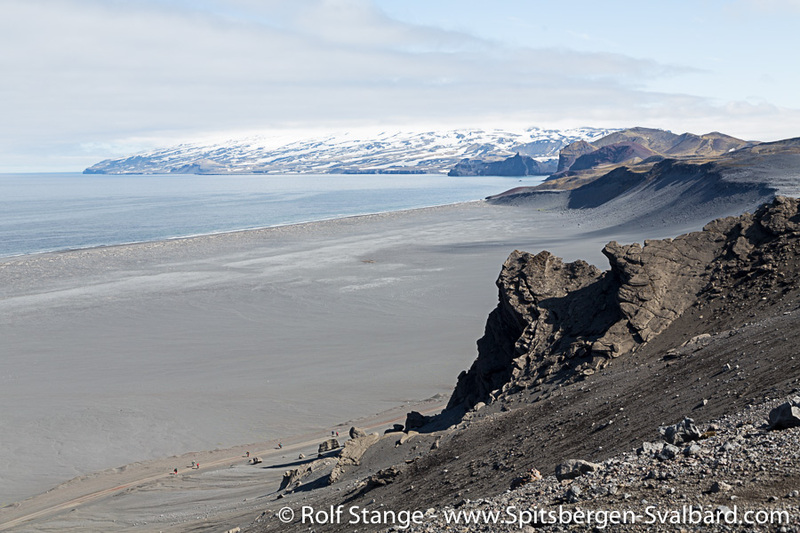 So these are the frame conditions which you have to be prepared for when hiking on Jan Mayen. 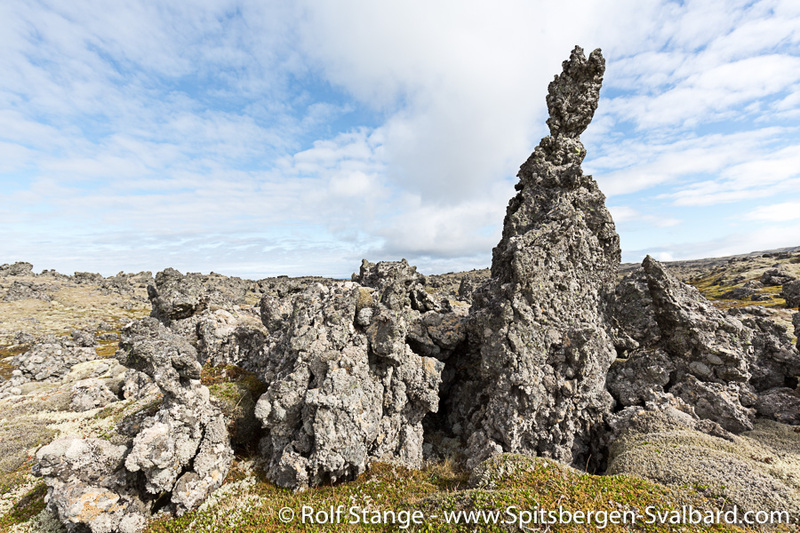 Quite exactly as the trip to the top of Beerenberg, my tour amounts to a good 60 km over land and quite a lot of altitude, although the vertical metres are not concentrated on one prominent peak, but happen on many smaller hills and slopes. There are dozens of them. 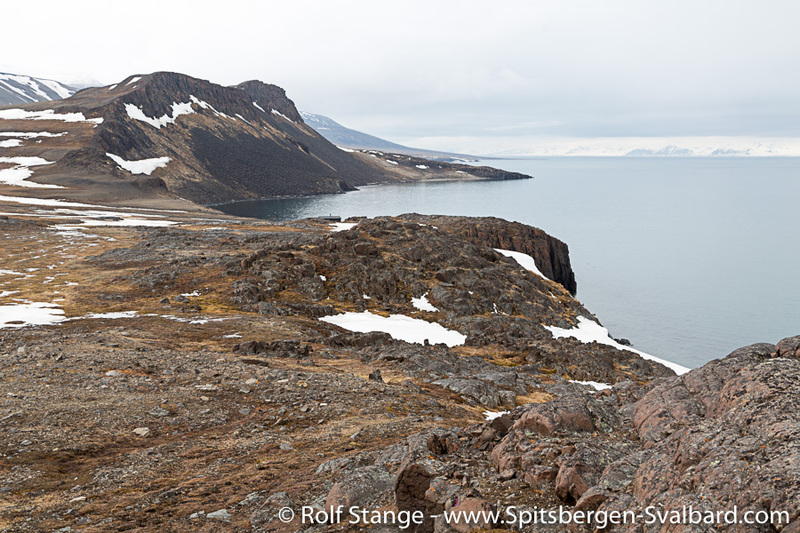 The short crossing of the island from upper Trolldalen takes me to Sjuhollendarbukta. 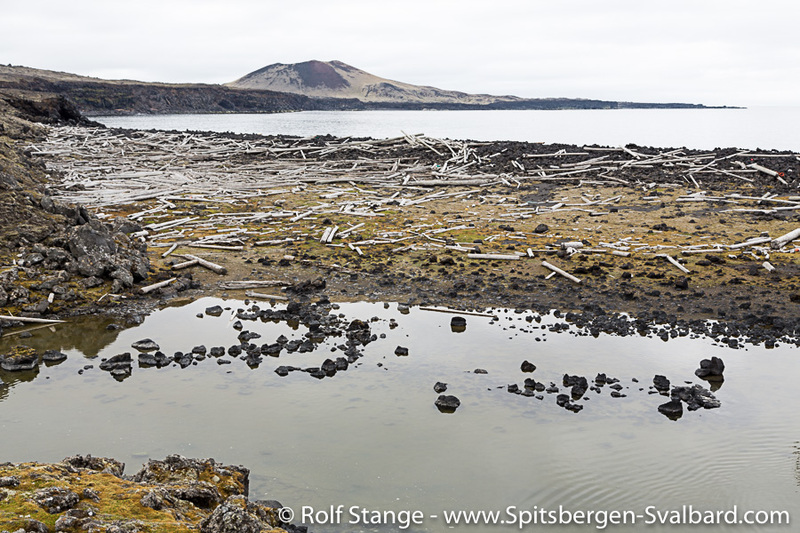 This was the site of the famous wintering of the seven Dutch whalers in 1633-34, not Kvalrossbukta, at least according to the Austrian expedition from 1882-83 (First International Polar Year). 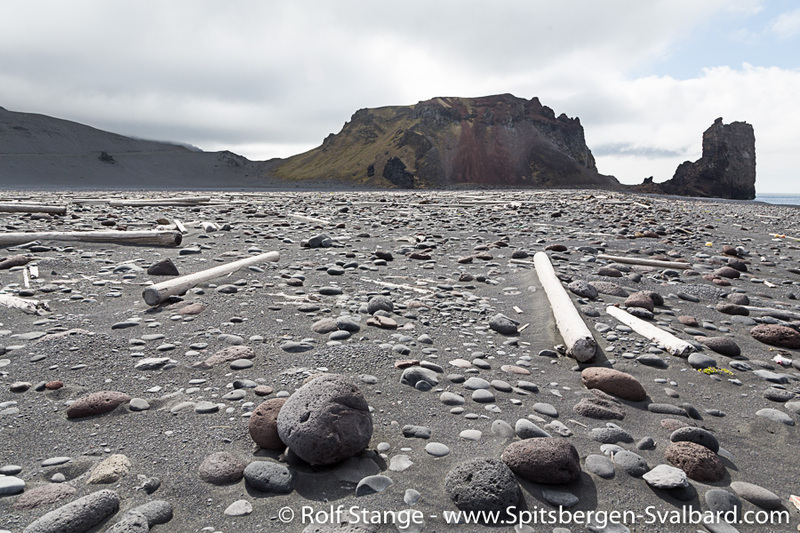 The name of the bay, which translates as Seven Dutchmen Bay, is another reference to the winterers who made it through the dark time just to die from scurvy weeks before the relief ships came. We will probably never now for sure where exactly this tragic adventure took place. 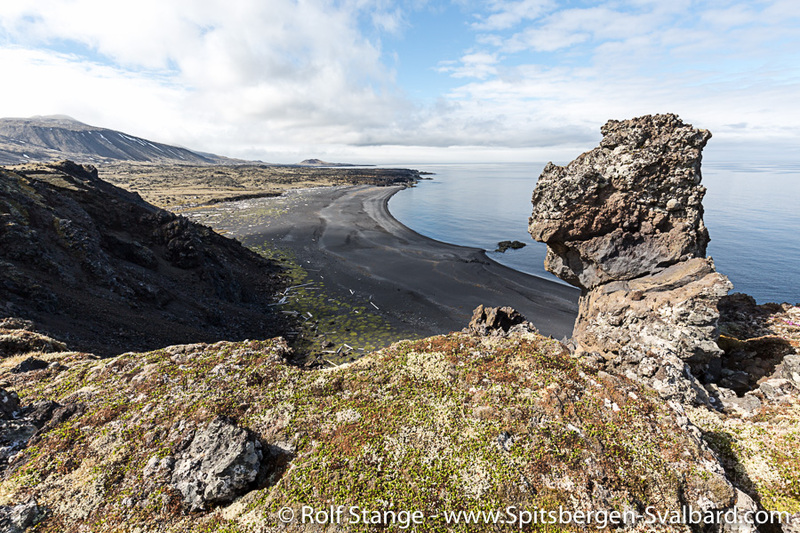 Today, Sjuhollendarbukta is a lovely, beautiful bay with a wide beach of black volcanic sand, framed in by the odd-shaped rocks of wide-stretching, moss covered lava fields. 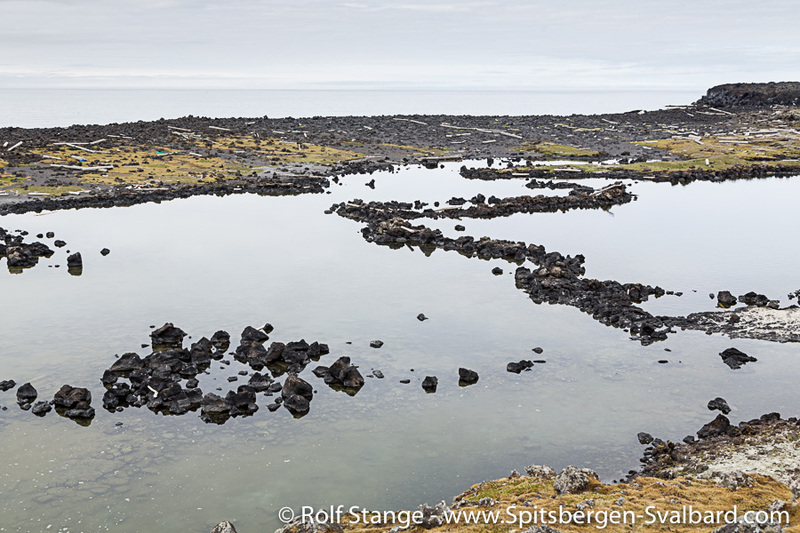 Something similar can be said about Titeltbukta, which was another important place for the Dutch whalers. Again, nothing is left of their „10 houses“ (ten tents = ti telt). 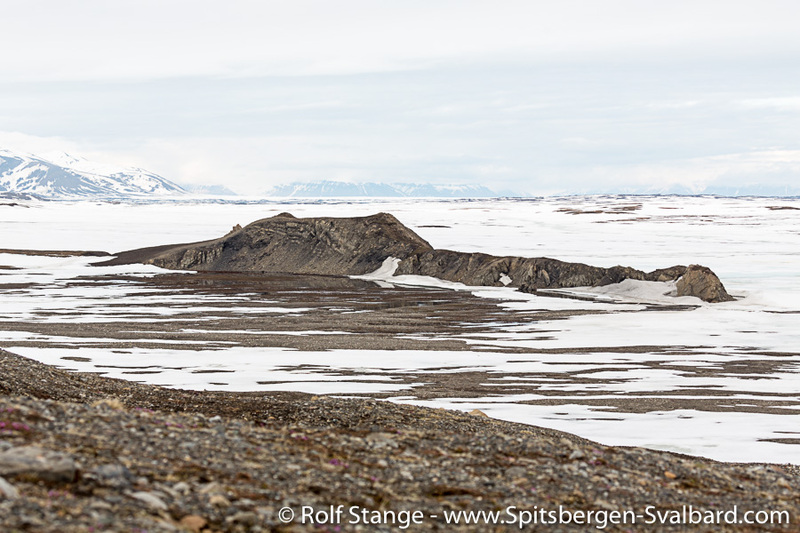 All that reminds of longer-lasting human presence is a small, but charmful trappers’ hut which has withstood the wind now for more than a century. 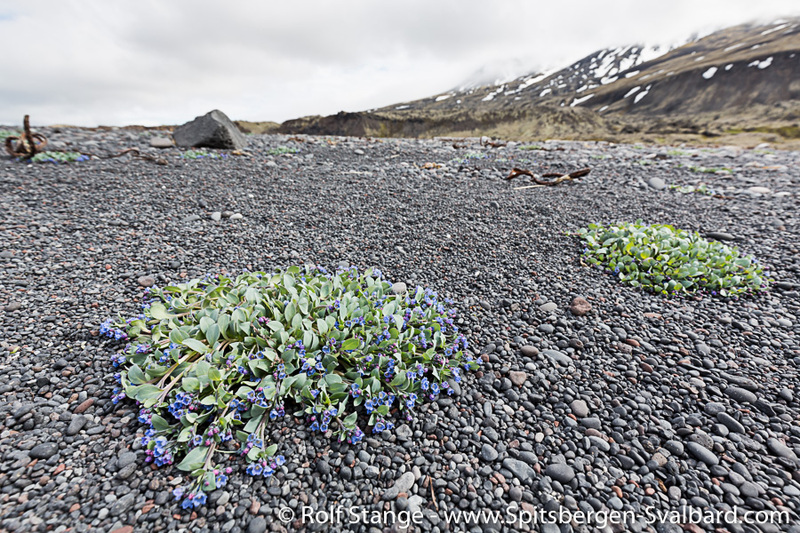 Oysterplant, rare in Spitsbergen, is colouring the black sand in many places, and the rich colours of the mosses and lichens in the lava fields are amazing. 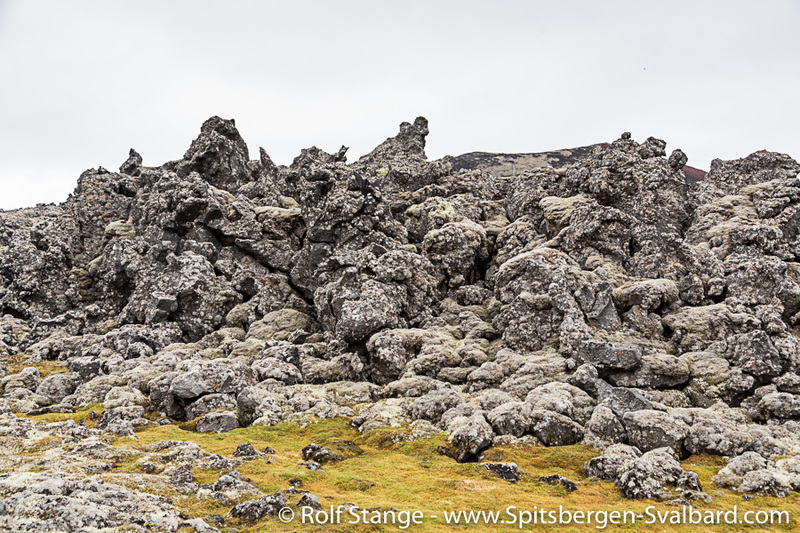 And yes, the lava fields. 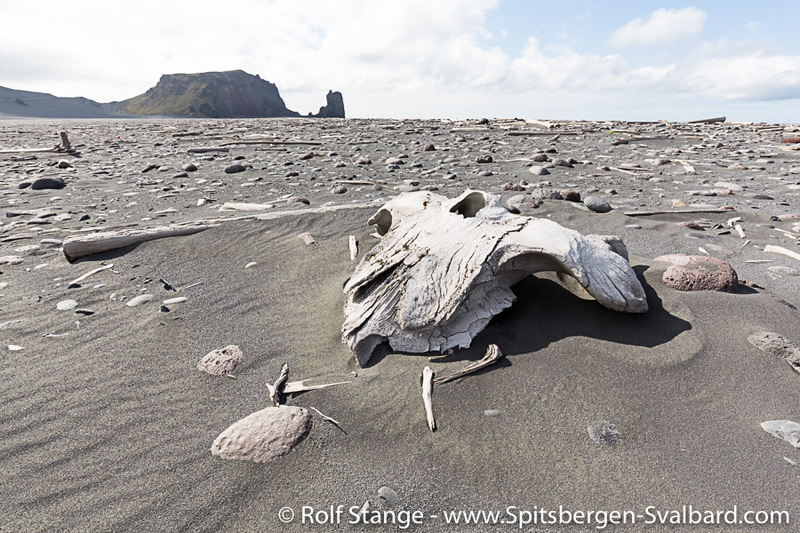 If Jan Mayen does not have her own legends and myths about elves and trolls, then it is just because the island has not been inhabited for more than a 1000 years such as neighbouring Iceland. Of course, there are goblins and dwarves living here, and countless other creatures that prefer the darkness above the sun! 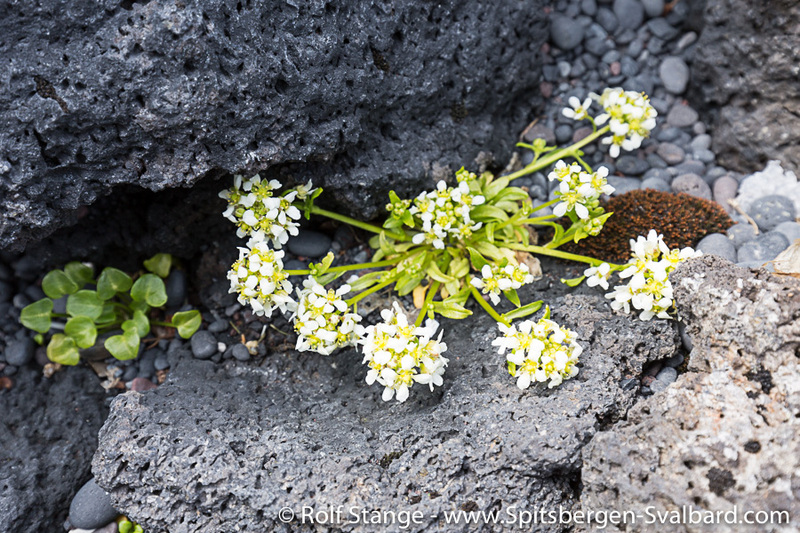 Just as the well-known giants with the strong sun allergy, which react to direct sunlight by immediately and completely turning to stone. One of these trolls just wanted to show me the way, as it hit him. Unbelievable what else was around here: turtles, warriors, castles and towers, giant worms and knights … everything you could think of and more than that. 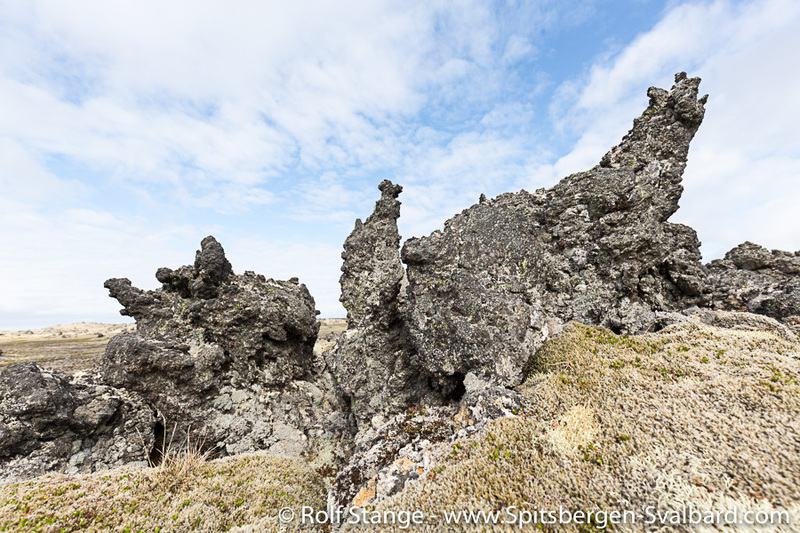 Today, there are all silent statues of sharp-edged lava rock, secretly watching the lonely wanderer who might occasionally cross their realm. But even so, I am not on my own. 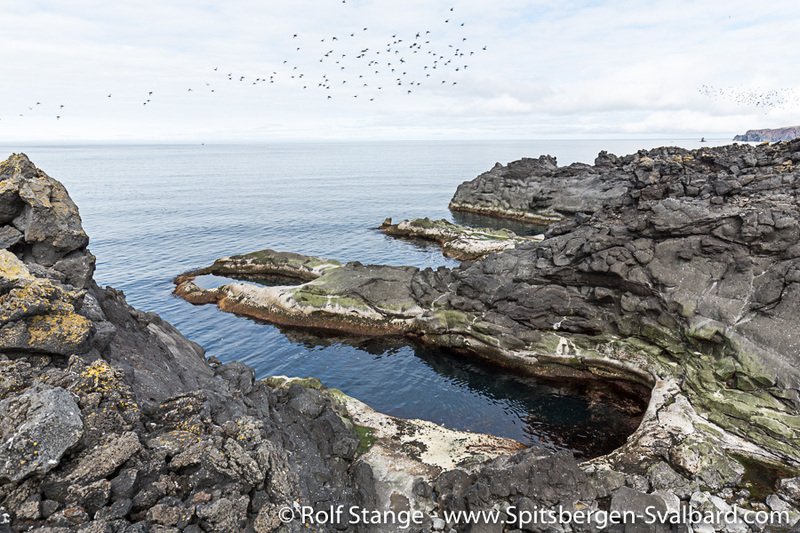 Myriads of Little auks are breeding in the lava fields. 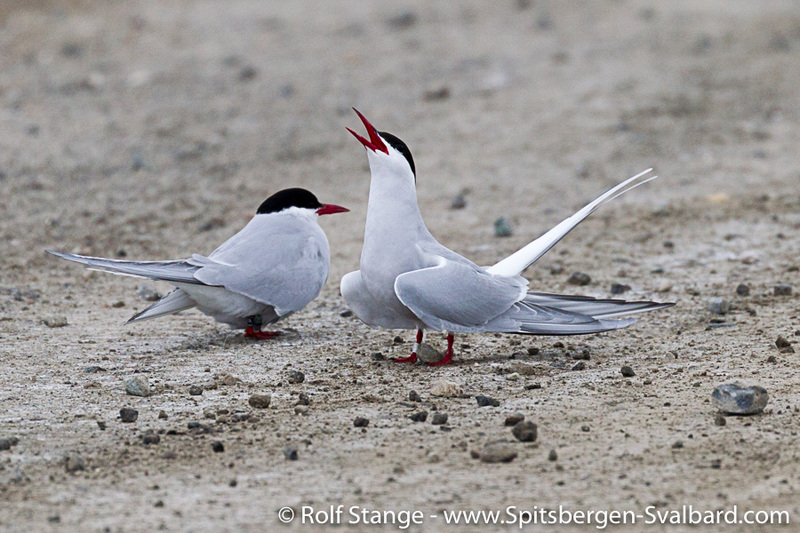 Numbers and densities over large areas that can certainly compete with the better-known, big colonies in Spitsbergen. Constant screaming and crazy laughter, everlasting hectic activity in the air while big swarms are heading to and fro. 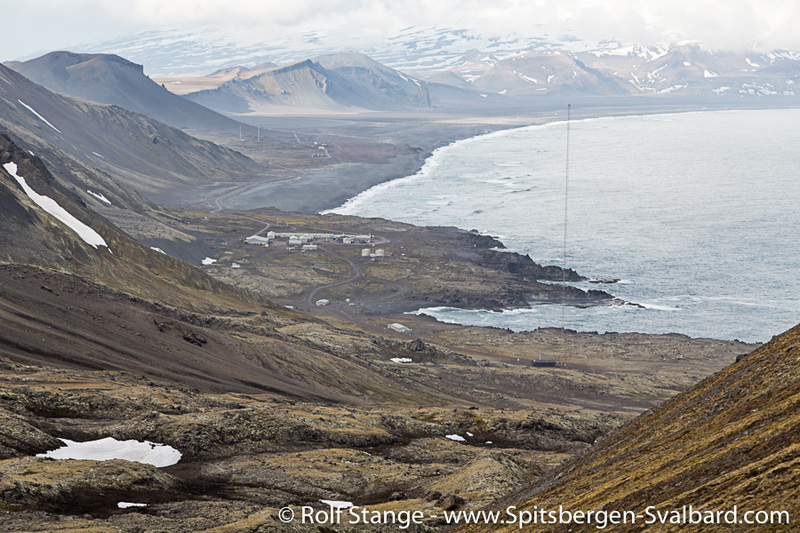 In more flat terrain, skuas and arctic skuas defend their territories with aggressive passion against any intruder. 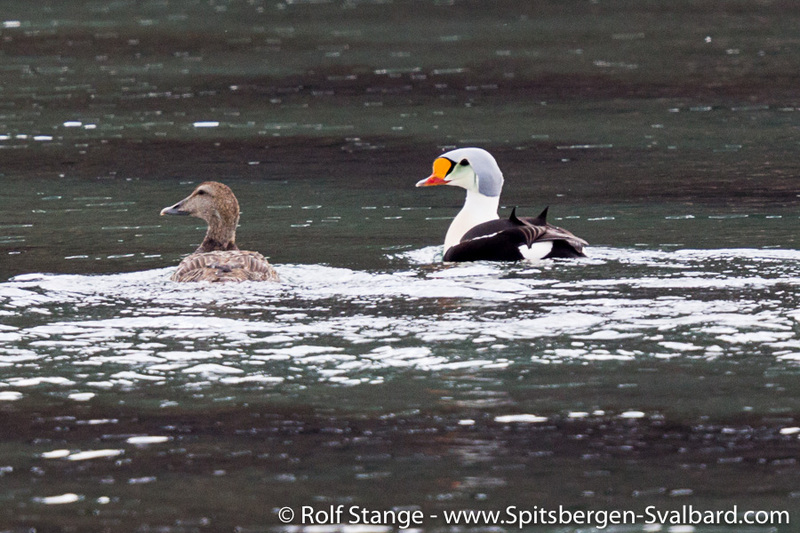 In Guineabukta, Common eiders are calling from a coastal lagoon. 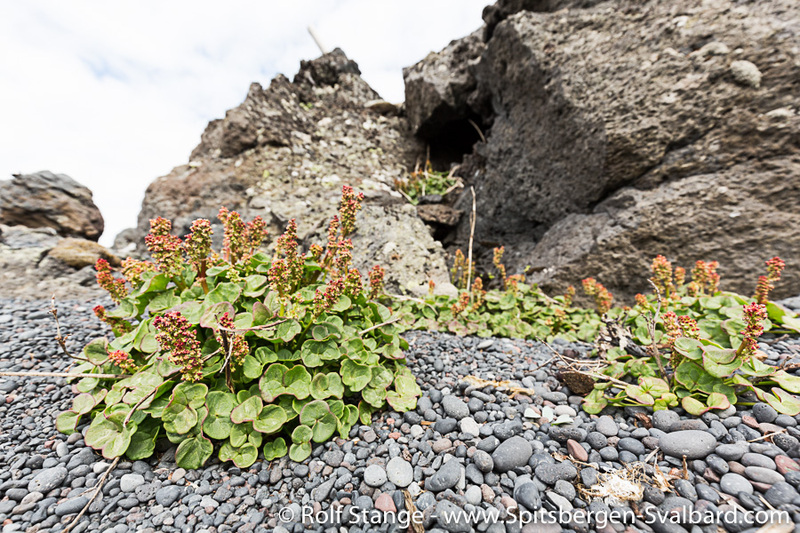 They have their nests hidden in the lava fields. 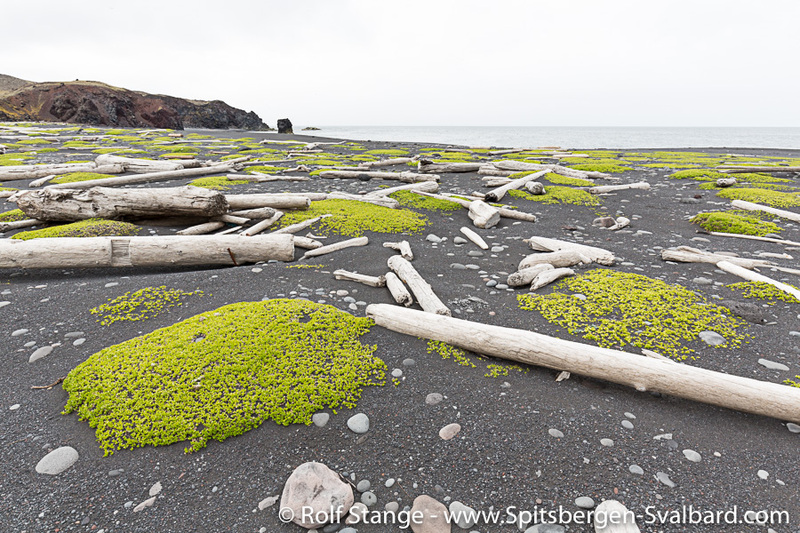 At Jan Mayen’s southwestern end, there is some lowland called Kraterflya. 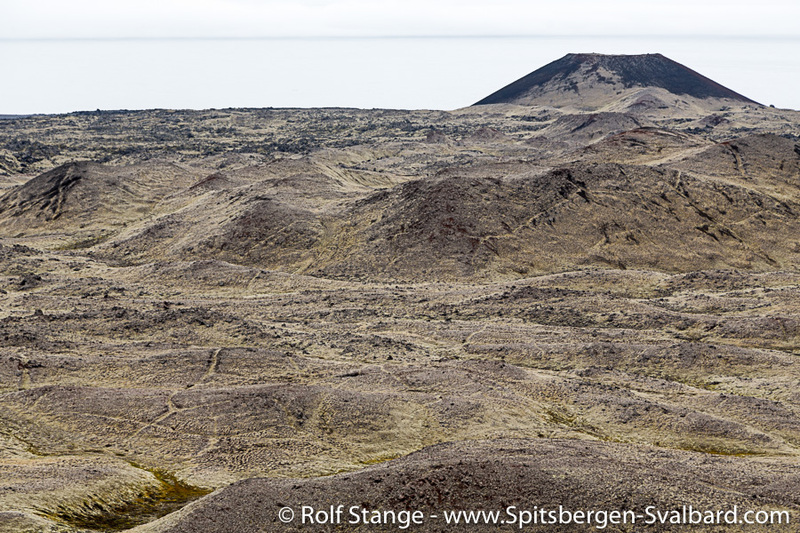 The name is descriptive: several nice craters and cinder cones are spread over the lowland, including Richterkrater, which is better known than many of his relatives, for reasons that are not obvious. 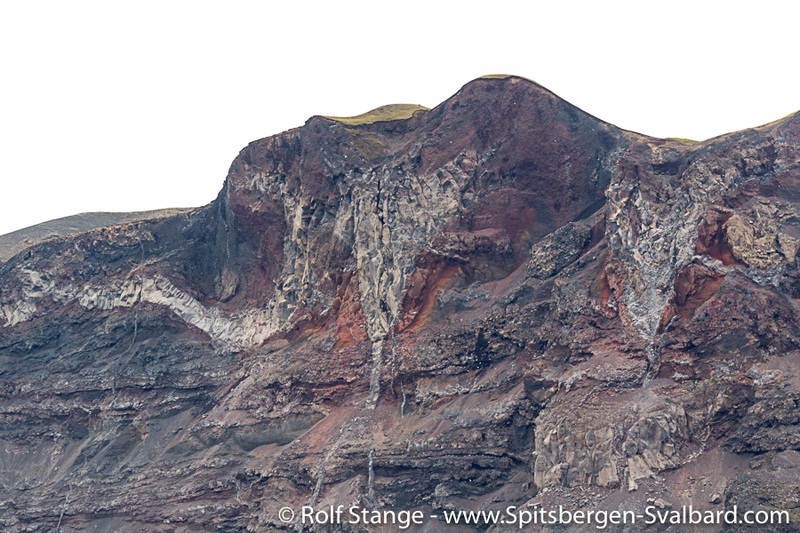 Not that he would look any different than many other smaller kraters on Jan Mayen. 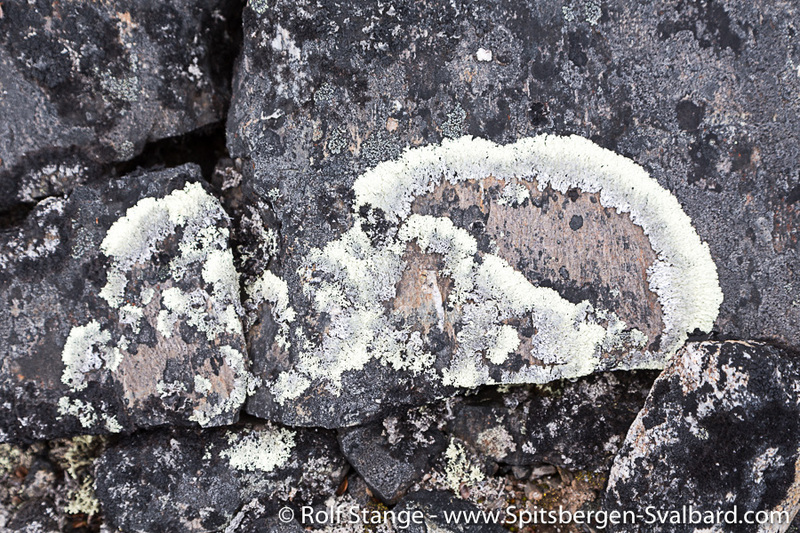 Neither can it have to do with the ice wedges that decorate the steep, moss-covered slopes with geometrical patterns. 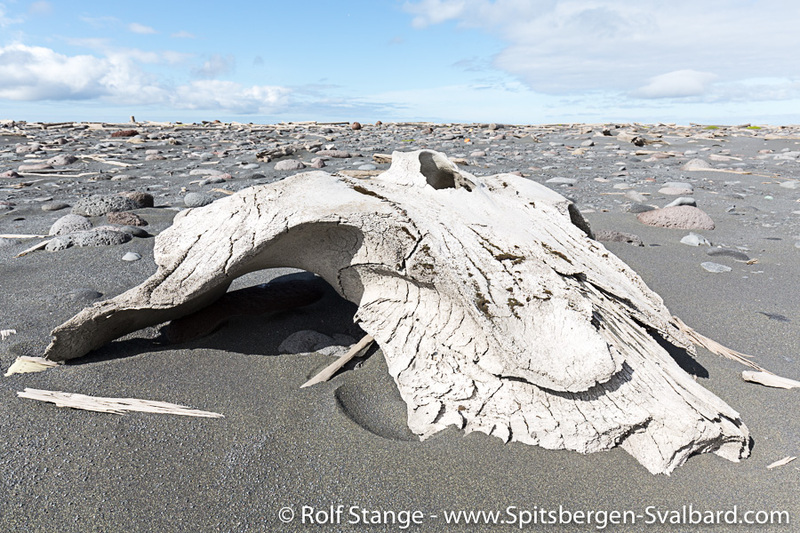 Even though they are less common than, say, in Spitsbergen, this is not the only place on Jan Mayen where you can find them. 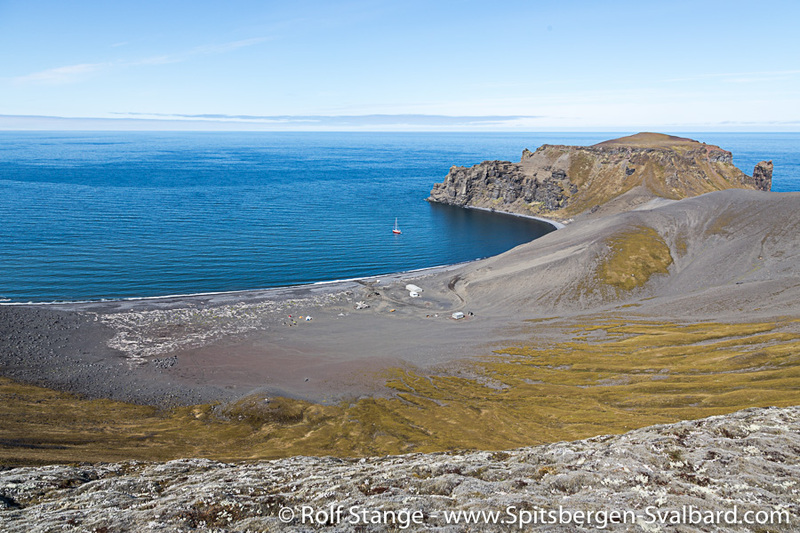 Maybe it is just because it is so nicely located close to the shore, making those who pass by on a ship think: what a nice crater, I just have to visit you one day! Well, at least I have thought this more than once, and now the door has opened a bit, time and weather are on my side. So now I am here. 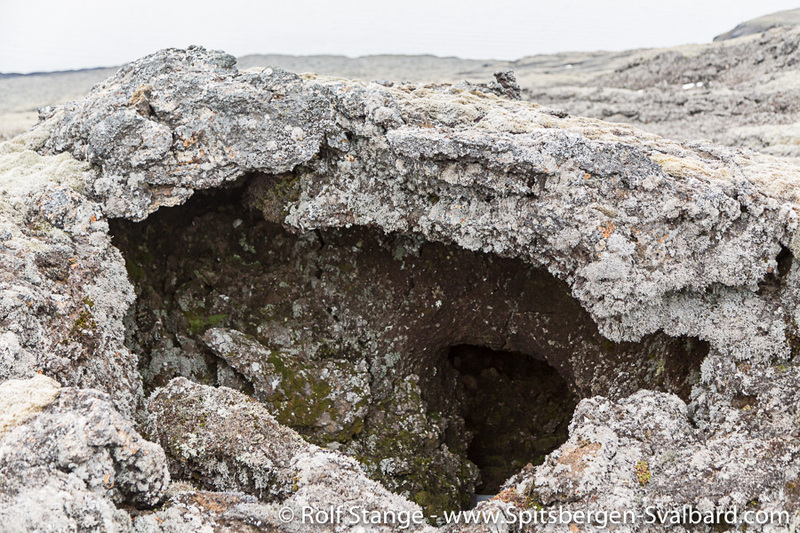 Someone has called the lowland between Guineabukta and Richterkrater Helheimen, home of hell. 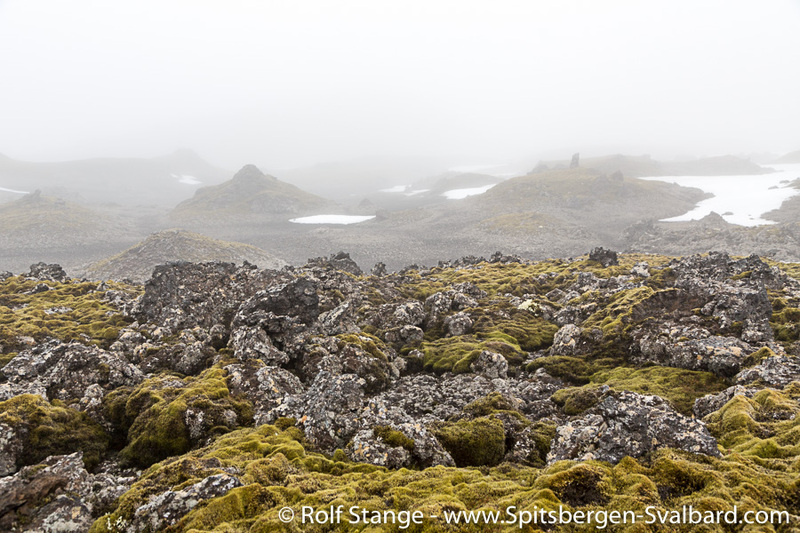 It is not quite that bad, but not without reason, as yet another especially mean lava field is located here, giving hiking shoes and walking muscles a hard time. Be careful! No false step is allowed, a broken leg would be so much worse here than most other places in the world. 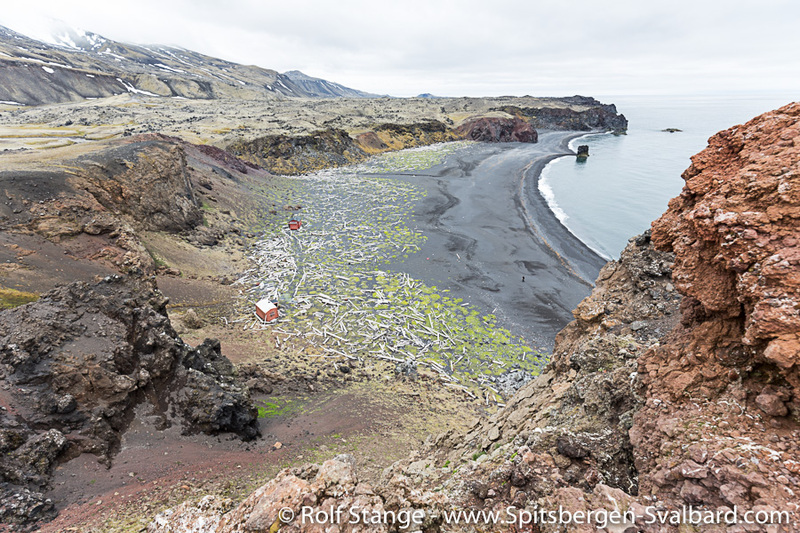 Then I am standing on the rim of Richterkrater, enjoying the views over bizarre lava flows and several craters in the surroundings and the fact that I have now come to another place that had been on my wishlist for a long time. 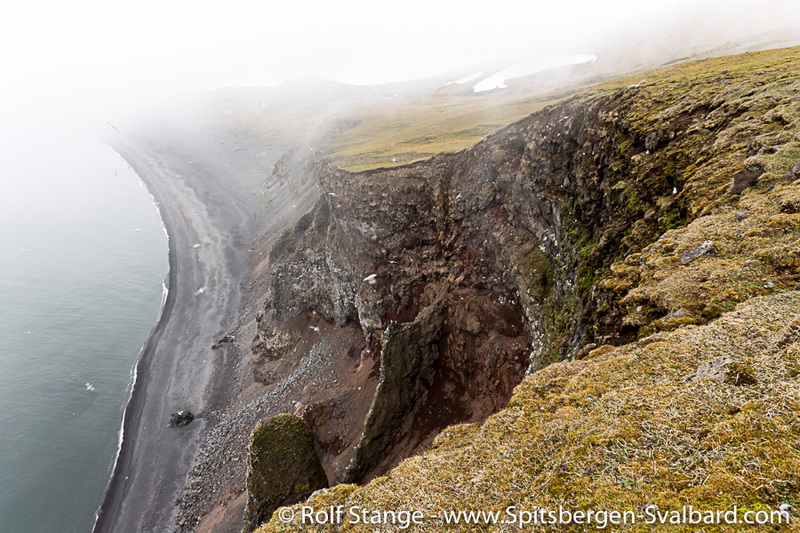 My feet remind me that this pleasure comes at a price, but before I start returning to the north, I walk up to the steep cliffs at the southern point of Jan Mayen. 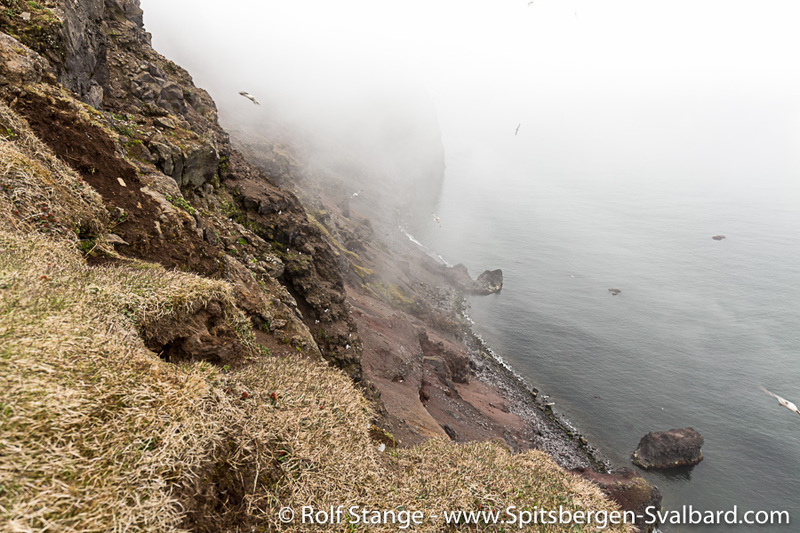 Vertical, rugged cliffs, where countless Glaucous gulls and Fulmars are screaming, while keeping a watchful eye on me. 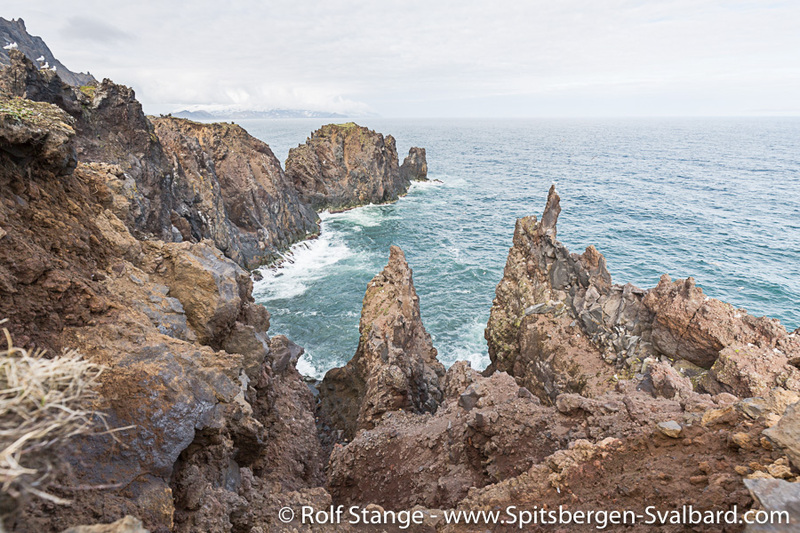 Sharp rocks stick like knives out of the cliffs and the coast, former volcanic intrusions. Fog is rolling in from the east, as if to tell me: this is where you wanted to come, this is where I allowed you to come, but no further. This is it. I agree and turn back. 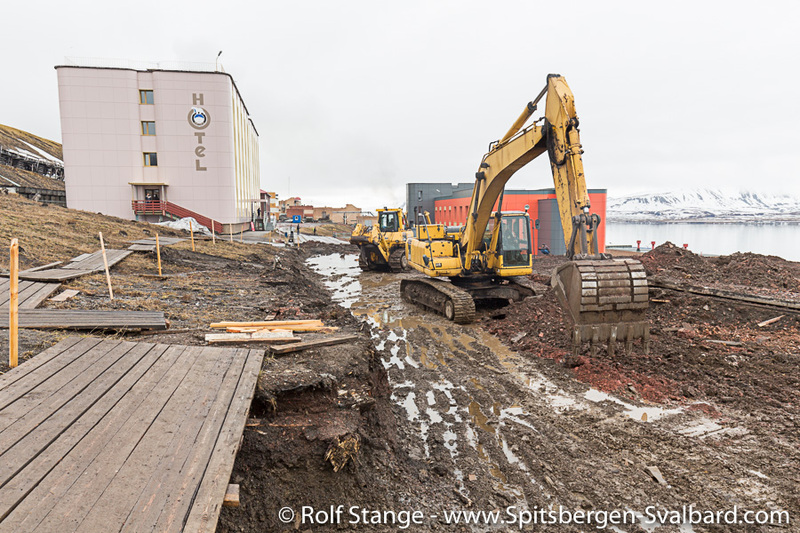 The way to Kvalrossbukta is still more than long enough. 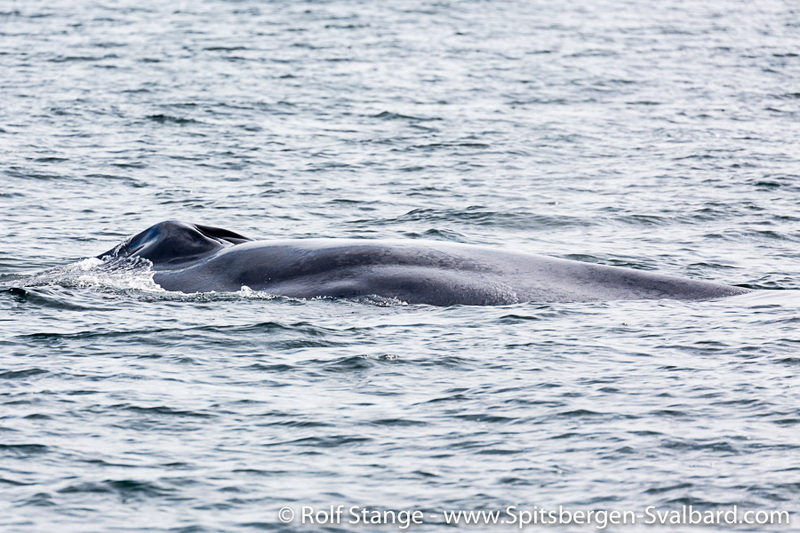 The crossing is amazingly calm and life is relaxed, even for confirmed land rats on a small sailing boat like this. 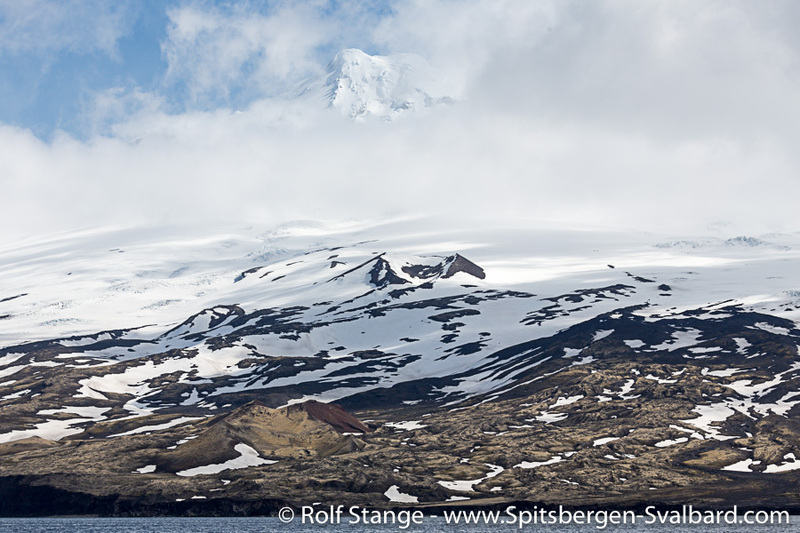 I can even do my little presentation of Jan Mayen outside, where there is less noise from the engine. 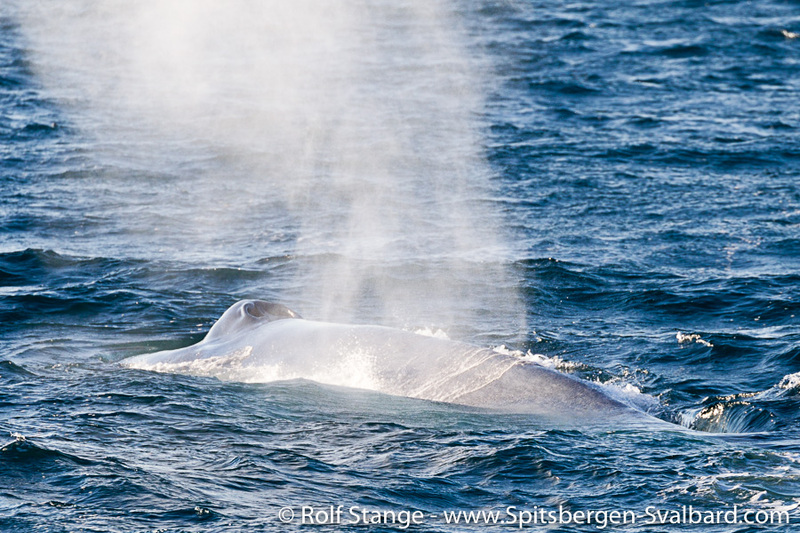 Other than that, the crossing is only interrupted by the sighting of a rare Blue whale and some occasional Beaked whales. 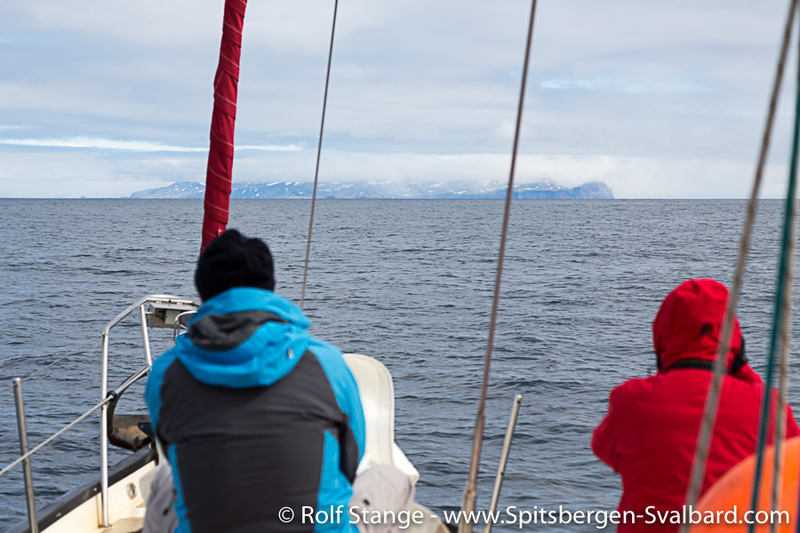 Jan Mayen is coming up on the horizon on the third day of our crossing. 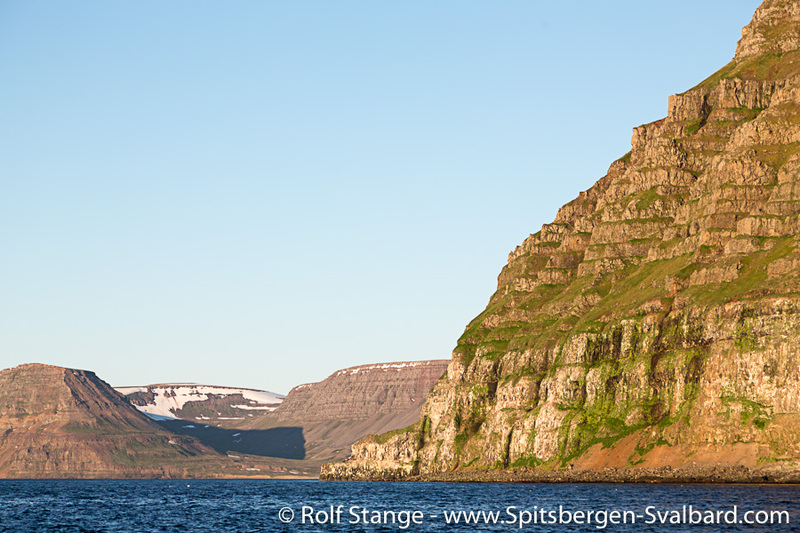 We follow the southern north coast for some hours until we reach Kvalrossbukta. 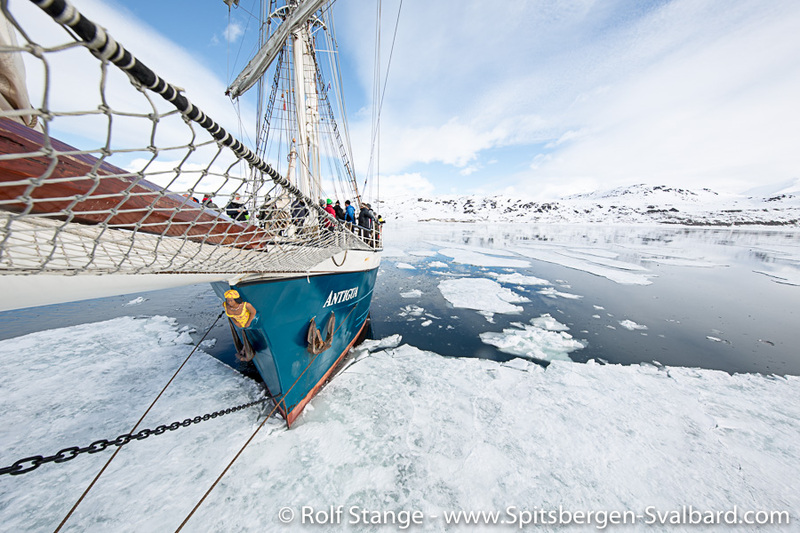 The anchor goes down after 440 nautical miles, and soon, we have established our base camp on shore. Let’s not talk too much about yesterday. A hasty goodbye to Antigua and her good people, re-organization of luggage and equipment late at night, then a day spent being tired in airports and on flights. 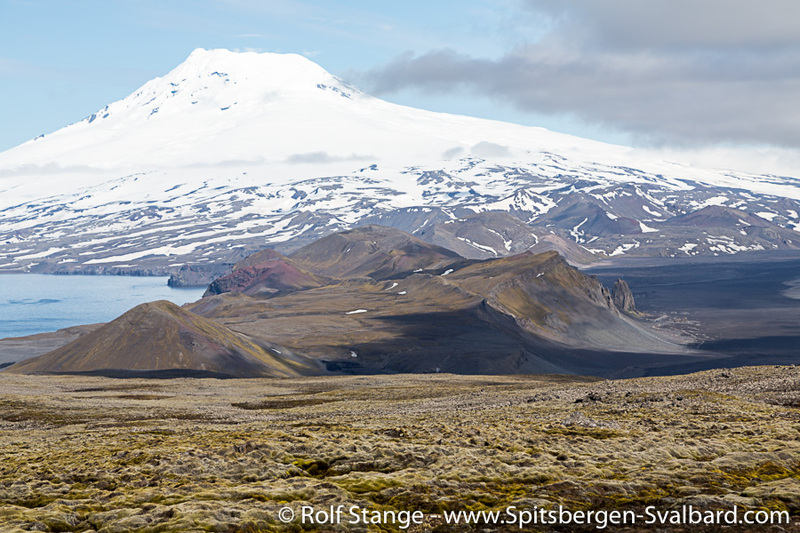 Longyearbyen, Oslo, Keflavik, Reykjavik. Who wants that? I don’t, but there is no way around it. 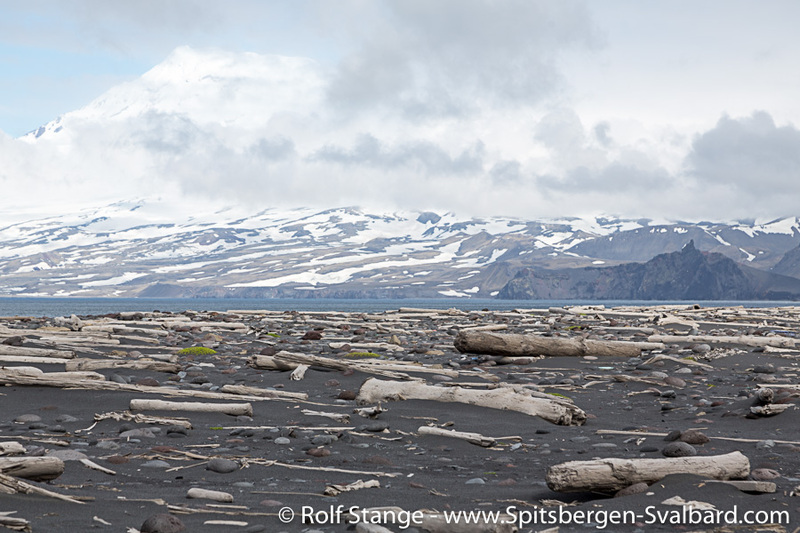 There is no train and no bus to Jan Mayen. 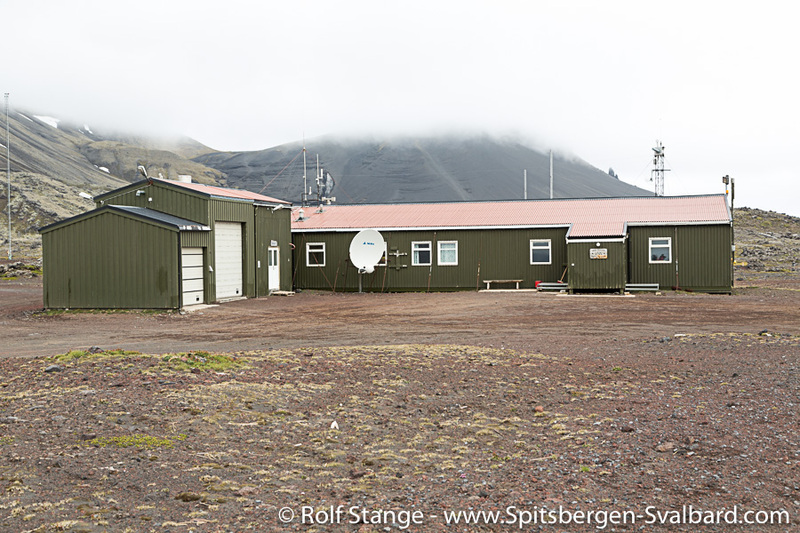 24 hours after leaving Antigua in Longyearbyen I am already in a simple guest house in Reykjavik, slowly recovering from the voyage. 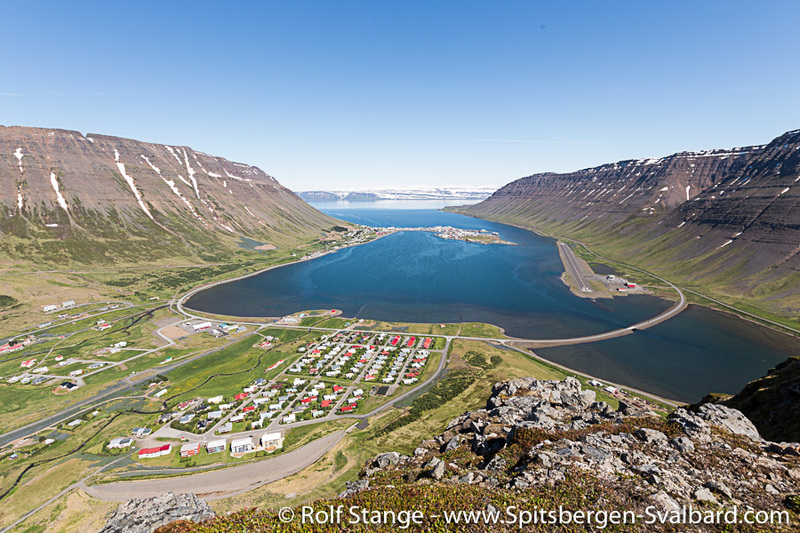 I continue early next morning with a small, but powerful propeller-driven aircraft to Ísafjörður, the metropolis of Iceland’s remote northwest fjords. Don’t expect too much from this metropolis. You have seen most of it after an hour or two. 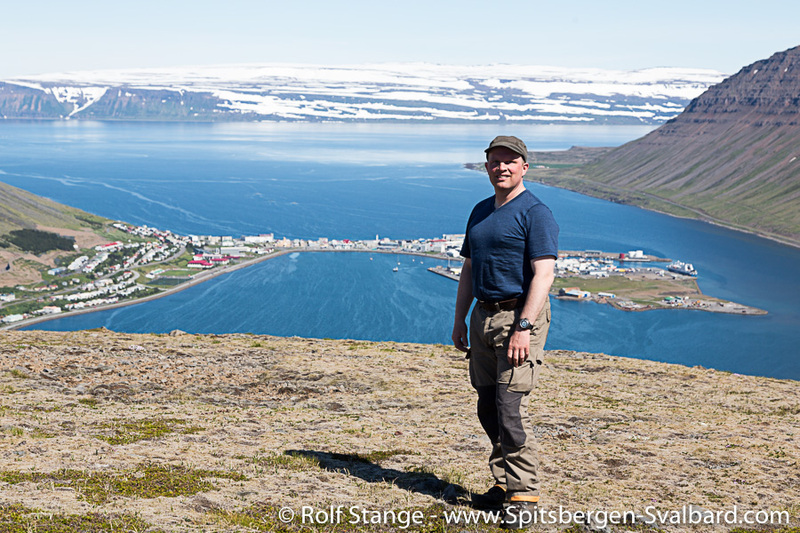 But Ísafjörður is not only our gateway to Jan Mayen, it is also extremely friendly today: the sun is burning from a cloudless sky. There is still time for a little excursion. A rental bike is quickly found, and after a little ride I start ascending the mountain Kubbi. Just a bike and hiking boots. Nothing that flies or burns fuel. Wonderful! That is fun, that is how it should be. 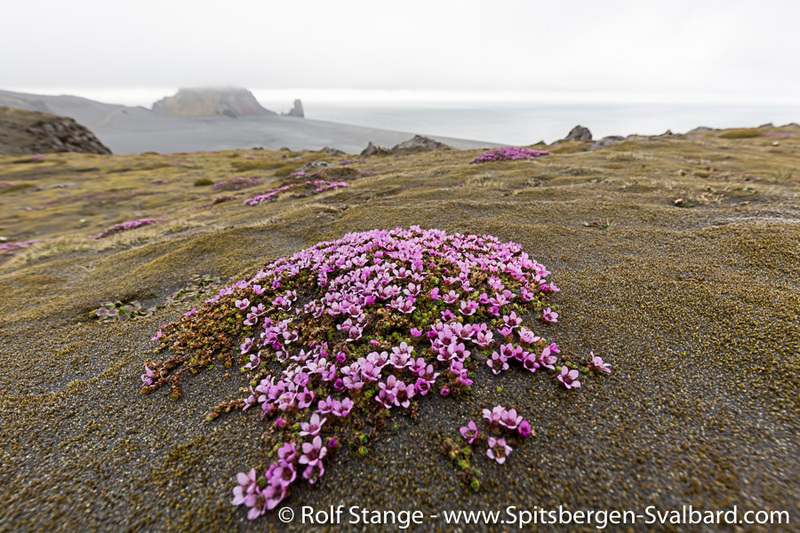 Getting a bit out of breath, fresh, unfiltered air in the lungs, sitting on arctic heather tundra a few metres high with bare feet, enjoying stunning views on mountains, waterfalls and fjords – a lot of my ideas of good life are in this. More, please! 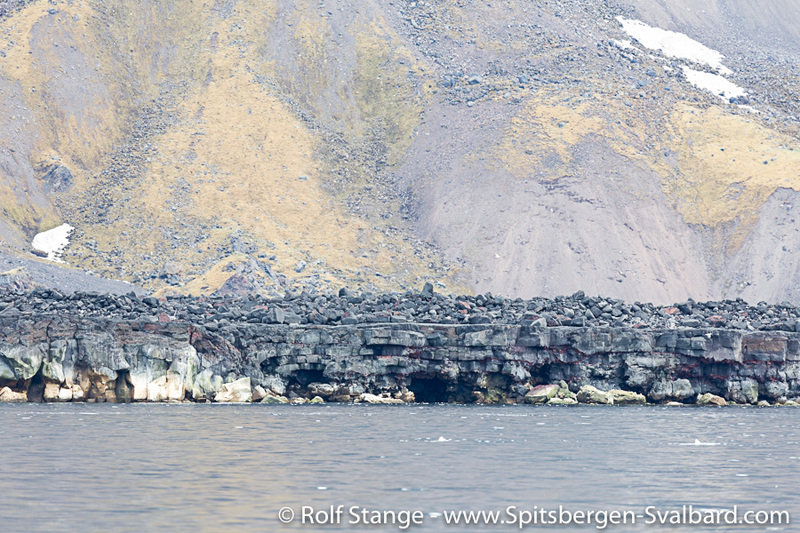 Well, there may be a lot of it in a few days’ time on Jan Mayen. 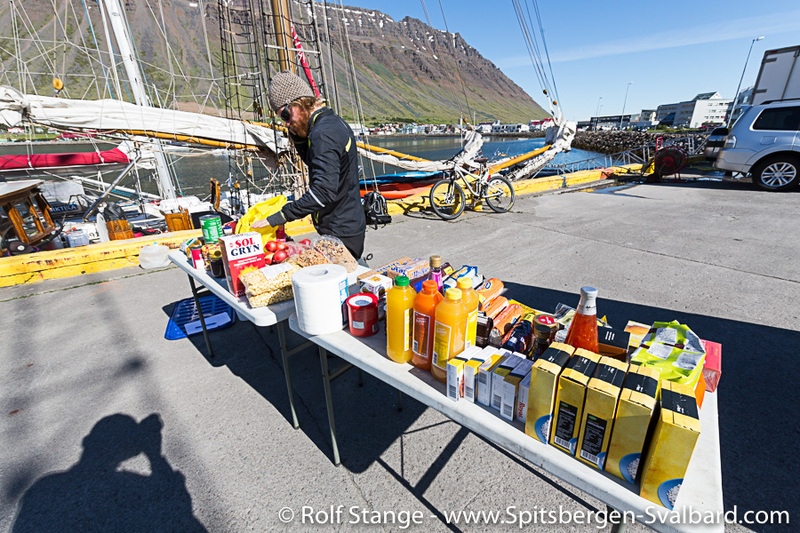 Soon some final shopping is done, the last preparation before departure involves a big plate of local fried cod. 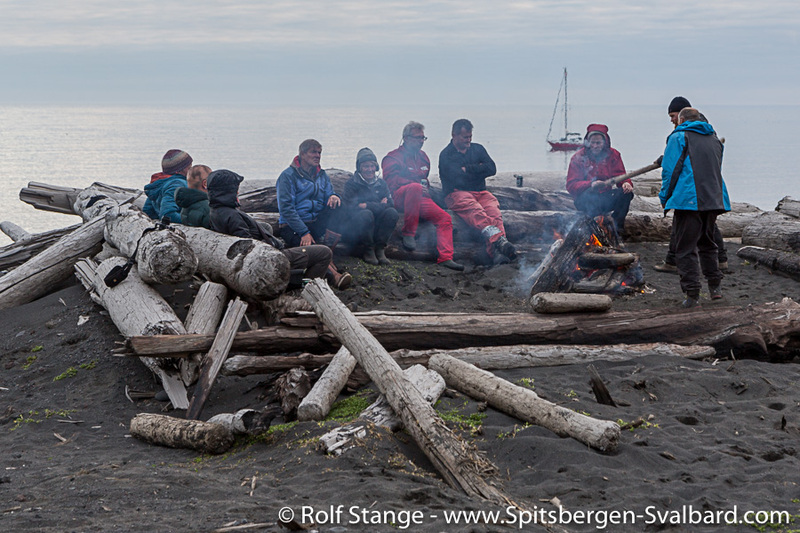 Then, a little group of 11 gathers around the table on Sigurdur’s Aurora. 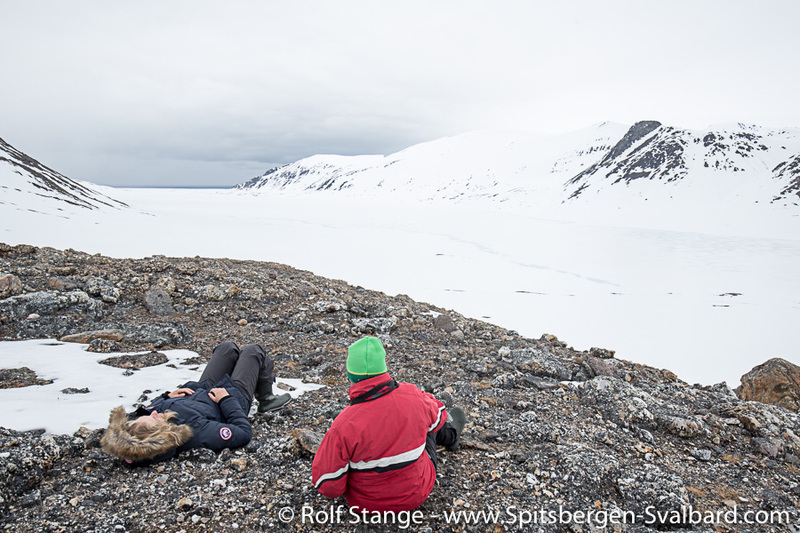 Next to the skipper himself, mate Vidar and mountain guide Magnus, all from Iceland, and me, there are Anneli from Estonia, who is attracted by remote places that are difficult to get to („you can’t get there? 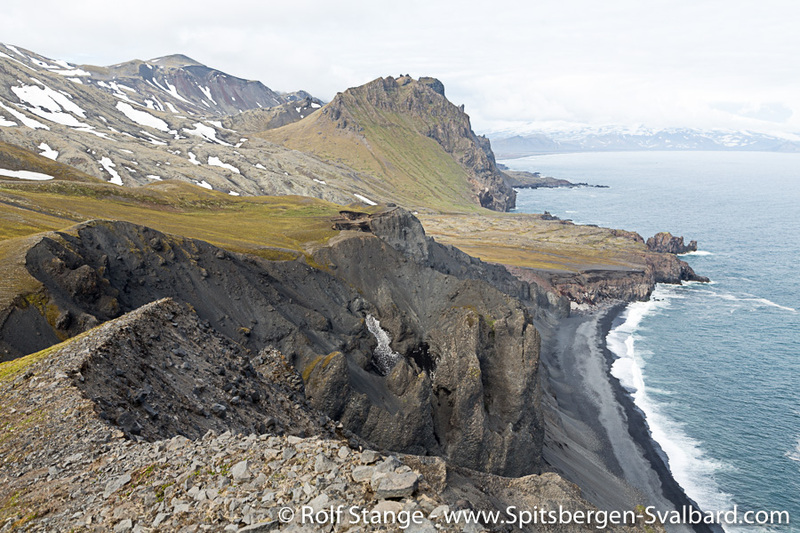 Great, let’s go there!“), Dominique from England, a friend of remote islands, Erling from Norway, who had felt a desire to go to Jan Mayen already in childhood days, Fred from America, who has recently made an impressive expedition to Heard Island, Karl, who had been with Siggi to Greenland, Marcus, who is fascinated by polar history, and Martin, who has a strong passion for the volcanoes of the world. 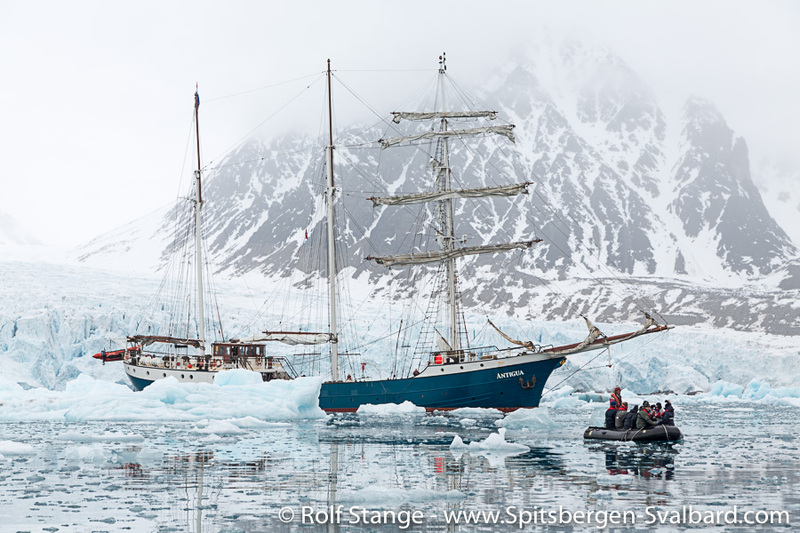 Next to Aurora, Sigurdur’s new ship is alongside, the old Bør, now bearing her new name Arktika. 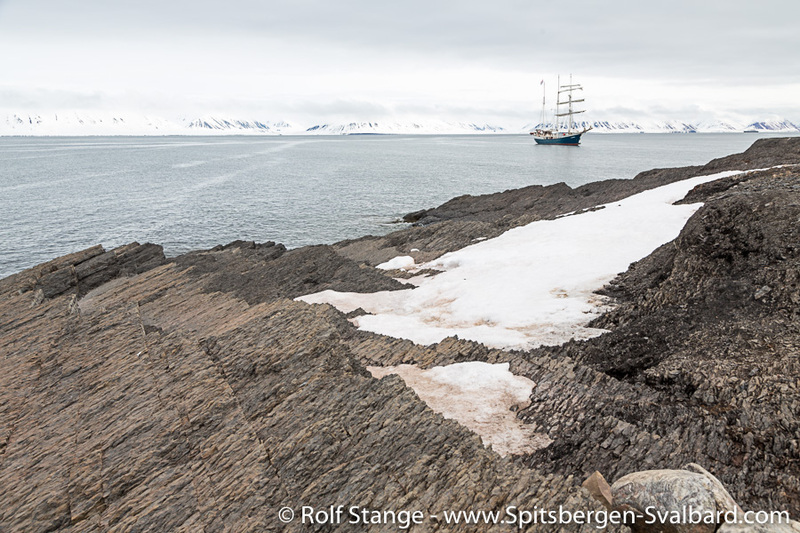 That would be a good ship for Greenland … well, now we are on Aurora, heading for Jan Mayen. The adventure begins. We have a lovely start in the nicest evening light. 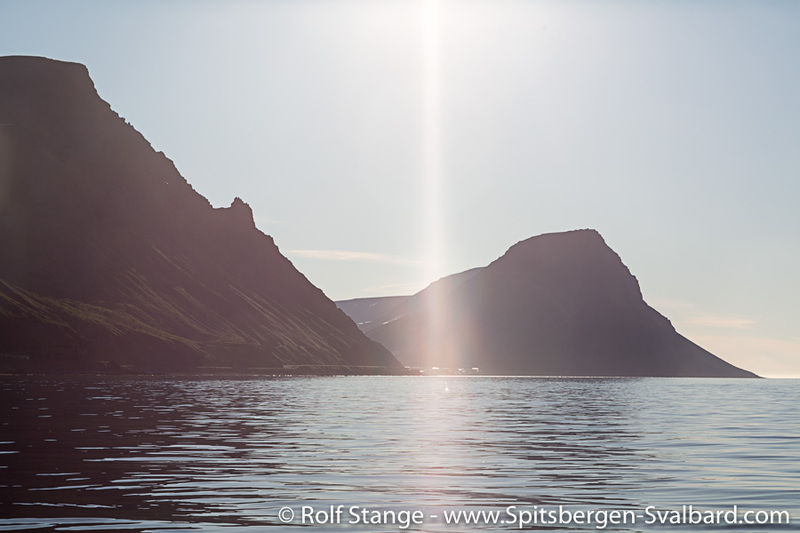 Sometimes the fjord lies calm and clear around us, sometimes a breeze from the table mountains further north pushes small waves up. 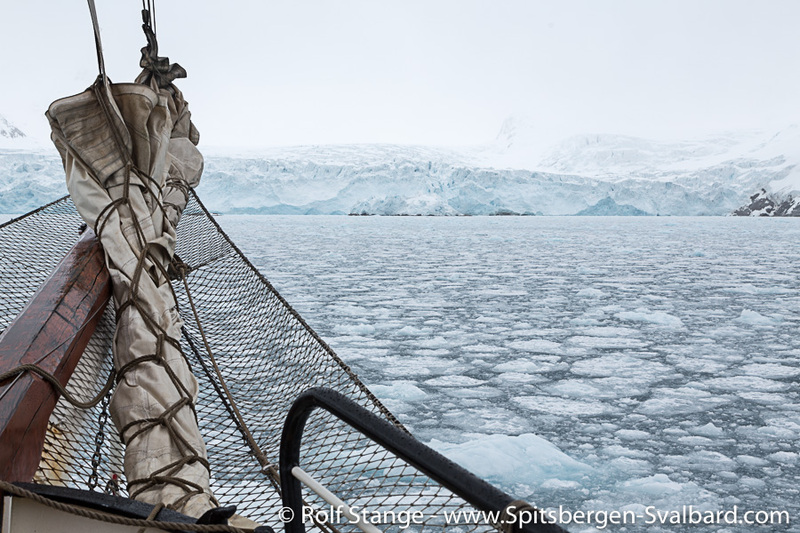 The ship is stomping into a strong wind as we surround the last capes, but it should not last too long, the forecast is fine and we should have a reasonably calm crossing. 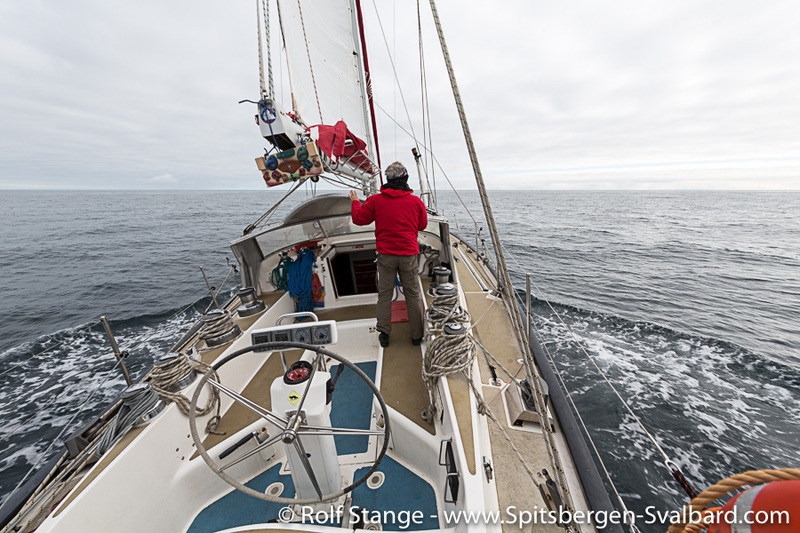 As unpleasant as the weather had been yesterday afternoon near Magdalenefjord, there was only one thing to do: put the foot down and leave the area, steaming south and towards new places, far away from the dark, low clouds. 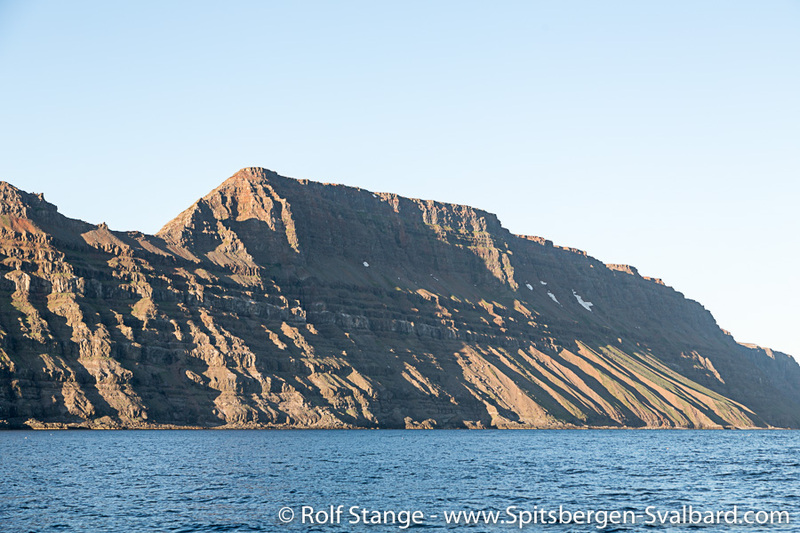 Nice scenery under a blue sky, that would be good now, for the last day of this voyage. A presentation, a film and Captain’s dinner make the afternoon go past quickly. 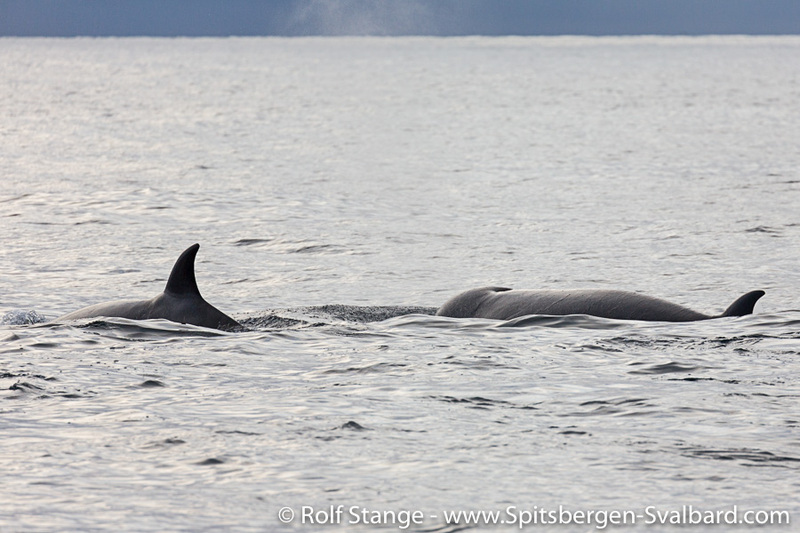 So we awoke today deep in Isjord. 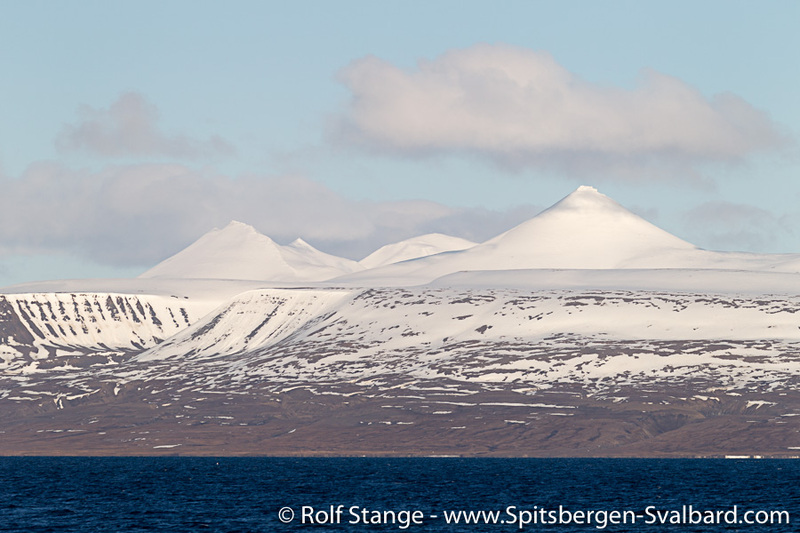 It had worked well, the impressive mountains around Billefjorden are enlightened by bright sunshine. 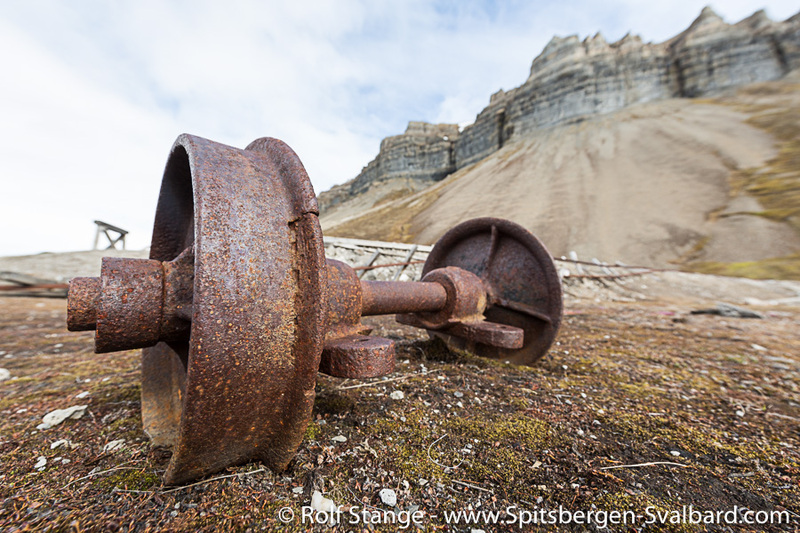 We take a walk under the fortress-like cliffs of mount Skansen, having a look at the remains of an old gypsym mine and at the remains of lagoons from the days when Spitsbergen was still part of a large landmass near the equator. A little group of reindeer is roaming the tundra close to us. 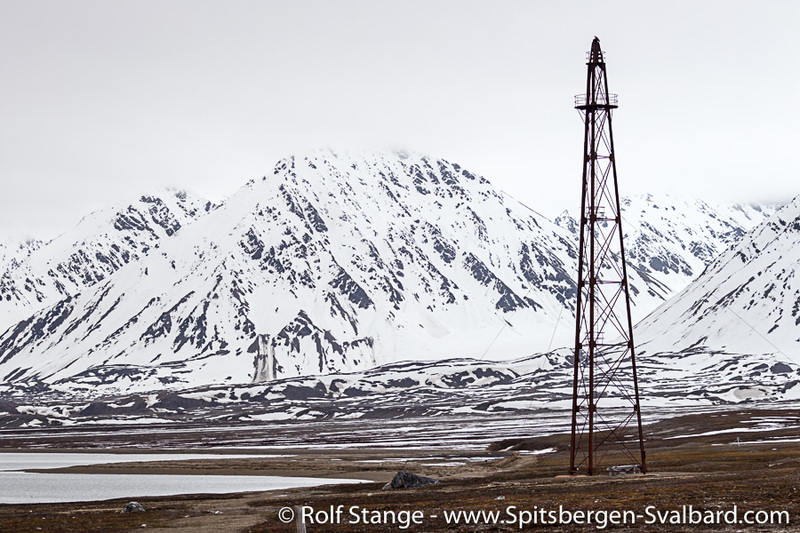 We enjoy the impressions and the surroundings in arctic silence. 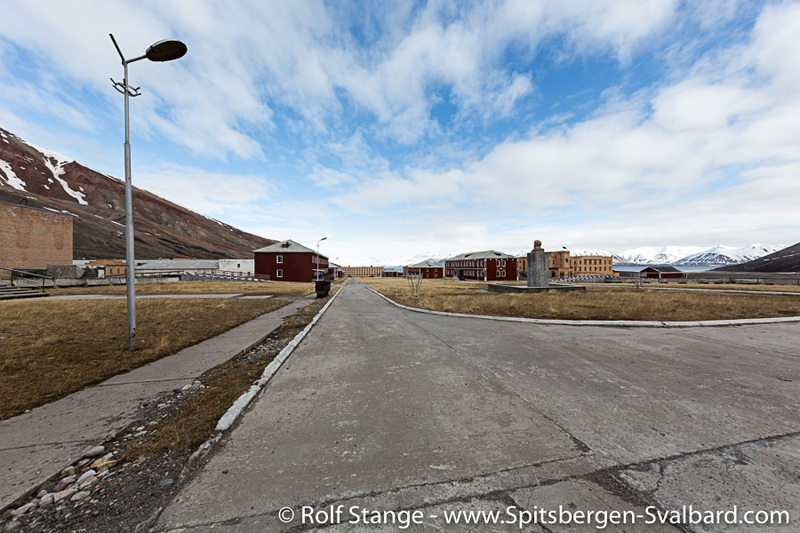 Pyramiden is also largely a silent place, but otherwise so completely different from the other places we had seen so far. 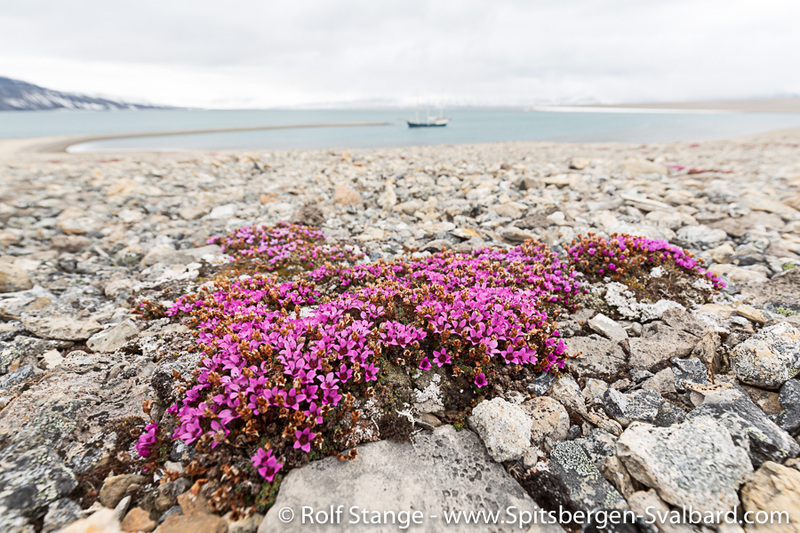 A strong visual contrast to everything the arctic had given us so far, a last place that rounds our Spitsbergen experience off to make it as complete as can be. 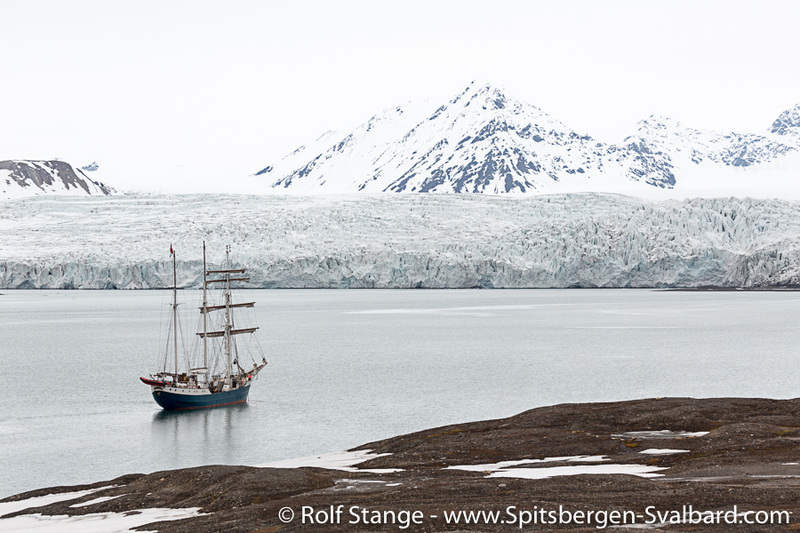 The westerly breeze had been quite lively, so we had decided to spend yet another day in Woodfjord before returning to the west coast. 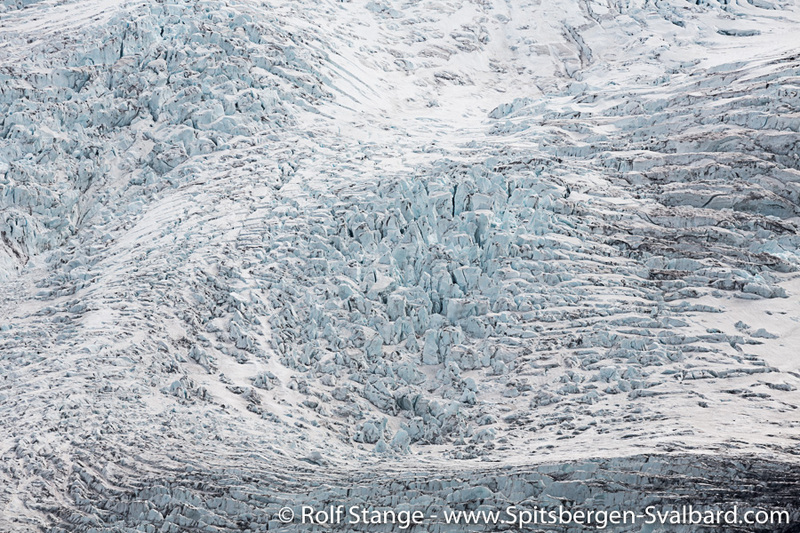 But this morning we awoke near the icy beauty of Svitjodbreen in the magnificent Fuglefjord. 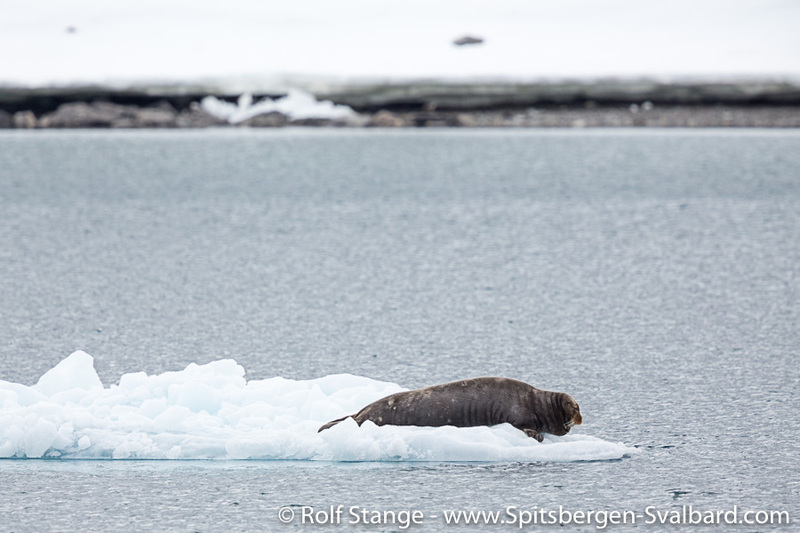 Plenty of glacier ice drifting in the water, while we are enjoying breakfast and looking out for wildlife. 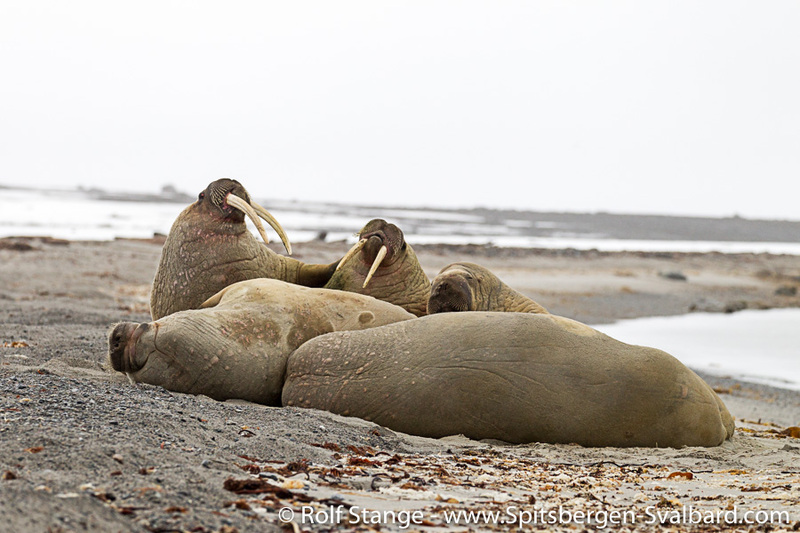 Five lazy walrusses are hauled out in Smeerenburg near the old blubber ovns, at which we then have a look, one after the other. 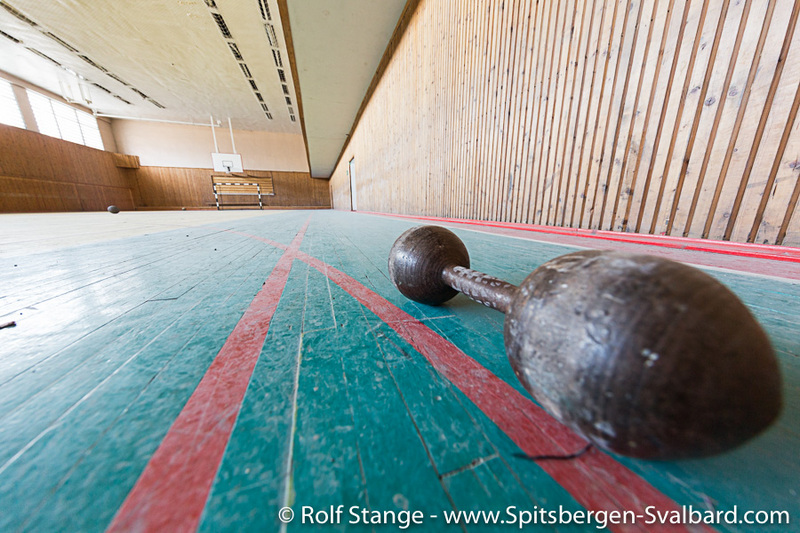 How cruel must life have been here 4 centuries ago! The whalers were wearing woolen sweaters which did not give much protection from the ever-present wind, and thin leather shoes. Even for us, in weather-proof outdoor gear and rubber boots, it is cold today! And it was certainly not warmer back then, in the 17th century. 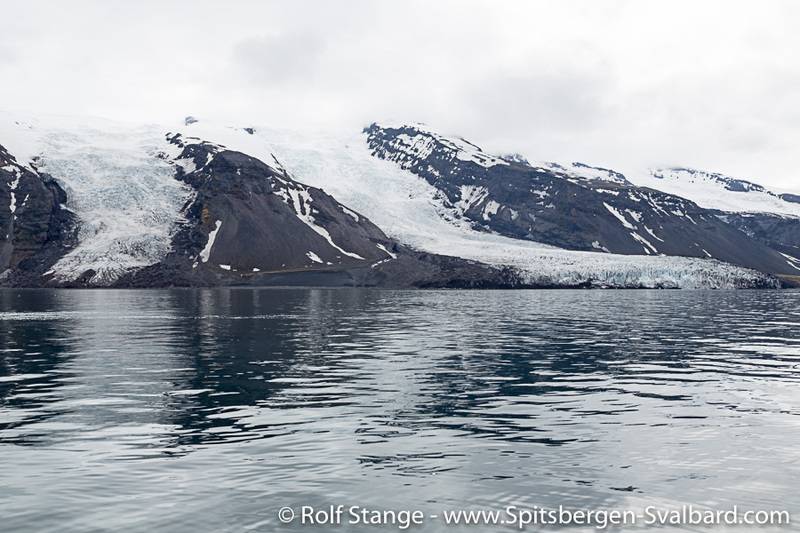 Mushamna is indeed still largely frozen – not really a surprise in early June, but remarkable considering this year’s ice conditions elsewhere. 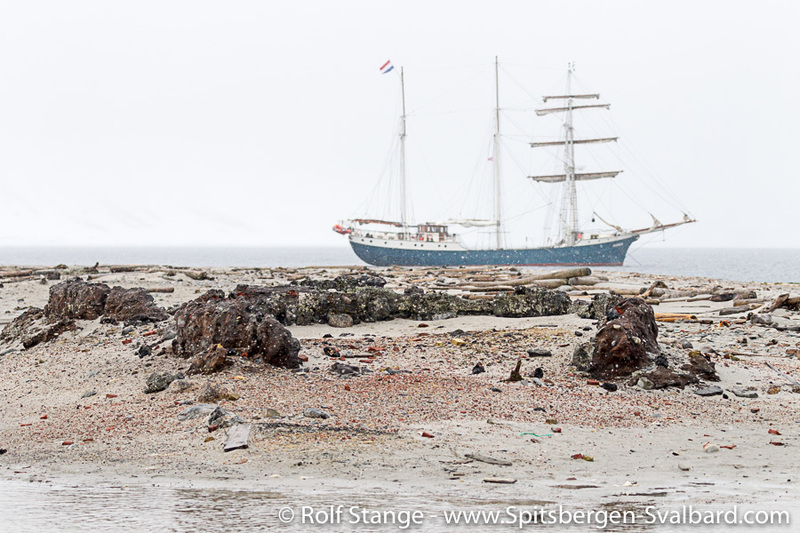 Just enough space for us to anchor safely for the night. 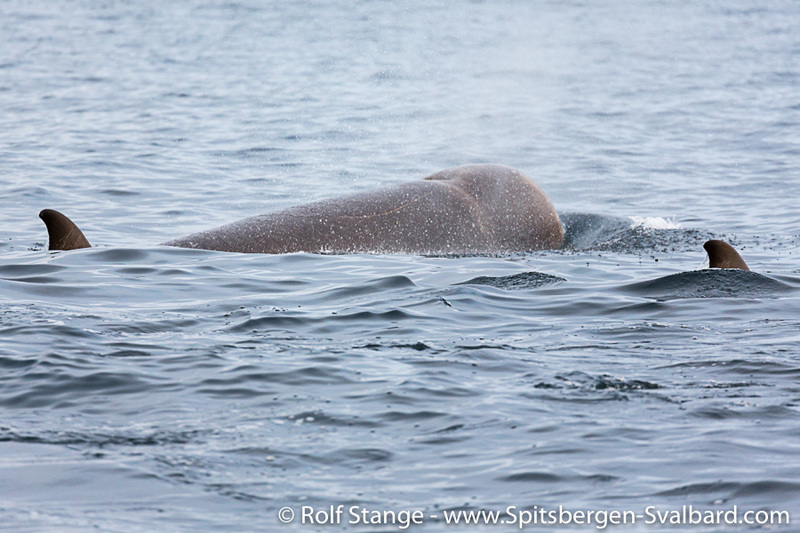 In the evening, we can hear the mating calls of the seals inside the ship as it is very silent. 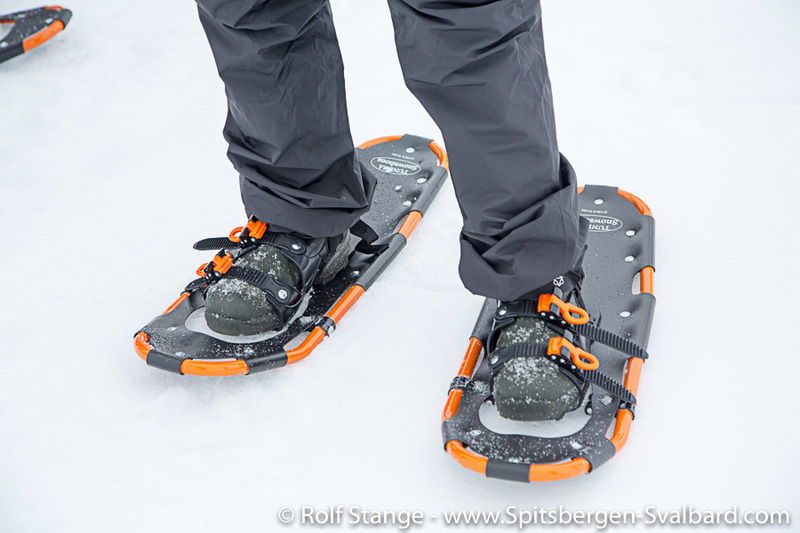 We explore Mushamna with or without snow shoes, according to taste. 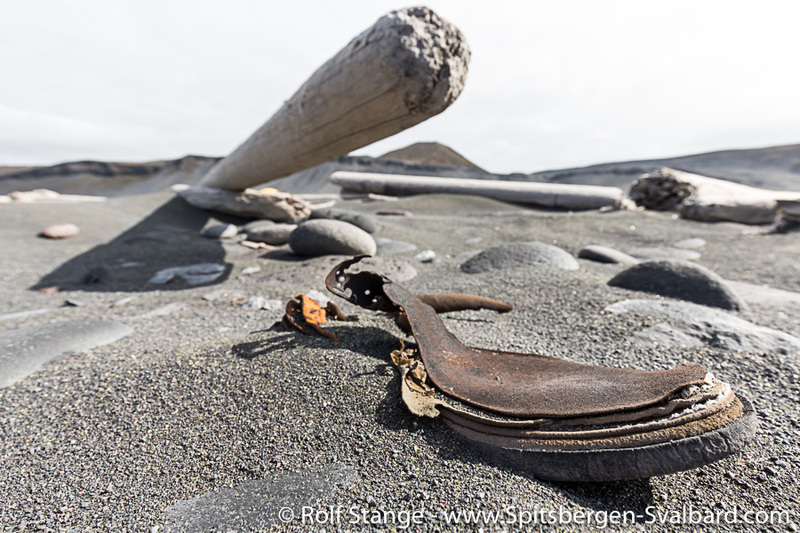 Without snow shoes, we stay near the shore, where the land is snow-free. 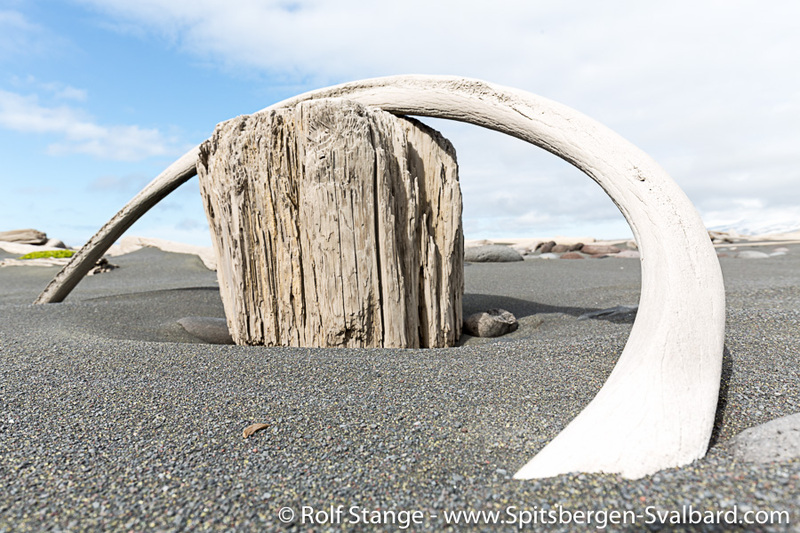 Little mental excursions take us back into the Devonian, turning the beach into a geological open air museum. 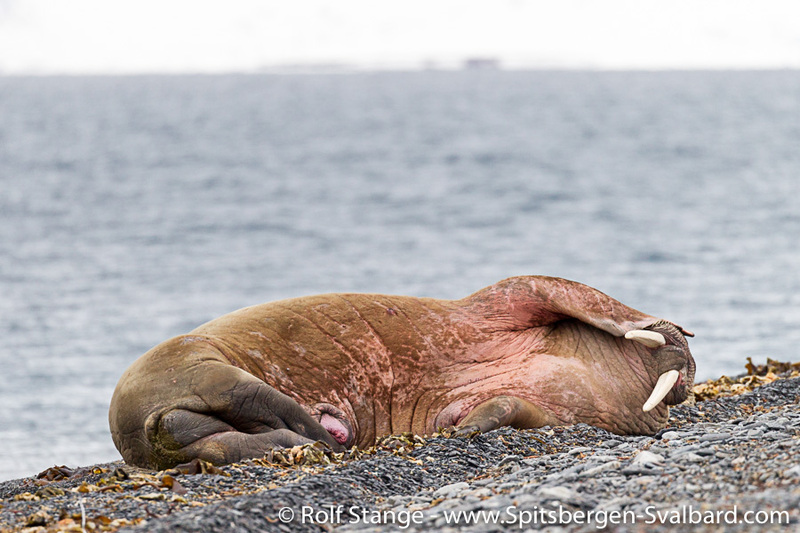 Then, a lonely walrus, quite obviously a male, attracts our attention as he is lying on a sandy spit, sleeping, scratching himself. 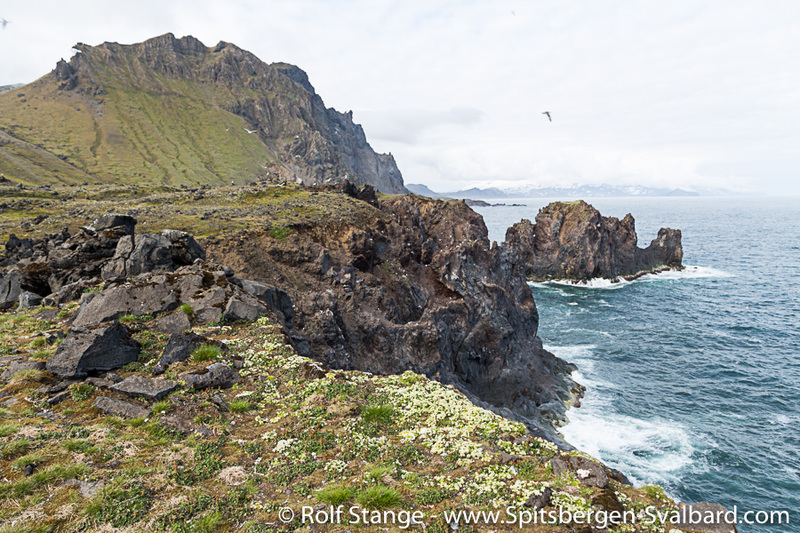 In the afternoon, the western coast of Woodfjord is the best place for us, due to the little westerly breeze. 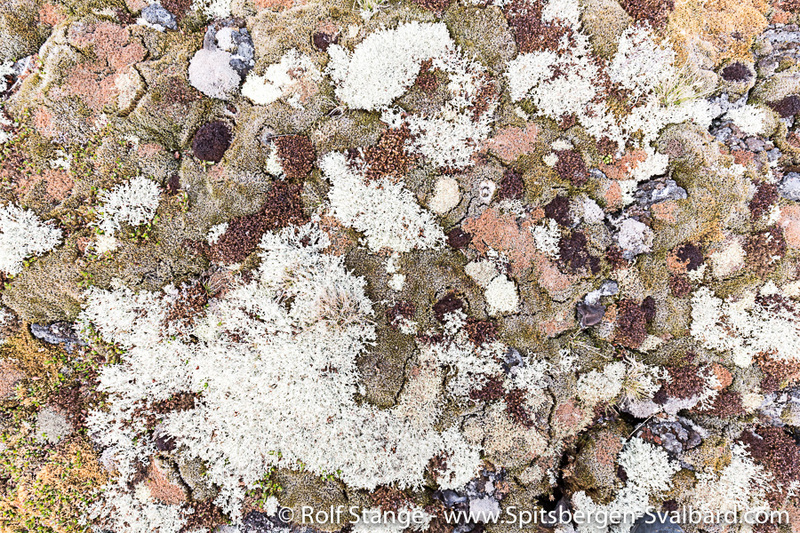 The area where Christiane Ritter („A woman in the polar night“) and her husband Hermann wanted to visit their nearest neighbour, Stockholm-Sven, a long time ago. Stockholm-Sven was not in his hut on Reinsdyrflya. Neither was there an axe. 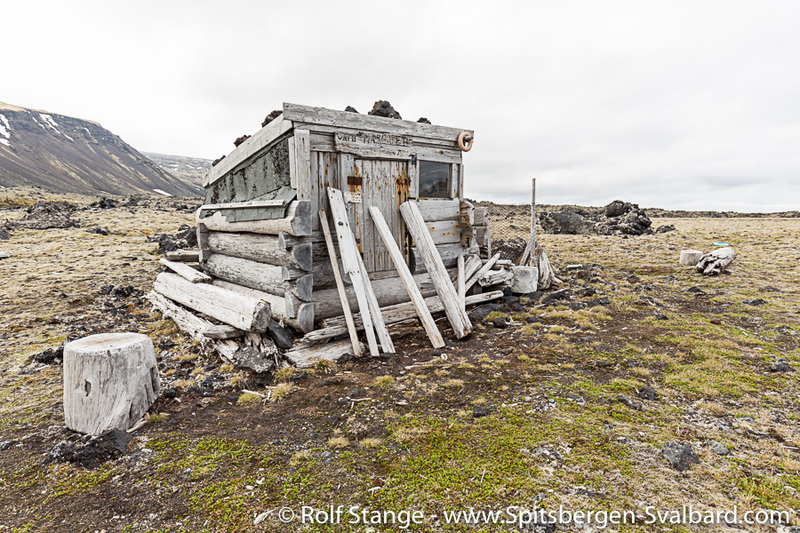 Without an axe and the possibility to make firewood, the hut might have been a deadly trap for Christiane and Hermann, had he not insisted on returning quickly before upcoming bad weather would make the return trip over the ice impossible. Life is so much easier these days, some wet feet during a snow shoe hike over the swamps of melting snow are nothing compared to that. 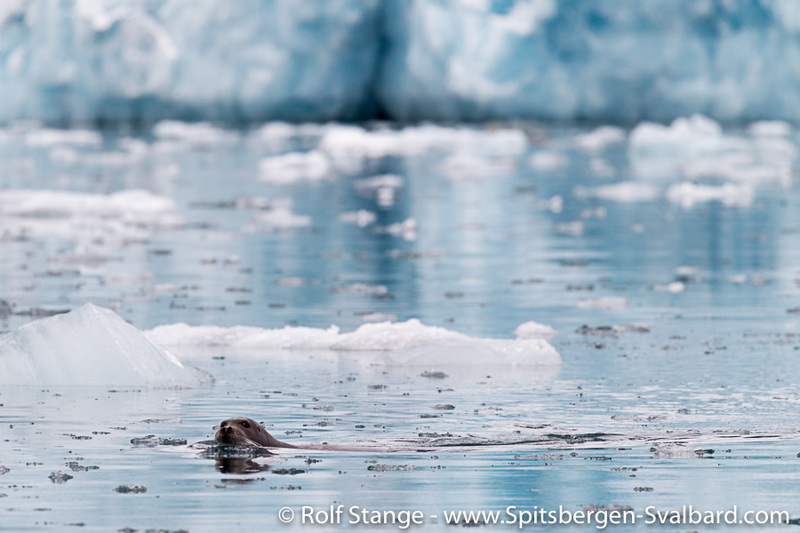 Wet snow is part of everyday life in the arctic between winter and summer. 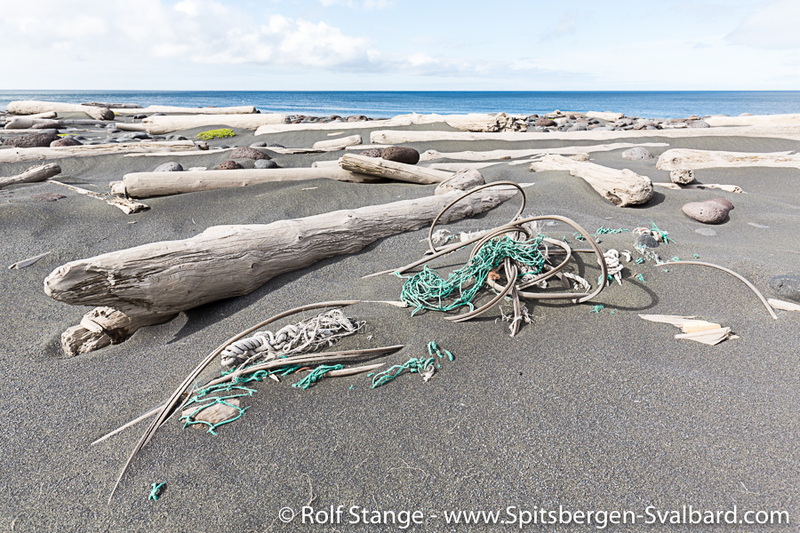 This rope network is quite certainly the largest piece of plastic garbage that we Antiguans have ever removed from a Spitsbergen beach and hauled on deck. It will probably remain the biggest one, it was on the edge of our capabilities. 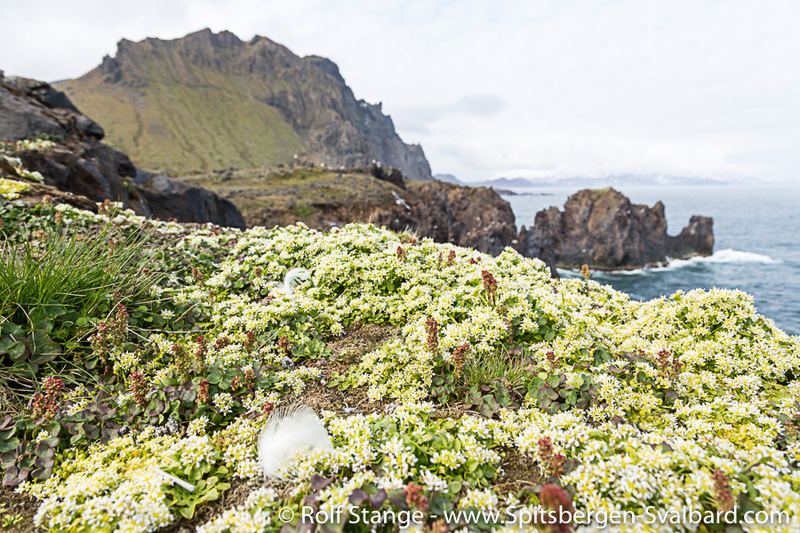 But now a large volume and weight of plastic ropes is gone, dangerous stuff for wildlife, and Spitsbergen is a good bit cleaner. 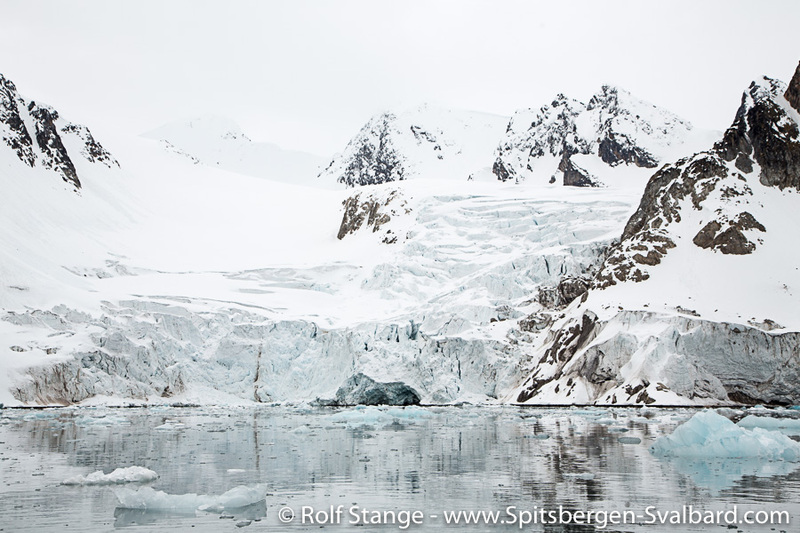 „Ice is nice“ is a bit of an understatement for the stunning beauty of Monacobreen today. Although it starts with „ice would be nice“. 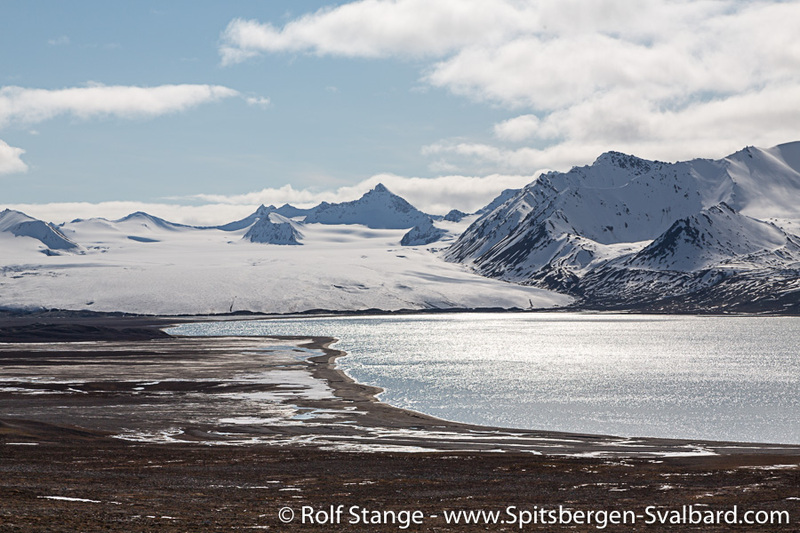 Just a few years ago, the fjord ice stretched 20 km further out. 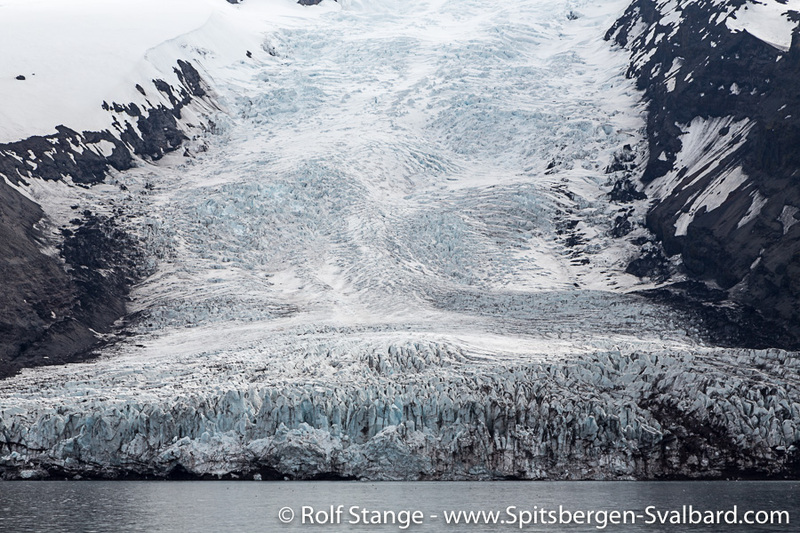 Now there isn’t the slightest trace of sea ice near Monacobreen. 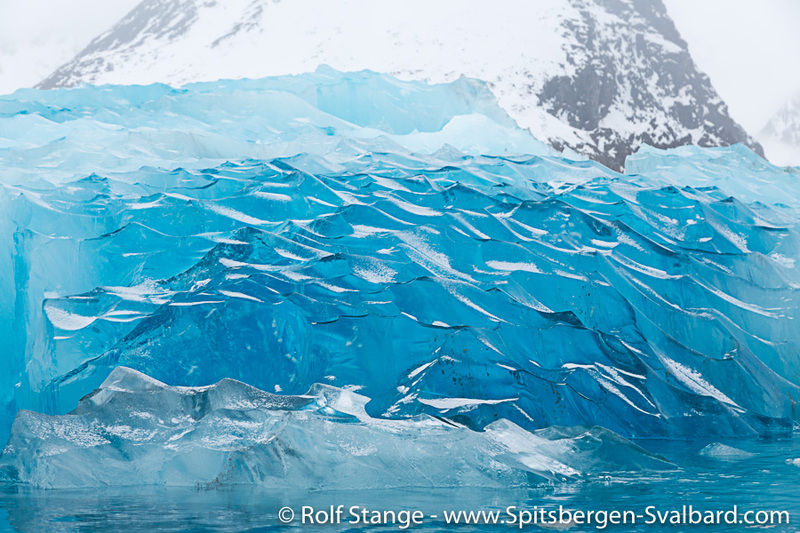 But there is glacier ice. Plenty of it, in the most beautiful colours. All shades from bright white to deep blue. 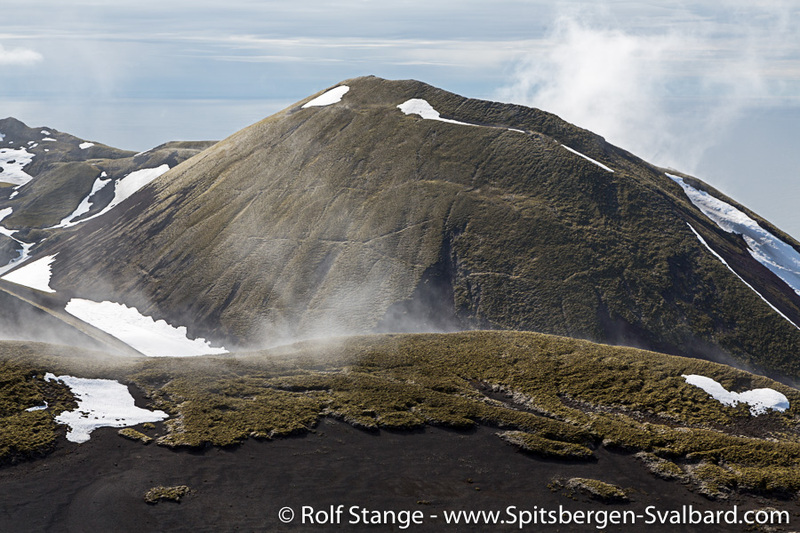 Two small islands have appeared under the retreating Seligerbreen. 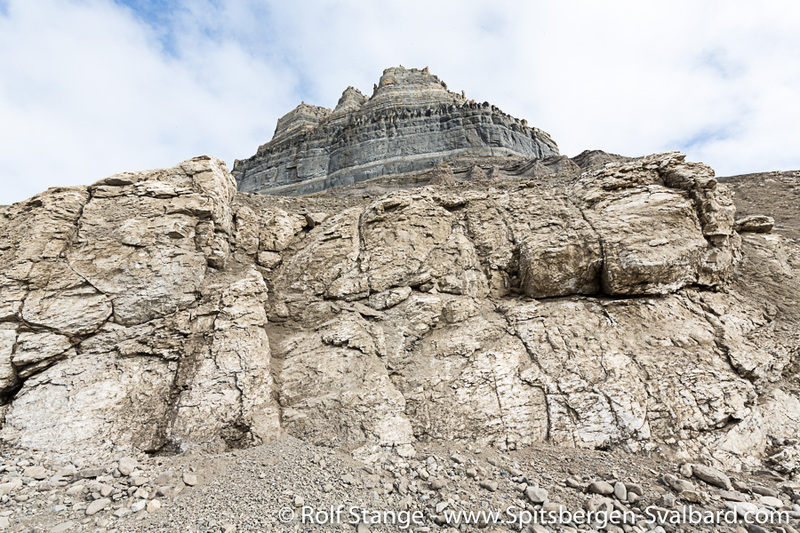 There are covered with towers of glacier ice, but the rocks are sticking out at all sides. 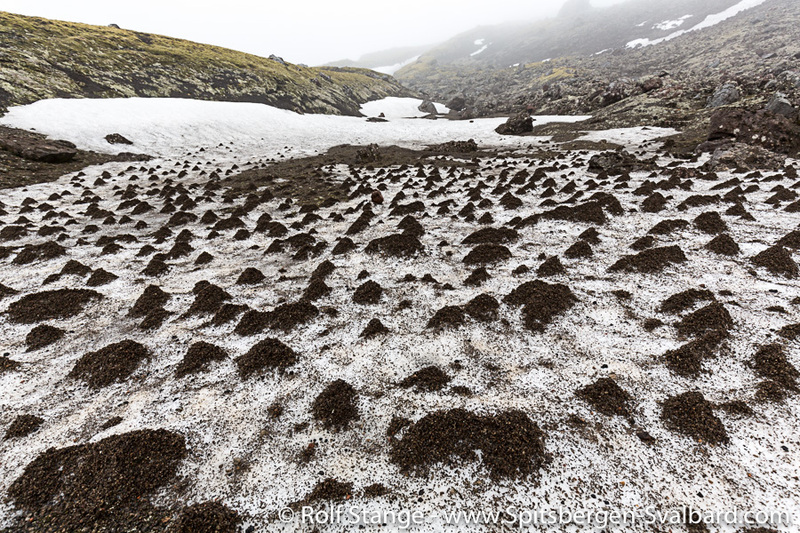 It won’t take long until we we can land on them, where everything has been buried under glacier ice just recently. 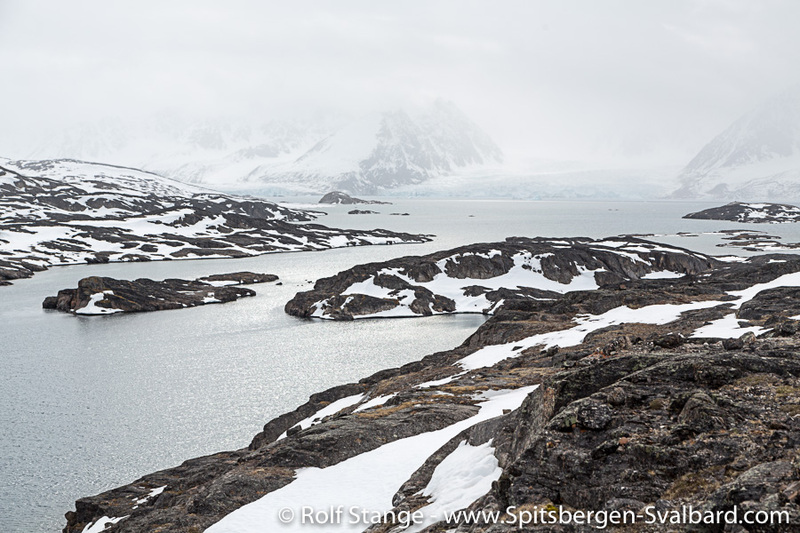 After a little hike on Lernerøyane, a landscape that reminds a bit of Greenland, and looking for polar bears in outer Liefdefjord, we are now anchored in well-sheltered Mushamna. 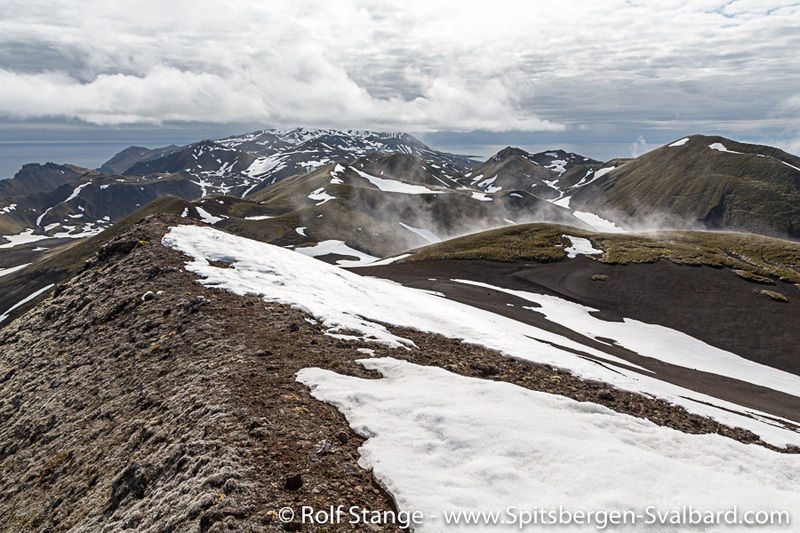 A breeze is blowing and the snow is drifting quite densely, arctic winter is in the air. See what tomorrow brings. 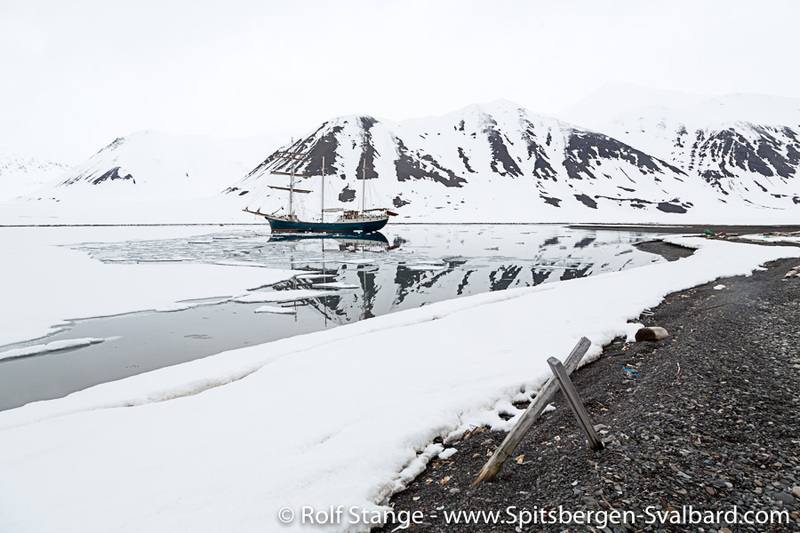 Hamiltonbukta is a bit of Spitsbergen in a nutshell. 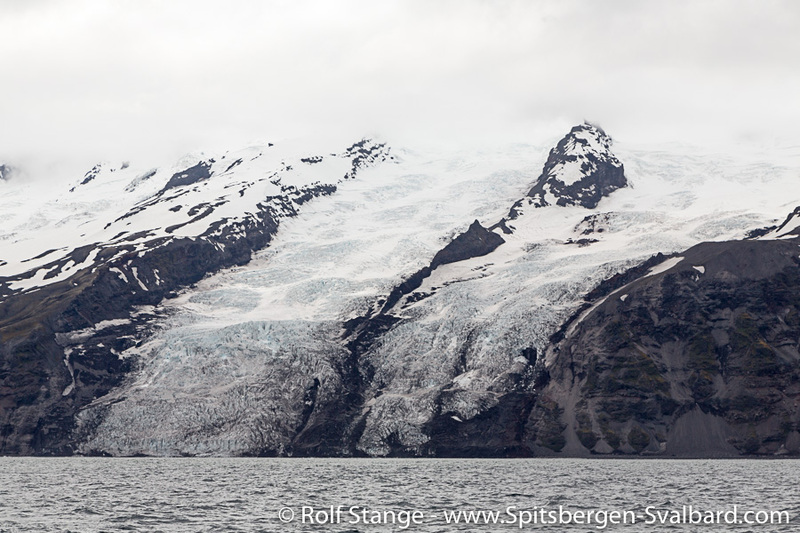 Jagged mountains, wild glaciers, busy bird cliffs – (almost) everything you could ask for. Lots of fresh polar bear tracks in the snow. 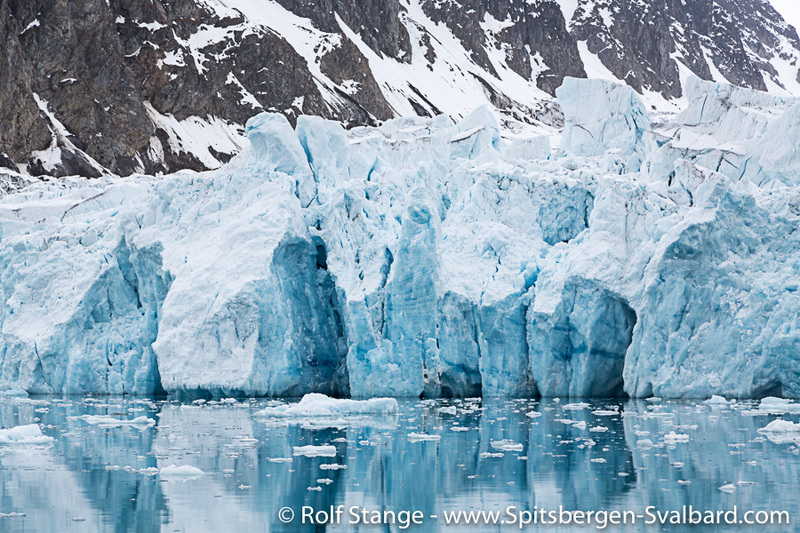 There is still fjord ice deep in Ayerfjord. Some seal are basking in the sun. As a novelty, we have got snow shoes on Antigua now. 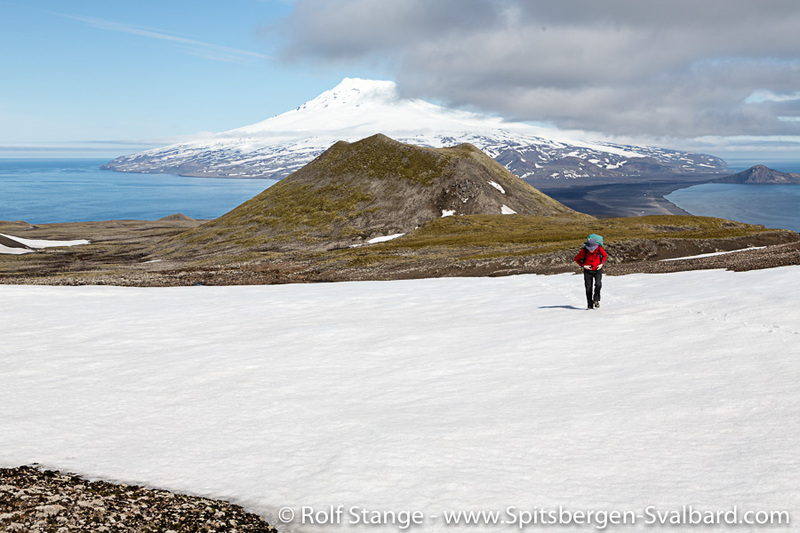 Walking in deep snow can be quite tough this early in the season. But it is great fun with snow shoes. As mentioned before, we are starting on a high level. 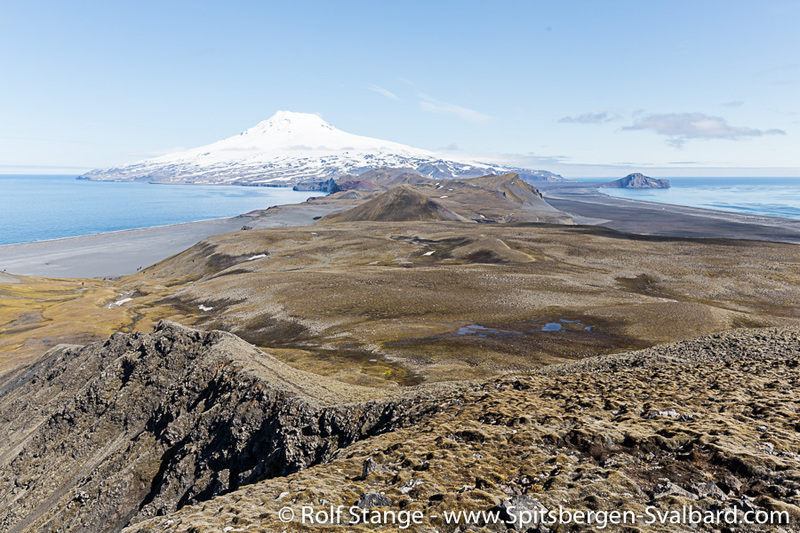 The good weather stays with us, so we can make our first tundra experience in Engelskbukta in bright sunshine. The reindeers have very small, young calves, they are of course shy. 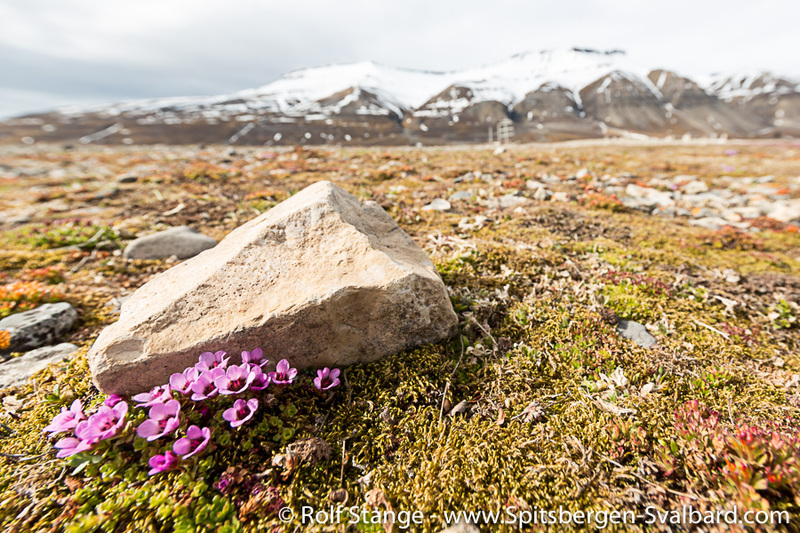 Snow buntings are singing, purple sandpipers are piping, ptarmigans are making their noises, the sun is warming us and life is good. A whaler is guarding the silence in his grave. 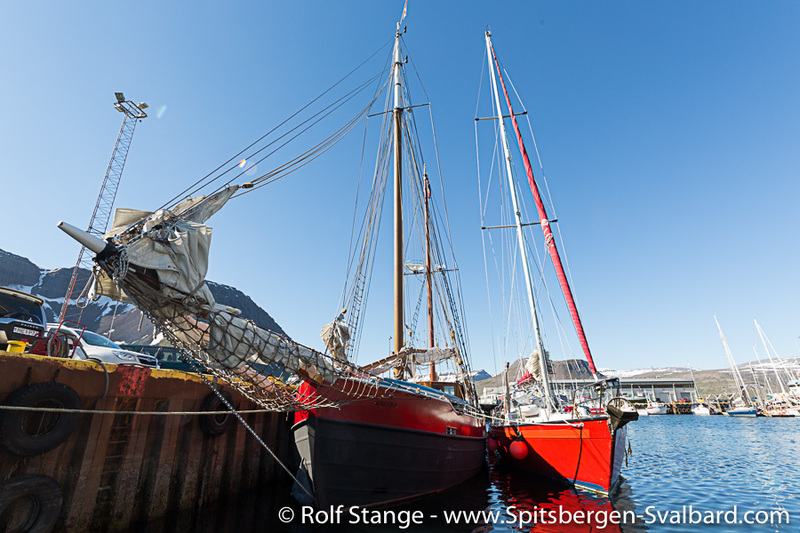 The northerly wind is calming down during the afternoon, which makes going alongside in Ny Ålesund easier than expected. 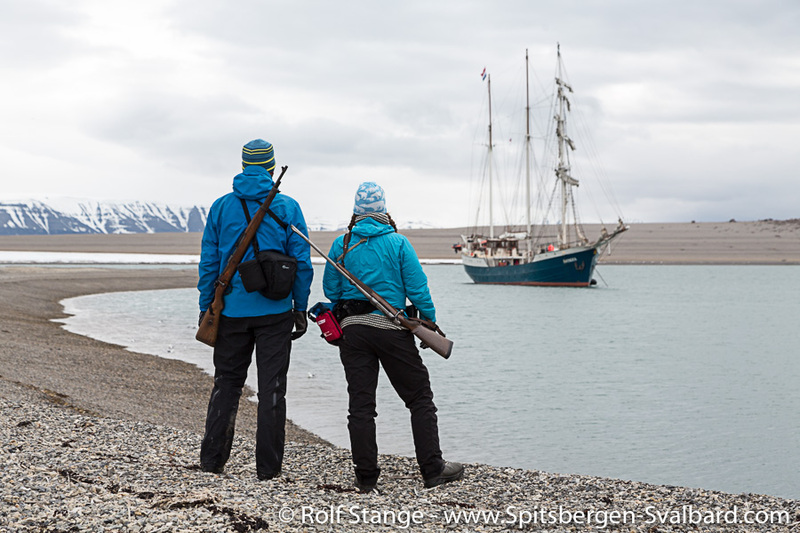 As usual, we take a little walk through the northernmost settlement of the globe, having a look at its past and present. Of course we do the little pilgrimage to the famous airship mast. 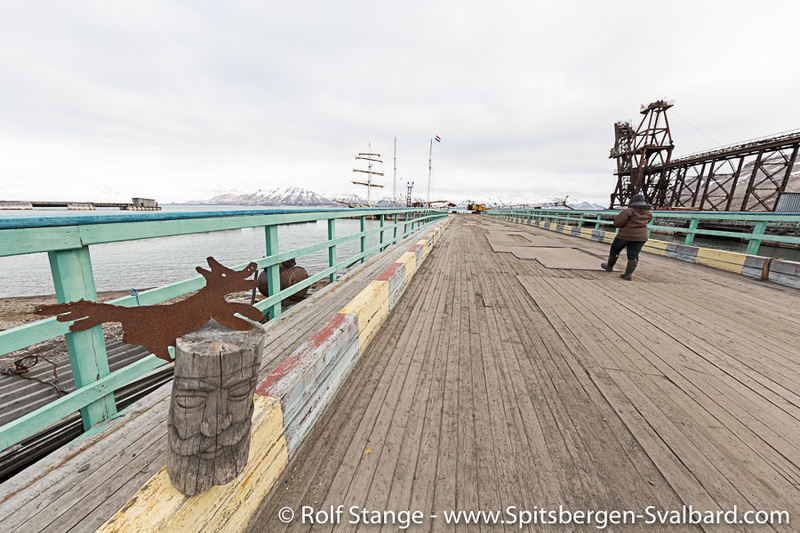 A reindeer almost joins the group while I am telling the stories of the north pole expeditions of the past, and a very friendly polar fox comes to say goodbye as we are leaving Ny Ålesund for this time. 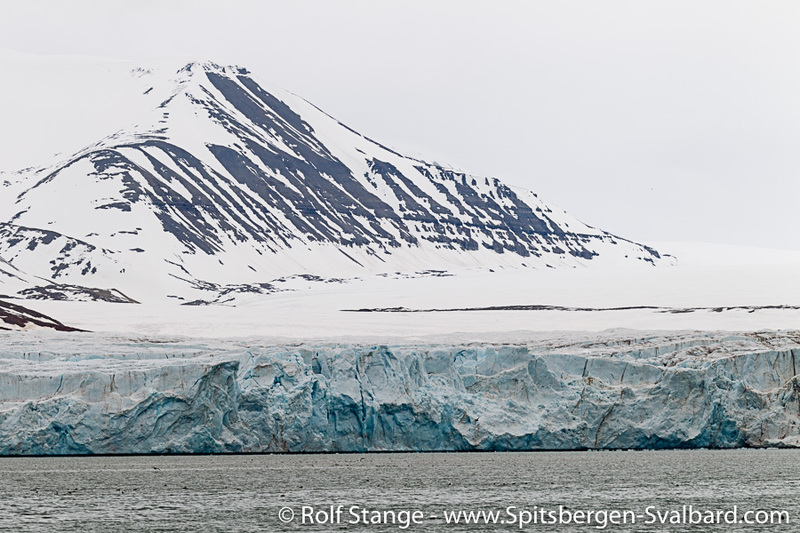 Two days in Longyearbyen are never enough time, and it is actually even less time, but a to-do-list long enough for a week. But it is finally done, with a little help from kind people. 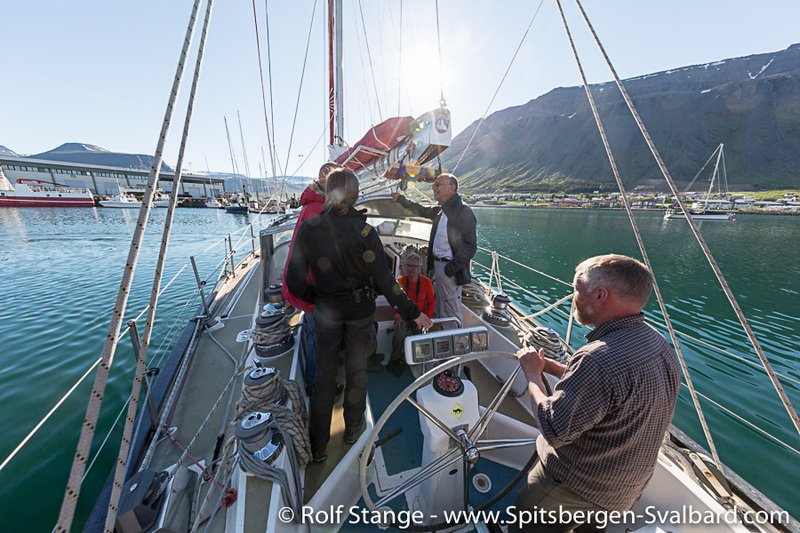 The evening BBQ with crew and friends on the Isfjord coast, with a great panorama view, is more than adequate compensation. Already the last day of this trip. Unbelievable how quickly more than 1000 miles go by. 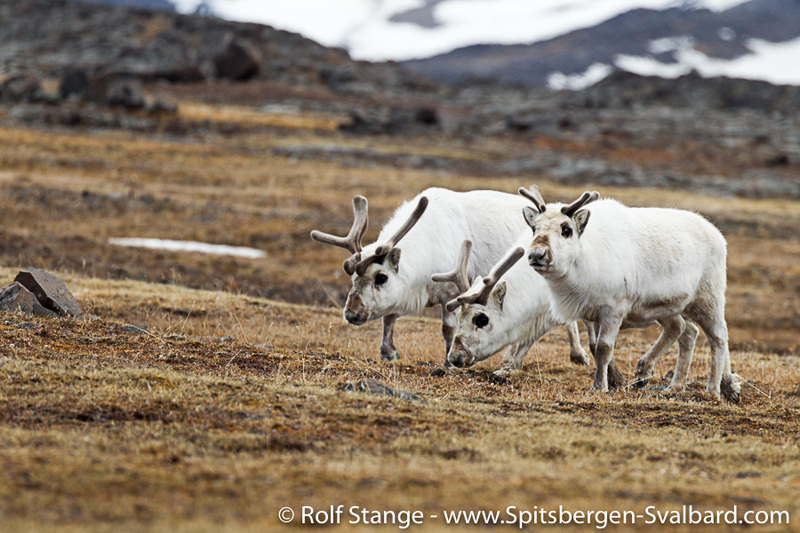 The fine tundra on Diabasodden – just weeks ago the scene of a memorable polar bear encounter – is home to rather curious reindeer who approach us repeatedly. 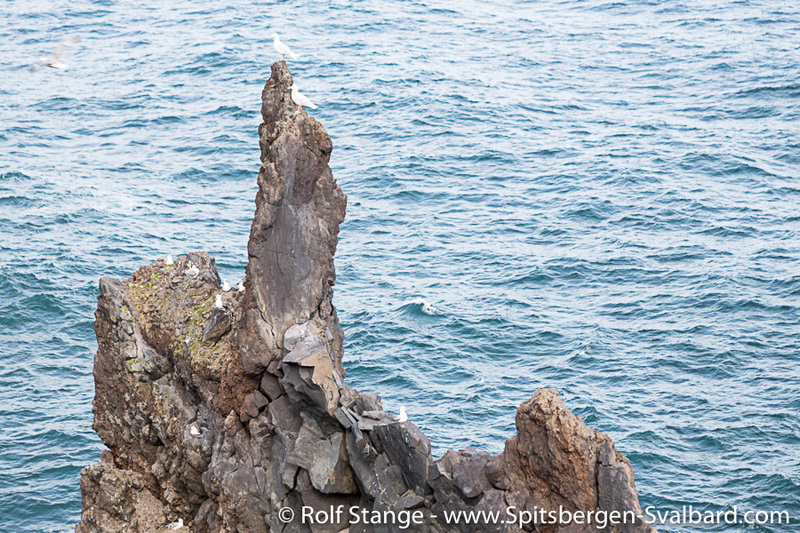 That is how it should be, not the other way around Barnacle geese and Brünich’s guillemots are sitting on the steep basalt cliffs, a ptarmigan is on lookout on a rock, somewhere a fox is looking for prey. 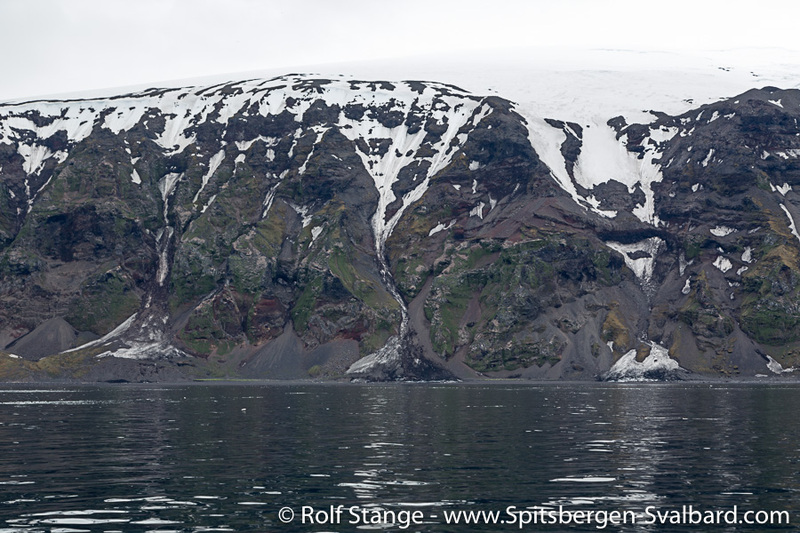 Beautiful Tempelfjord is the scene for a final scenic cruise (admittedly, we are also still looking for a polar bear, but wherever they currently are, we don’t know …) before a last little landing, with scenery, some natural history and arctic silence, rounds the trip off. So that was May, and now it is already June. But it looks like early July. 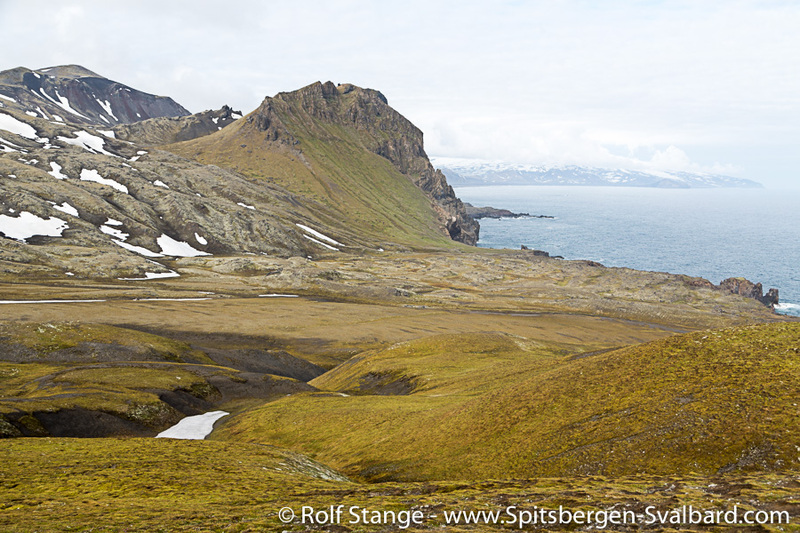 There is not too much snow left, wide tundra areas are already free of snow, especially on the west coast. 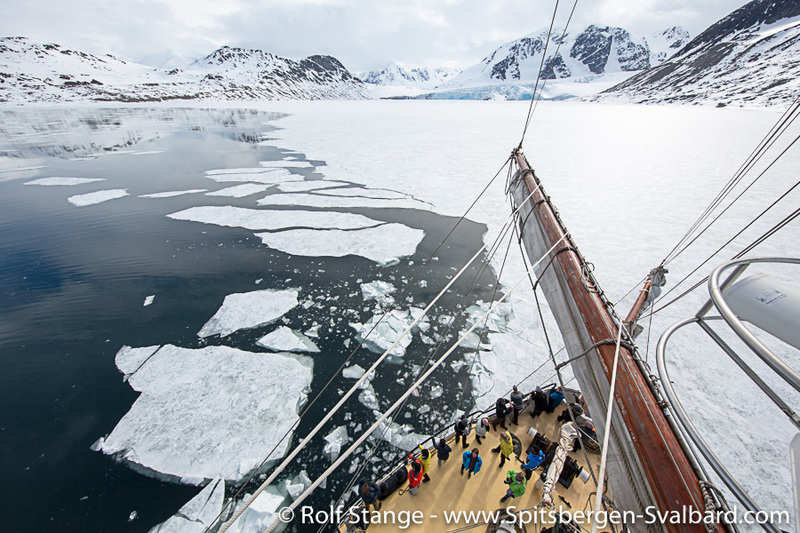 The ice chart looks like late summer. And outside it looks like Irkutsk or something that way. 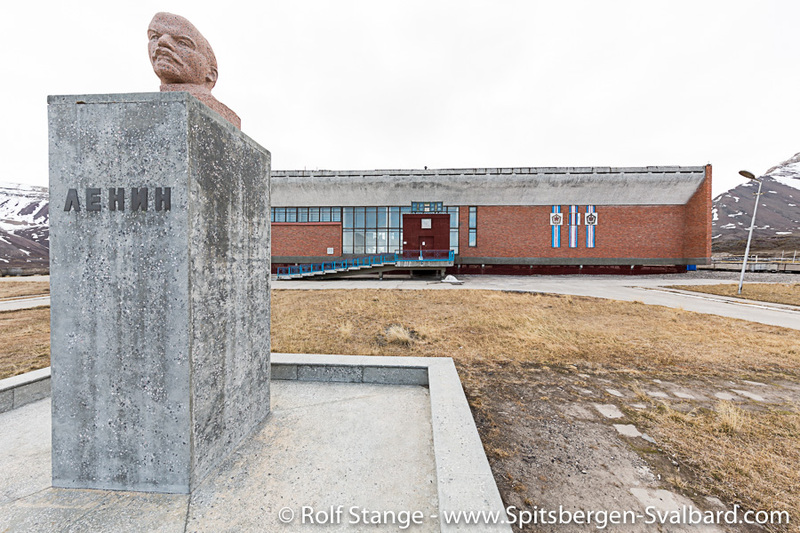 That is, of course, Barentsburg. What else! 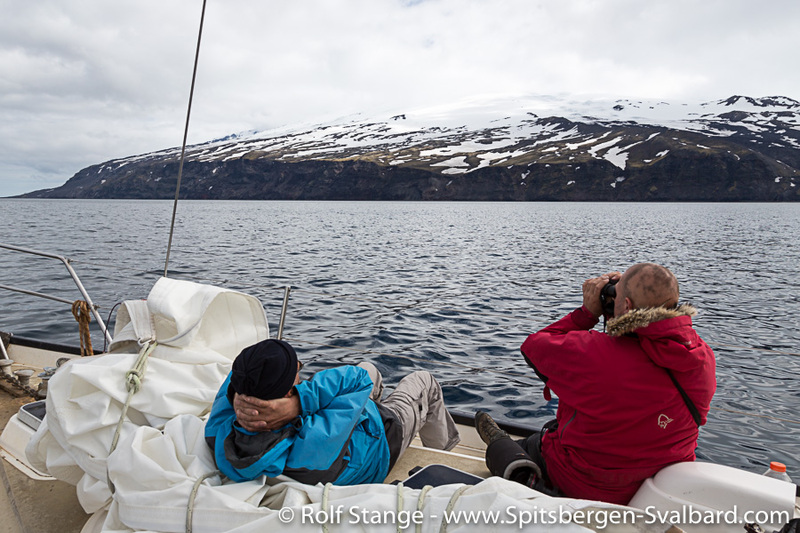 We spend the early afternoon cruising several bays, looking for scenery (great landscape everywhere) and polar bears (none), before we celebrate the trip duly. 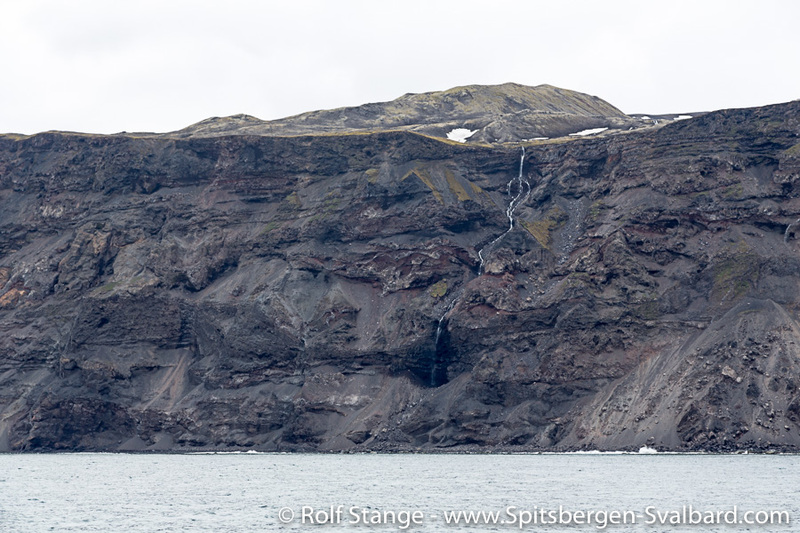 It has been – and still is – great, even without a polar bear sighting.